Cast of characters: A pictogram of a family tree might be easier but here it goes . . .
Firefighter Tim – nephew and special thanks to him for all his planning work! Nurse Amanda – Mike F’s girlfriend aka "Princess Highlights"
We checked in for our flight and printed our boarding passes the night before. We are traveling with my sister Ann and our niece Samantha. We woke up at 2:50 AM. Scott our brother-in-law picked us up at 4 AM with Ann and Samantha in the car. It was a quick drive to Newark for our 5:55 AM flight on JetBlue to Orlando. The line to drop off bags was long, but the security line was not. The full body scanners seemed to be set on sensitive as I was frisked both coming and going. Cargo shorts may not be best thing to wear. They started to board early at 5:15 AM and we pushed back from the gate at 5:48. Out JetBlue plane name was Bravo Lima Uniform Echo, spelling out Blue in the NATO phonetic alphabet. We landed on time. 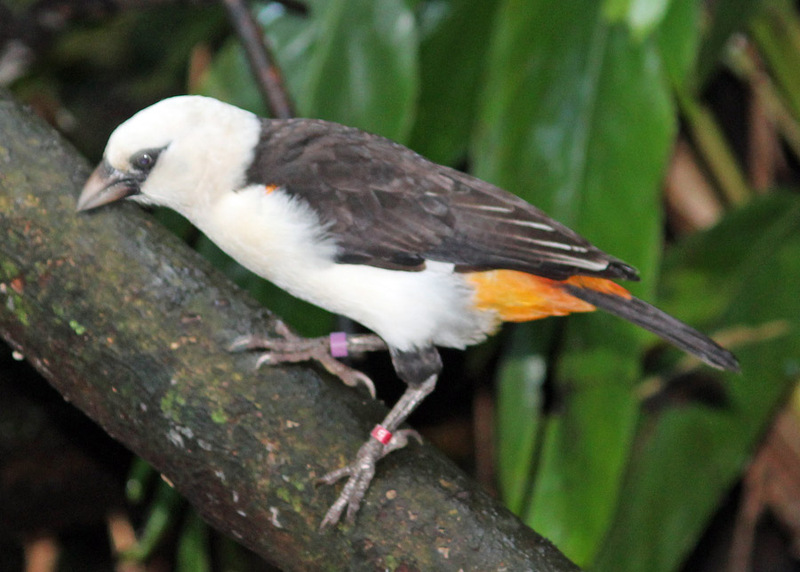 Kelli and I try to guess what bird we would see first. She guessed Snowy Egret and I a Great Egret. Kelli guessed correctly as a Snowy Egret was seen while taxiing to the gate. We shopped in both the Disney and Universal stores at the airport so that we could meet up with a few of the 25 flying in just behind us. 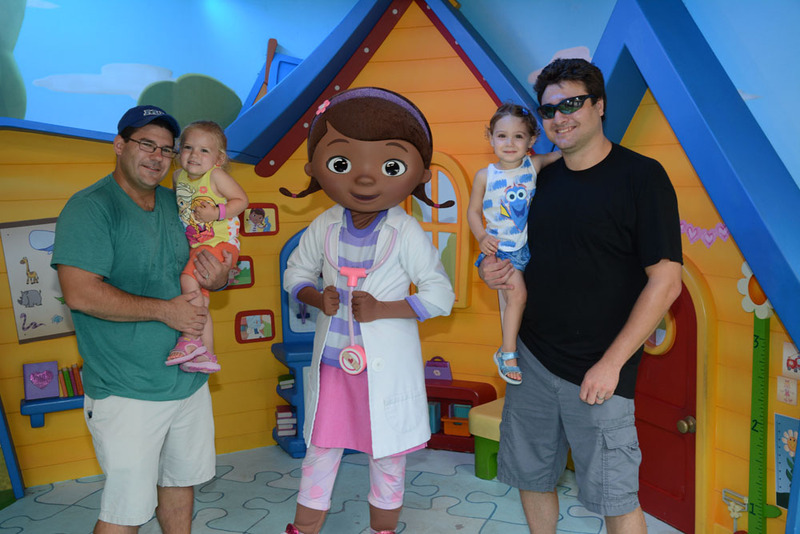 Little Maddie along with Tim, Marissa, Marianne and Alicia met us at Disney Magical Express. As we checked in to board our bus the attendant referred to Marianne and Alicia as “Two Unescorted College Girls”. Check-in was a breeze and all ten rooms are almost all in a row on the 3rd floor in building 3 of the 50’s section overlooking the pool. Thanks Rich Sr. for calling ahead to make this happen. 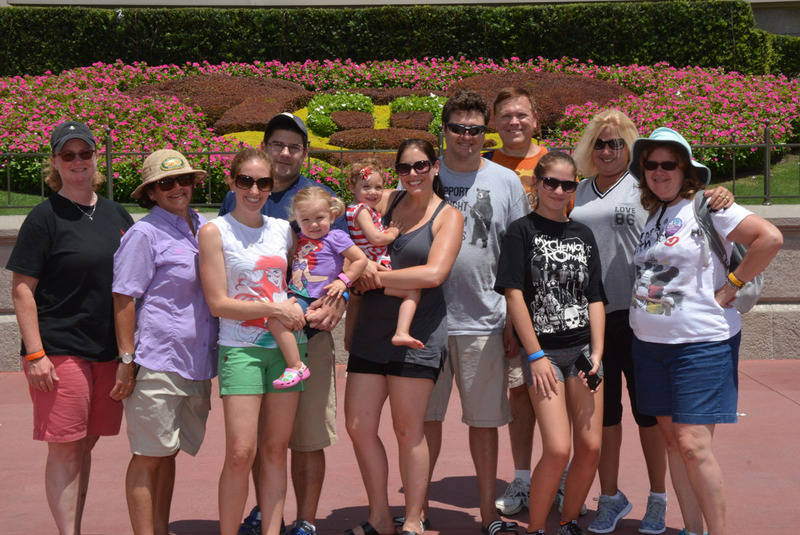 It’s nice to all hang together at the resort when we were not at the parks. Best of all, our rooms were ready! 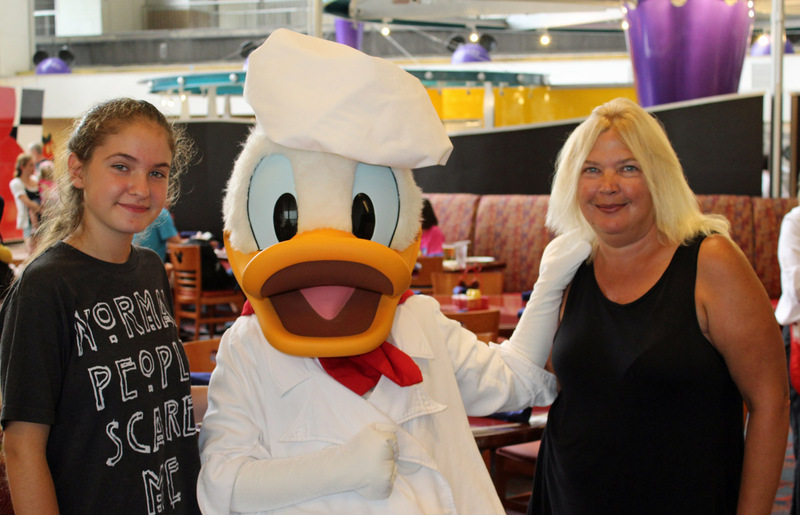 We ate “brunch” at the Pop Century Food Court – Everything Pop. They were still serving breakfast at one of the stations and Kelli and I had Waffles and the Bounty Platter. We stopped at Luggage Assistance so that they could deliver my Garden Grocers order to our room. As we approached the counter I saw our checked bags leaving for our room. 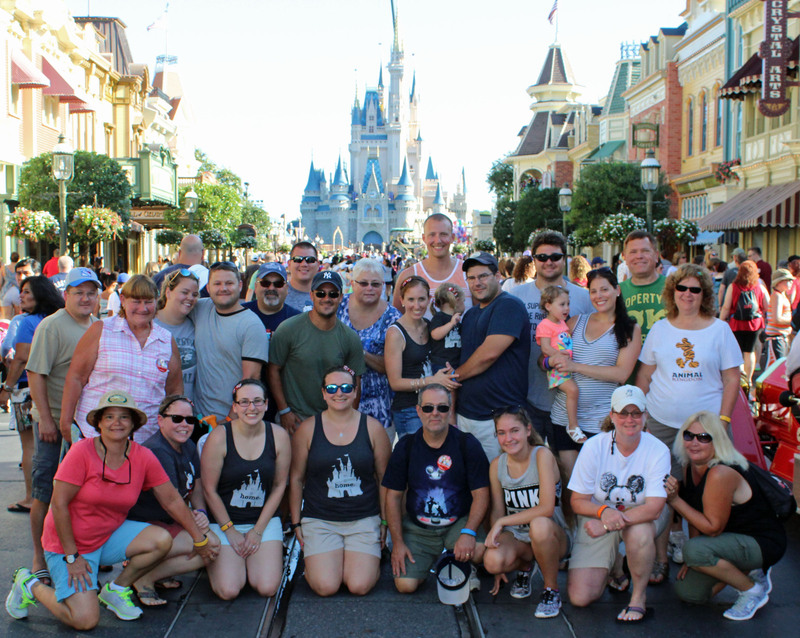 After quickly settling in our rooms the nine of us met up with Lauren, Mike T and Hunter – and all headed to the Magic Kingdom. Each bus signage rotates from its destination to "My Other Bus is a Magic Carpet". 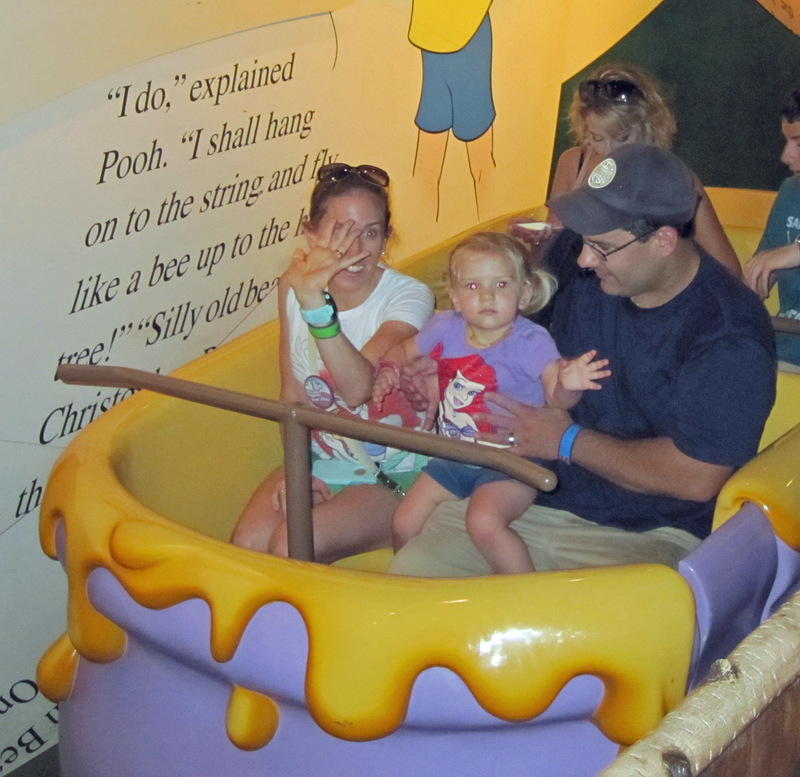 We had Fastpasses for Buzz Lightyear Space Ranger Spin followed by the Many Adventures of Winnie the Pooh - no relation to Mr. Hankey, the Christmas Poo. 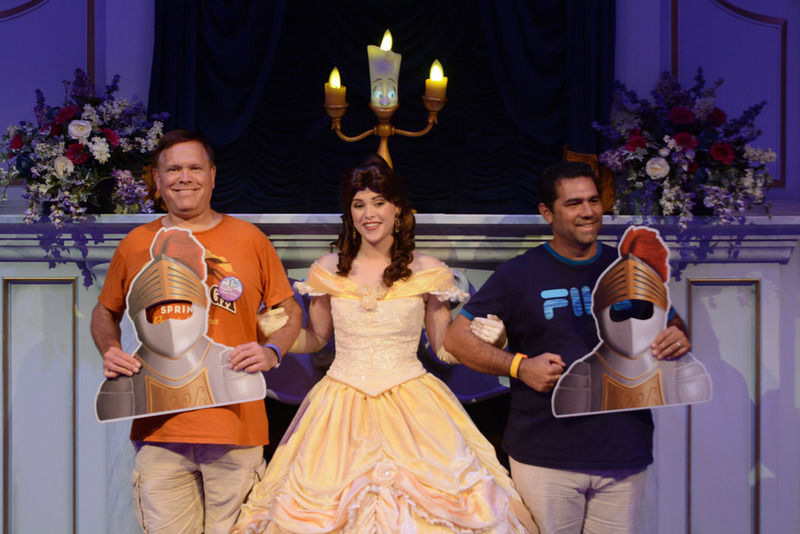 I suggested Enchanted Tales with Belle. Nobody wanted to volunteer so I stepped up and played a guard. I think everyone was impressed with the magical mirror doorway, Madame Wardrobe and Lumiere. 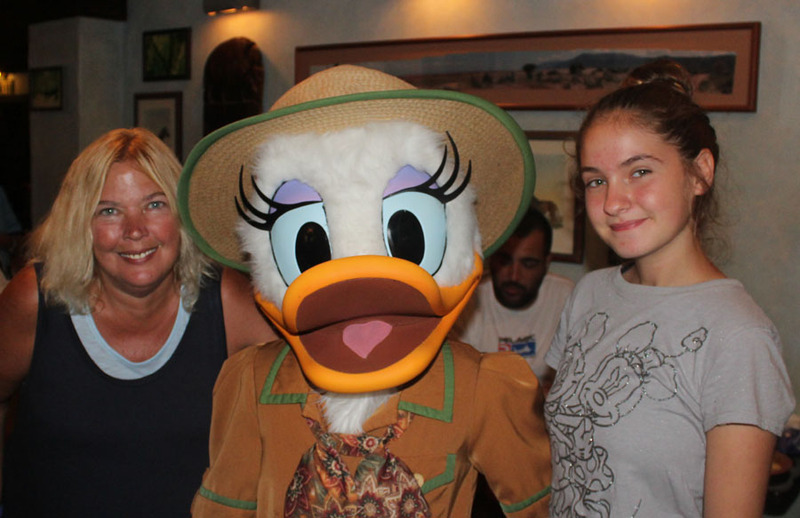 Both Maddie and Hunter enjoyed meeting Belle at the end. 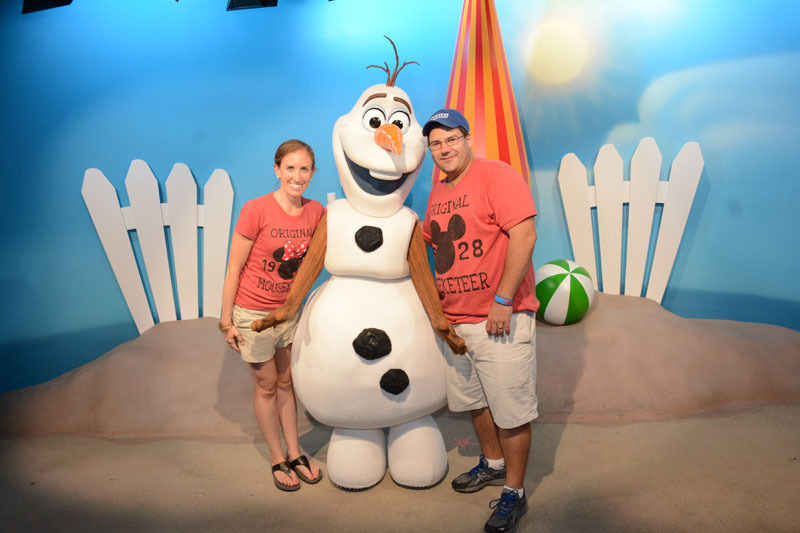 Outside, Kelli and I enjoyed a very delicious Olaf frozen juice bar. We used our third Fastpass to ride Peter Pan's Flight then headed back to Pop Century to freshen up for dinner tonight. At Pop we found the rest of the group in the Bowling Pin Pool. 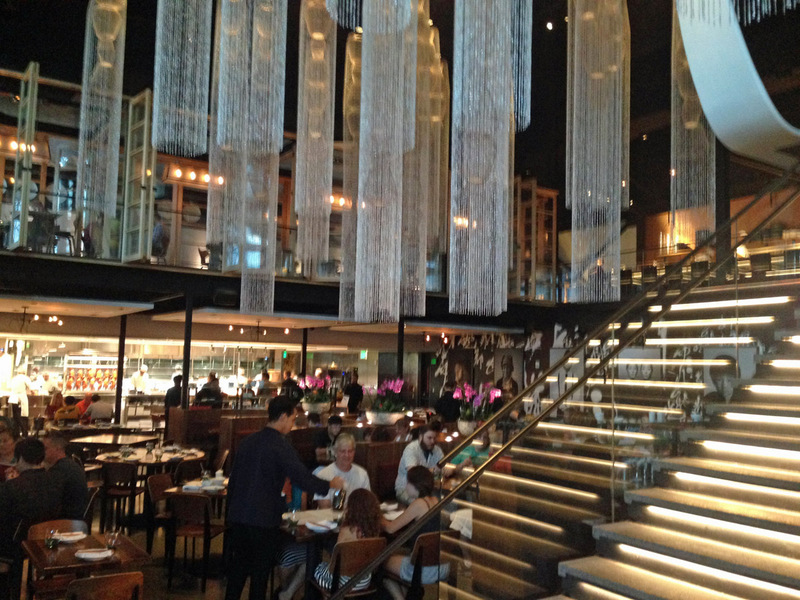 After a quick dip we got ready for dinner at Morimoto Asia. We had 5 ADR’s to cover the whole group at the restaurant. 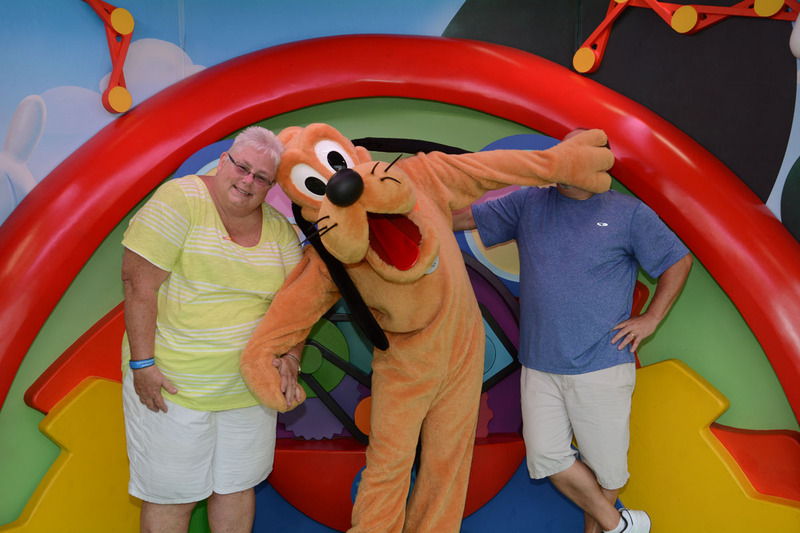 Joan and Rich drove to Disney Springs which turned out to be a blessing. Rain was threatening and lightening could be seen in the distance as the rest of us waited for the bus. It took 35 minutes for one to show. The driver said there was only one bus going back and forth to Disney Springs. On a Saturday, near dinner time??? We had just enough time to make our reservation and beat the rain. Fortunately Joan and Rich were already there and was able to secure two tables on the second floor for the 23 of us. Ann and Sam went on ahead for dinner at the Rain Forest Café. The food was delicious. We had eleven of us at our table. Appetizers included Morimoto Spare Ribs, Edamame, Five Spice Chicken Wings and Kanikama Rangoon - krab and cream cheese spring roll, apricot sweet chili sauce. For dinner some had Sushi, Orange Chicken and Rich Jr and I shared the Morimoto Peking Duck - carved house-roasted whole duck, served with steamed flour pancakes, apricot sweet chili and hoisin miso. We shared some of the duck with the table. Little 2 year old Maddie came over and we asked if she’d like to try some duck, she said yes, loved it and tried more. We told Tim, her father that she likes duck. 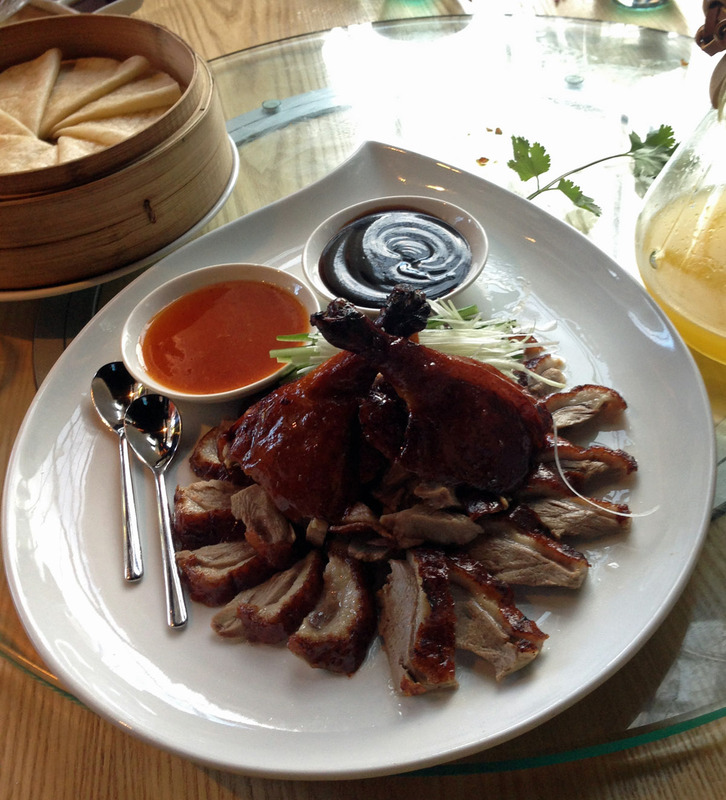 He asked what we told her it was – since they tell her pork is turkey so she will eat it – we said duck! He just shook his head. 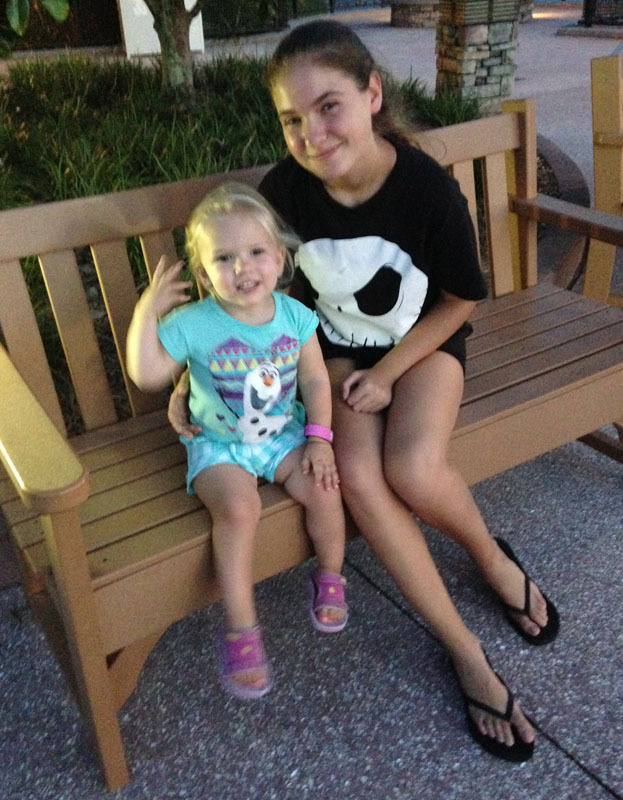 Maddie and Hunter enjoyed dancing and playing on the outdoor patio next to our tables. A band was playing below across the walkway. Tim ran out for a Tables of Wonderland card to complement mine so that we could get 20% off for both tables. The bill for our table of 11 people was 479.32 before the discount and tax and tip. The card saved us $95.86. The final bill with 18% tip and tax was only $494.67. After dinner we met up with my Sister Ann and Samantha. The ladies wanted to check out the Alex and Ani and Vera Bradley shops. We then backtracked to Ghirardelli for dessert. The Living Statues had quite a crowd around them. At Ghirardelli, I like the controlled chaos waiting for your order on a busy night. Kelli and I shared the Ocean Beach Sea Salt Caramel Sundae. 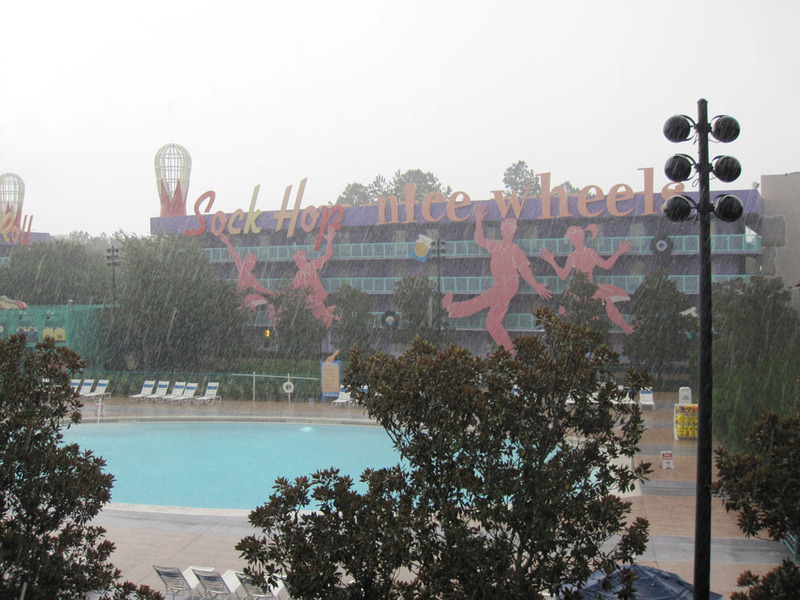 It was a long walk to the Pop Century bus stop. Back at the resort Caitlin made these great lanyards with Drinking around the World badges and handed them out. Thanks Caitlin! There was also a surprise for Marissa back in her room. The door was adorned with Congratulations. 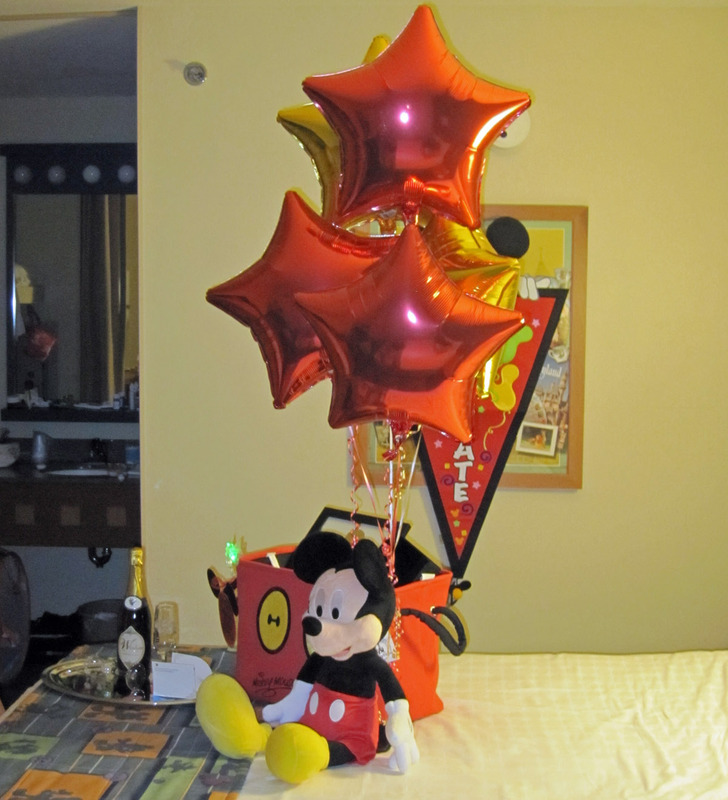 Inside were balloons and a Mickey Mouse. She recently got a new job. We all hung out on the walkway till it was time to get some sleep. 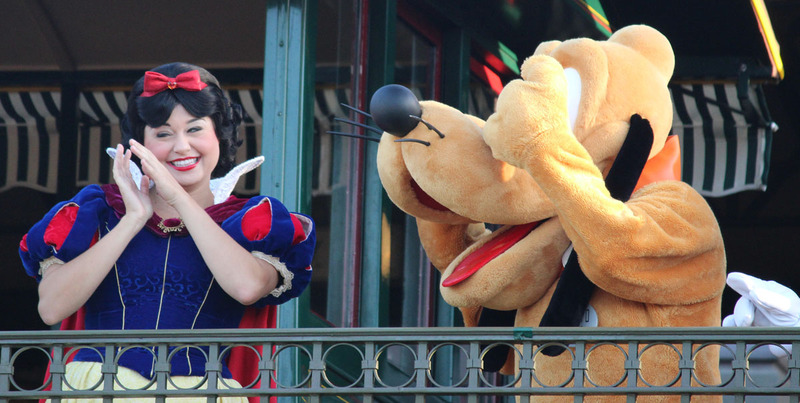 Today, Hollywood Studios has the Extra Magic Morning hours and opens at 8 AM. We woke early at 5:45 and were in the food court by 6:15. We had a light breakfast of cereal, chocolate croissant, crumb cake and clementines. 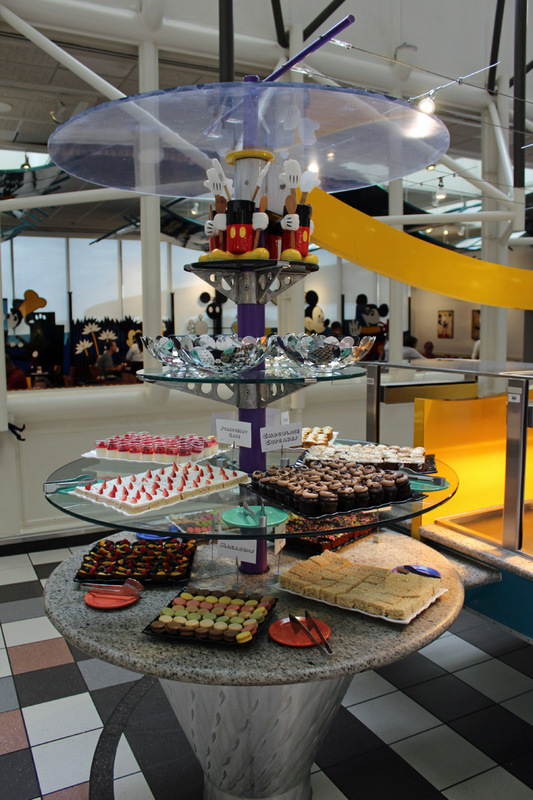 Pop Century has a very good bakery. On the walk back to our room we had a beautiful sunrise. We met most at the bus stop just after 7 and had the quick trip over to the Studios. Security joked with Marianne saying you cannot bring a bottle of spring water into the parks, after some confused looks, he said it must be “Summer Water”. The rest of the group caught up with us while waiting for the park to open. 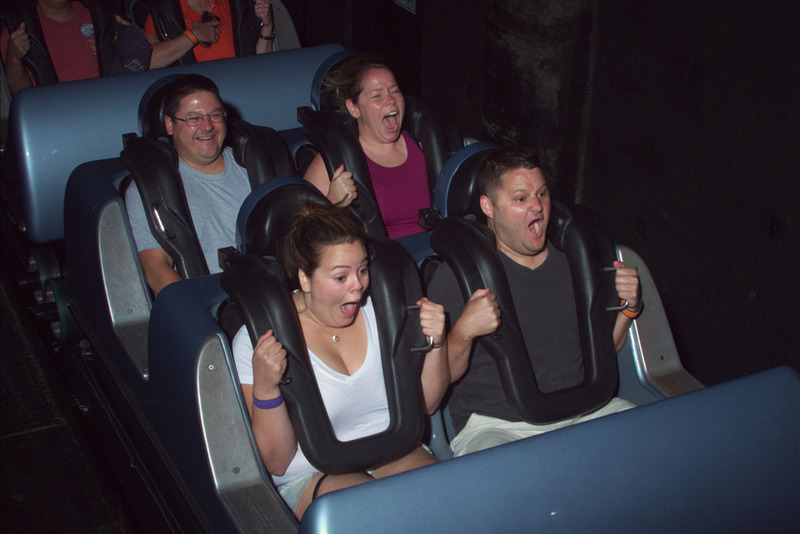 The thrill seekers went to ride Rock 'n' Roller Coaster Starring Aerosmith and the others headed to Starbucks then onto Toy Story Mania! In the queue for the coasters; electronic concert posters featured Alicia. When we rode a few days later, one featured Rich from Hopewell Junction. Disney read our Magic Bands and created posters for some of us. 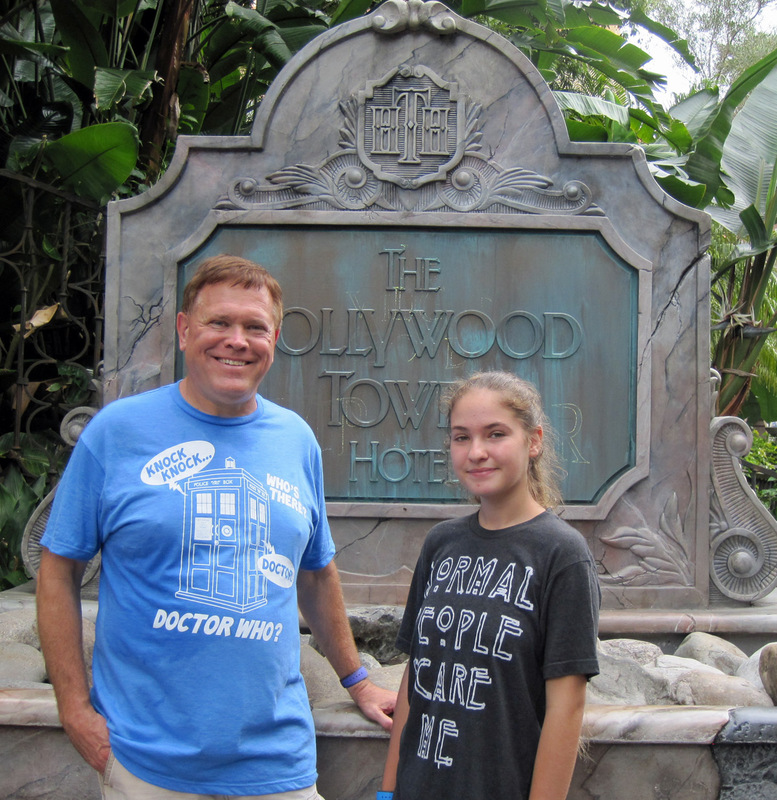 After an exhilarating ride on Rock 'n' Roller Coaster we headed to the Twilight Zone Tower of Terror which still had a short wait. After riding we had some time before our first FastPass so we did a group shot on Sunset Boulevard with the Hotel in the background. 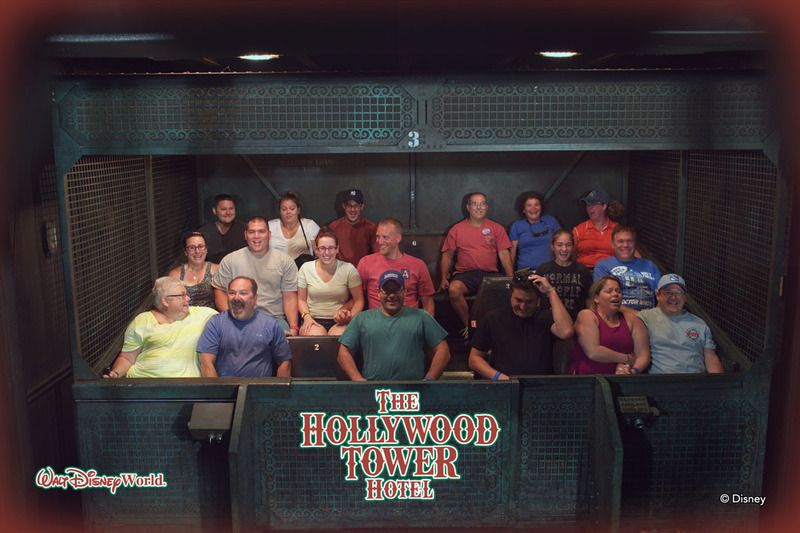 When our fastpass window opened, we rode Twilight Zone Tower of Terror again. 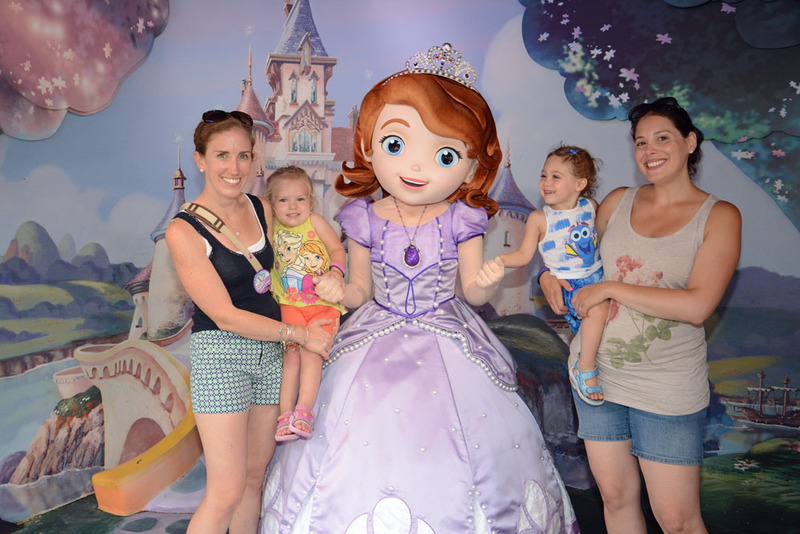 Meanwhile the other group rode Toy Story followed by pictures with Sofia the First. 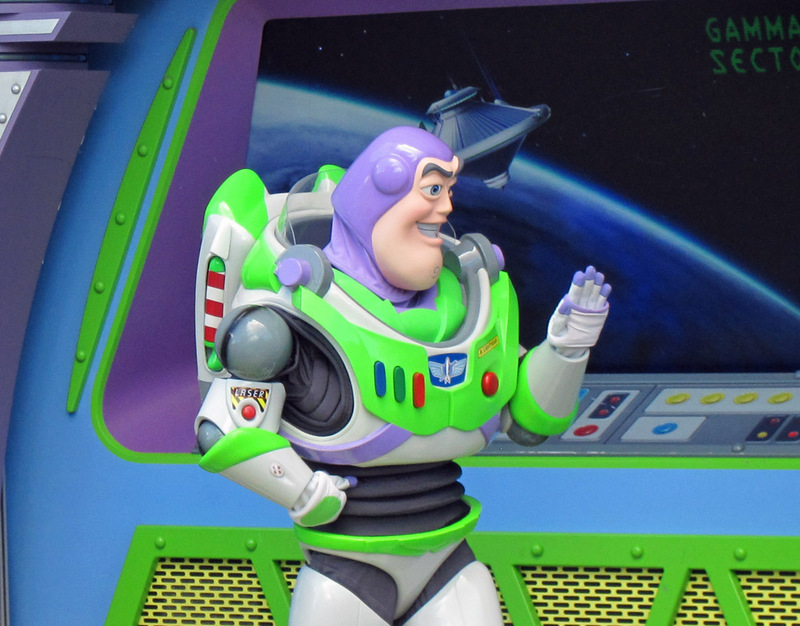 The two groups met in the Animation Courtyard, just outside the Star Wars Launch Bay. 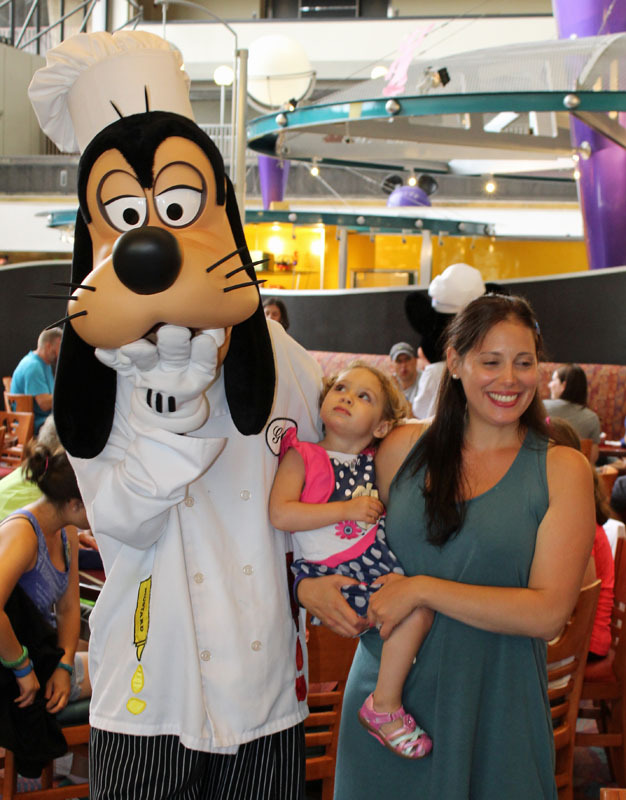 Some took pictures with Pluto, Sophia the First, Jake and Doc McStuffins while others went into the Launch Bay to see “Dreaming on a Galactic Scale”, a 10-minute film celebrating the extraordinary creation of the Star Wars saga. 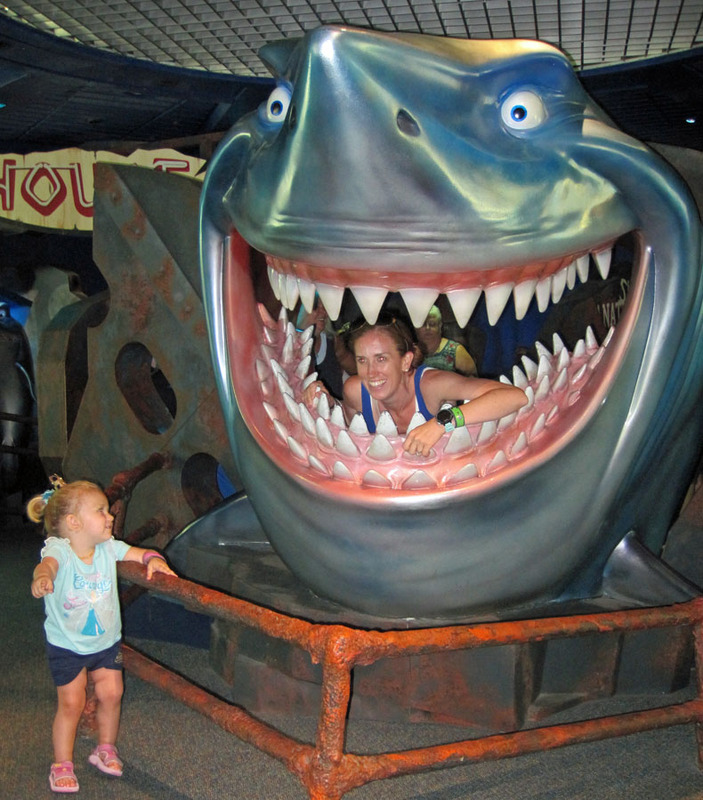 They then explored the bay that had movie props and immersive special exhibits. 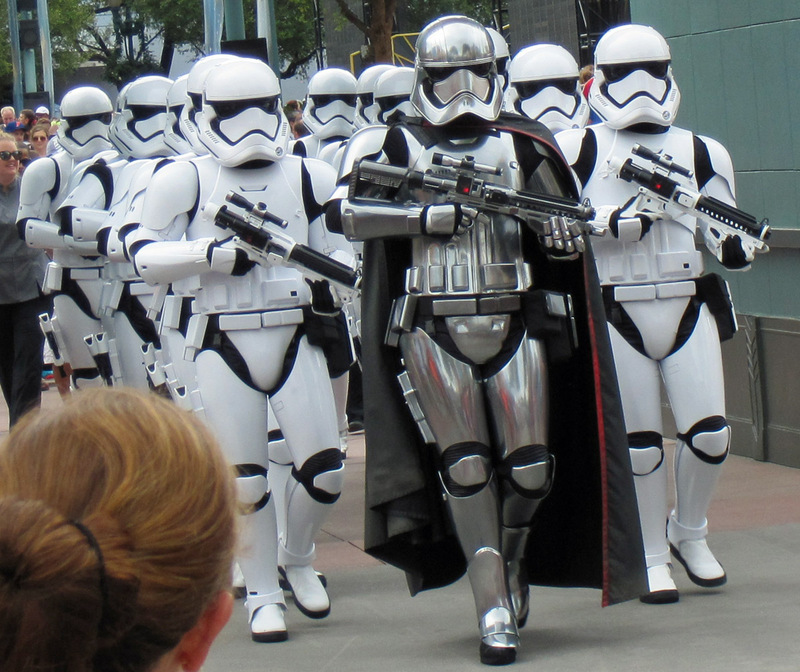 Outside we saw the March of the First Order where Captain Phasma leads her squad of Stormtroopers from Star Wars Launch Bay to Center Stage. Later we watched them return. During this time Maddie was a bit afraid of them saying “Don’t let them take me.” And “I don’t like Star Wars”. Later in the week she said she liked Star Wars! 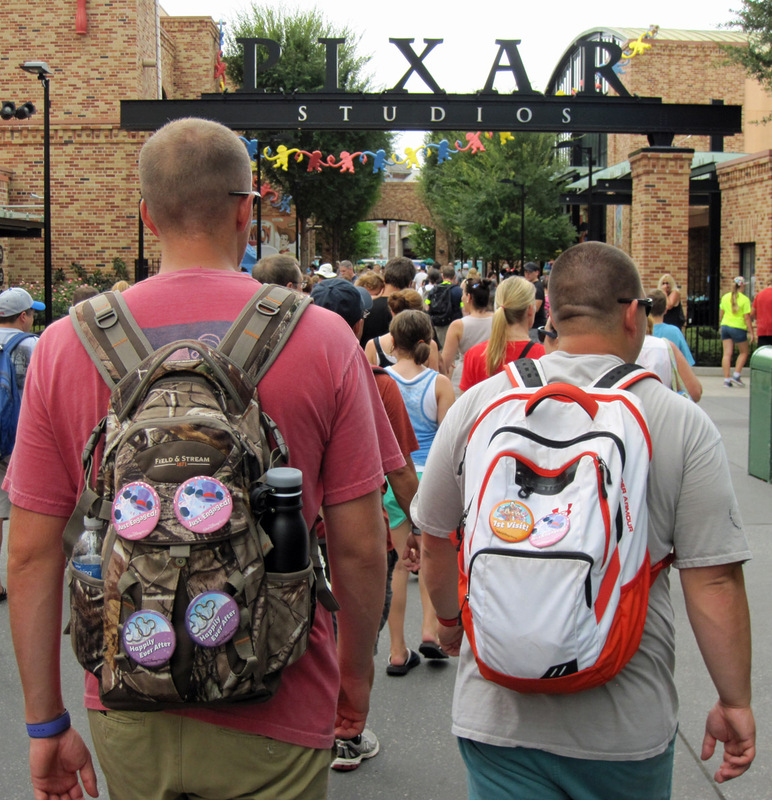 We all headed over to Toy Story Mania! On the way we noticed that Sean, who’s engaged to Katie and Evan, who’s engaged to Kelli F, were walking together and both their backpacks had the Just Engaged buttons on the back. It looked like the two of them were celebrating. 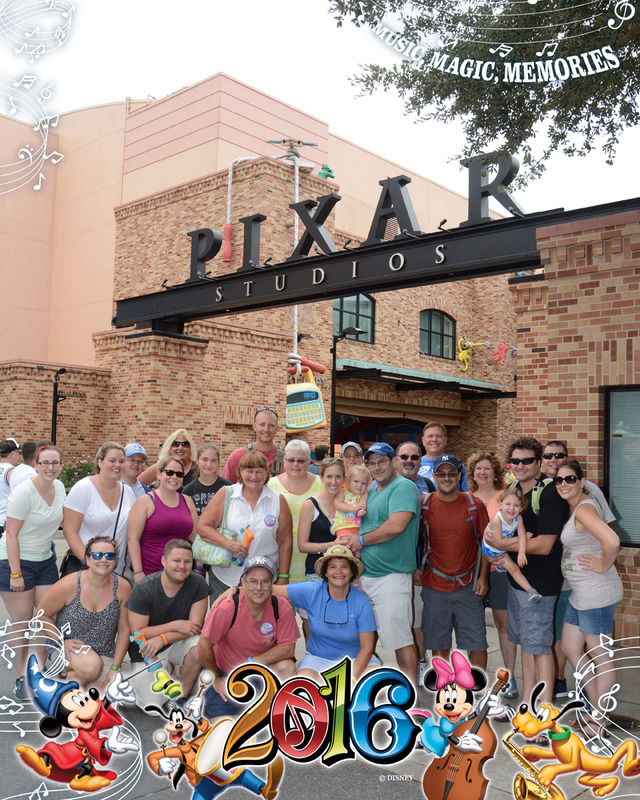 We still had some time before Toy Story so we took a group photo under the Pixar Place sign. After Toy Story we headed over to Echo Lake to rest and eat. 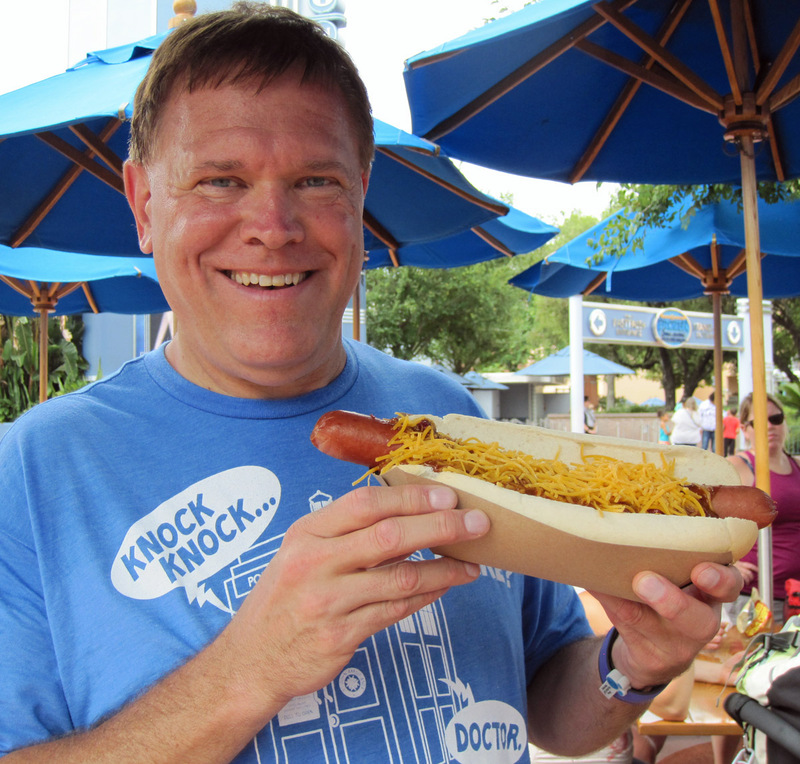 Kelli and I split a huge foot long chili cheese dog from Min and Bill’s Dockside Diner. A couple of other people tried one too. 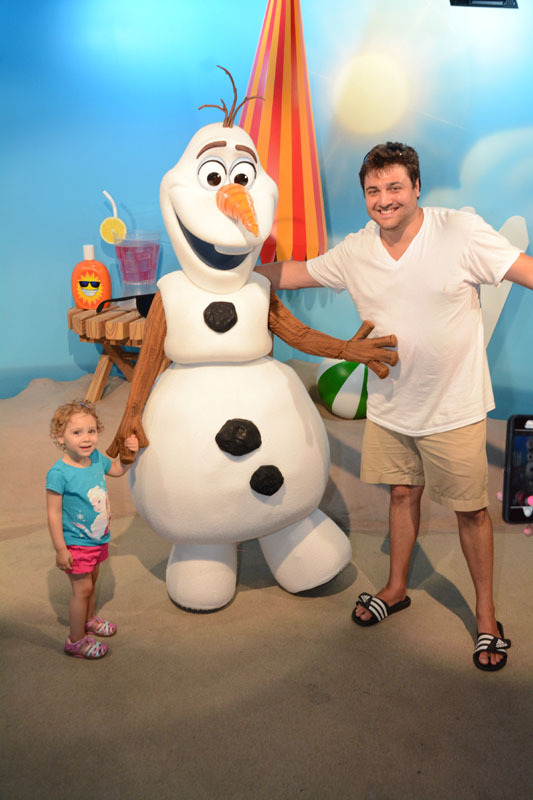 It was then into “For the First Time in Forever Frozen Sing-Along Celebration” The Royal Historians of Arendelle were the funniest yet and we all sang along to the tunes. 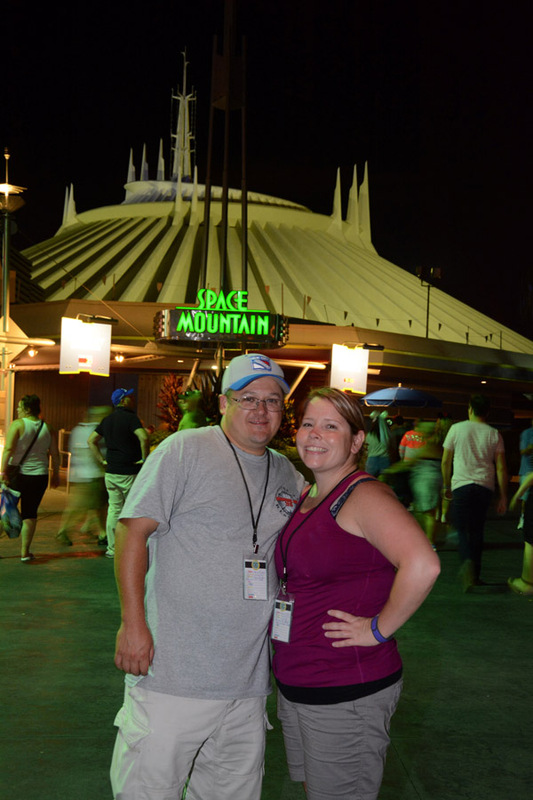 We used our third fastpass for Star Tours - The Adventures Continues before heading back to the resort. Some of us made it to the pool before heavy rains came. That cooled off the day a bit before heading out for dinner. 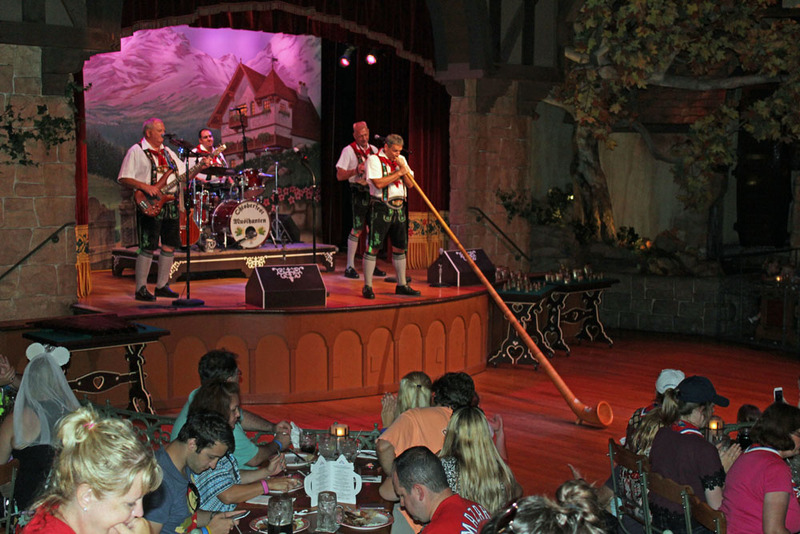 Half of the group was heading to the Biergarten in Epcot. 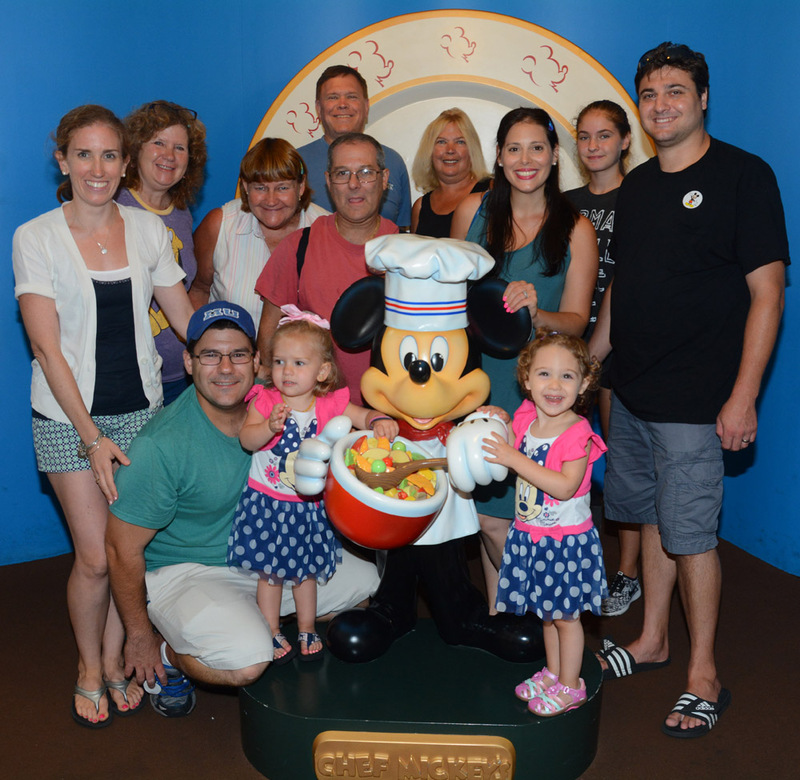 We were heading to the Contemporary to dine at Chef Mickey's. 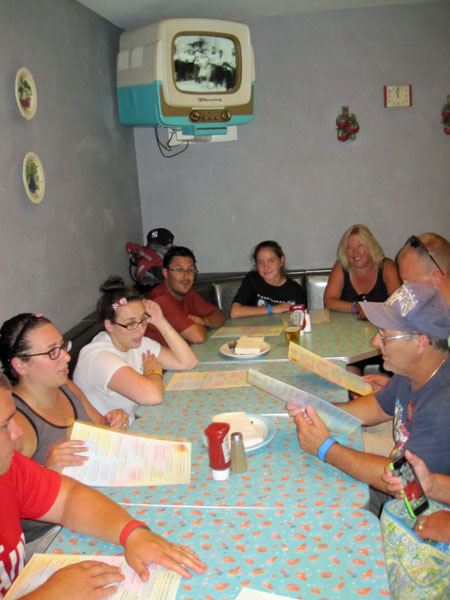 We all got to the buses early to avoid repeating the anxiety of getting to dinner on Saturday. Of course a Magic Kingdom Bus shows up right away. We then took the Monorail over to the Contemporary. We were early so that gave us time to shop in the two shops. Samantha found some great pressed penny machines in the upper atrium while we waited for the restaurant to open. We spotted Mickey and others one floor up as they waved to everyone below. 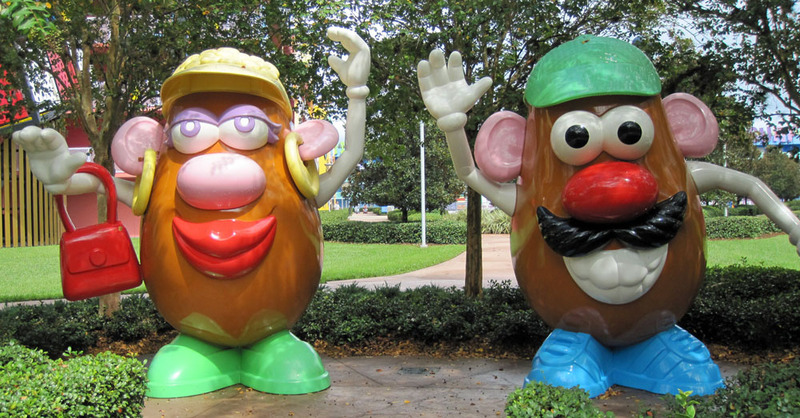 They came down on the elevator walking past us on the way into Chef Mickey’s. There was a little ceremony where a girl cut the ribbon to open the restaurant. We took a group photo before being seated. The food at the buffet was very good. 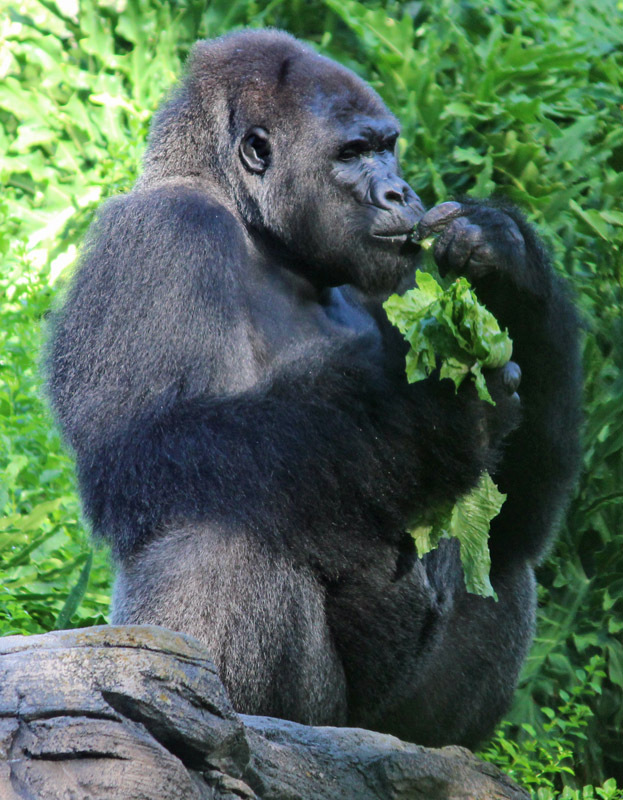 I think the trick here is to be here at opening when the food is all fresh. The untouched as of yet dessert display made for a nice picture. 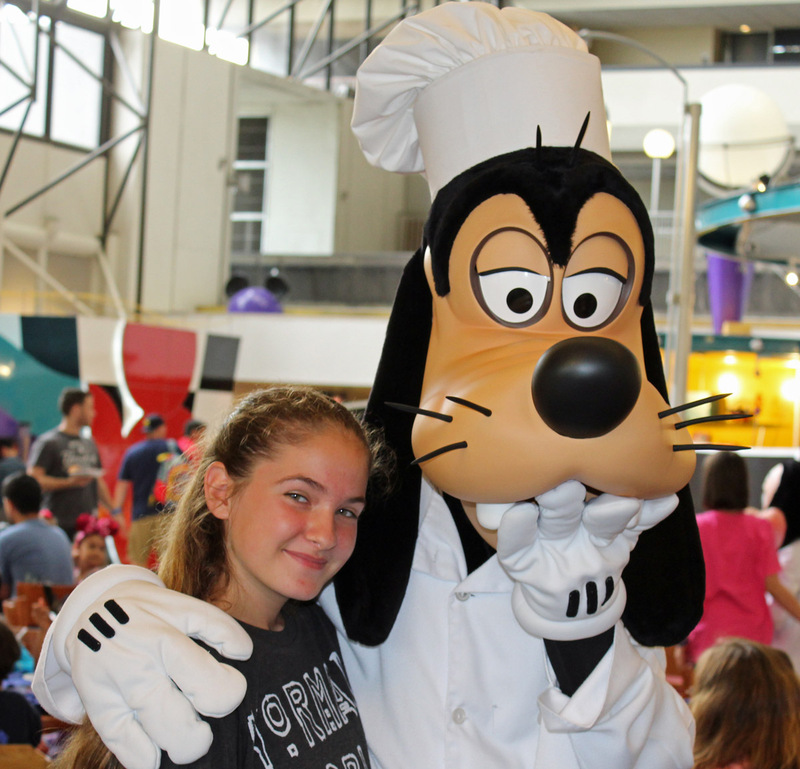 Hunter loved meeting the characters, unfortunately Maddie did not. She was OK with them from afar but when Minnie Mouse approached her she let out a piercing scream. Tim had to shield her from them for the rest of the dinner. 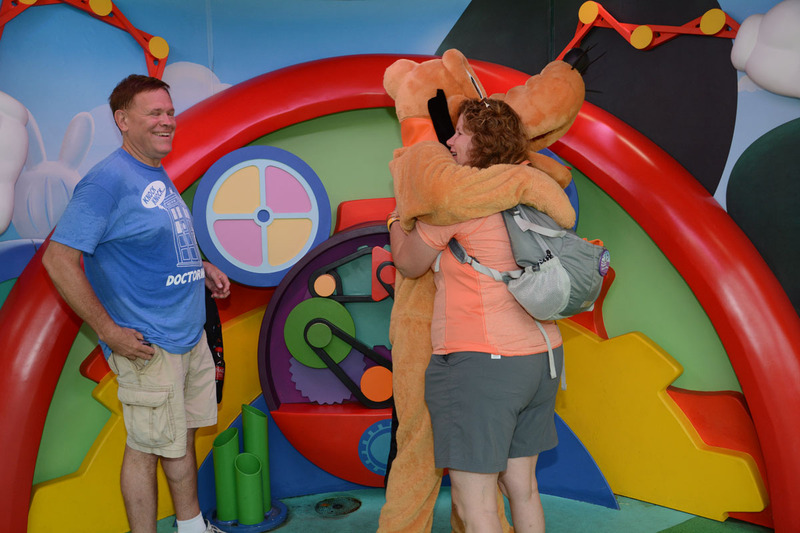 Maddie even told Pluto to go back to his Playhouse. She loves watching Mickey Mouse Clubhouse on TV. She magically perked up when they would leave after taking pictures with us, waving goodbye. The Tables in Wonderland saved $9.60 off the $48 buffet for each of us. We took the Monorail around to the Magic Kingdom where both Tim and I had problems with the very slow and incompetent security screeners. I had Kris from Leesburg. He took 2-3 minutes per bag. The lines were way backed up in this heat. Tim had even more problems. He was carrying Maddie and Chris from Celebration first ripped his backpack with no apology, took everything out and even individually took out and checked each diaper in the package. Not a very magical way to enter the park. I have gone through this dozens of times, and even the very thorough ones were quick and friendly. These guys were just “wanna to be cops” idiots. 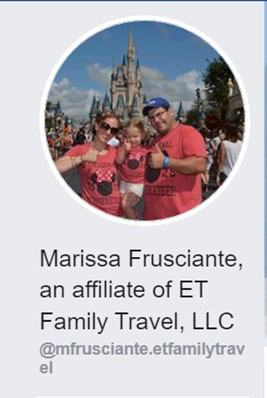 Disney should have a higher standard when hiring them. 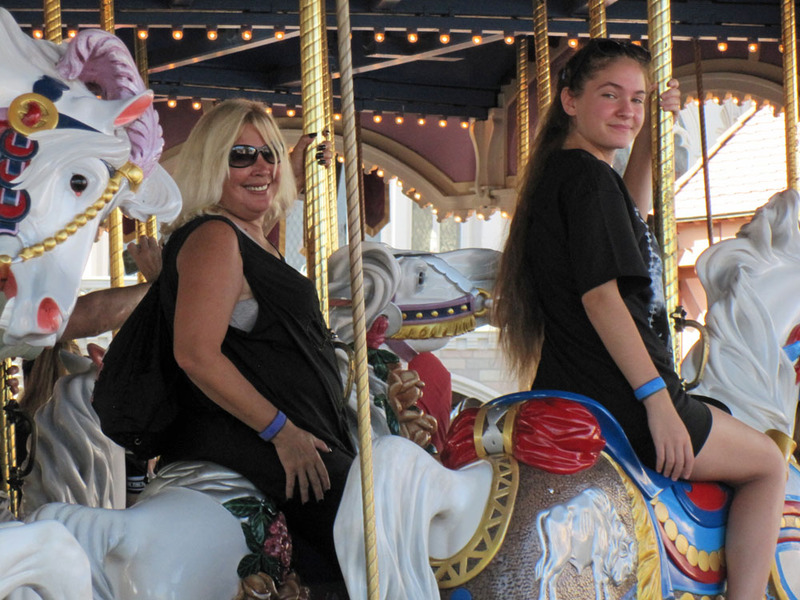 We staked out a spot in the hub for the parade where Joan & Lauren watched the carriages while our small group took Maddie and Hunter to ride Dumbo. 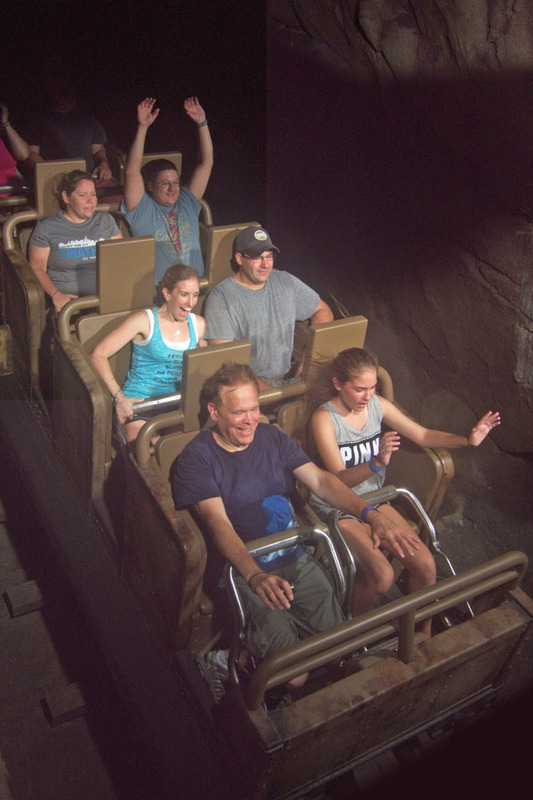 Rich Sr. got to ride with Maddie. 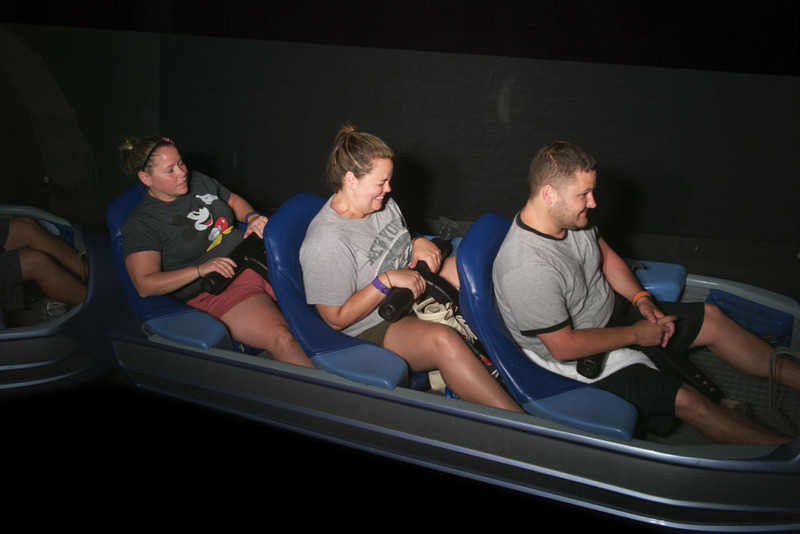 The group headed back, but Ann needed a smoke so I led her and Samantha to the quiet trail that leads from the New Fantasy Land to Space Mountain. This gave me an opportunity to get a great shot of one of the trains. 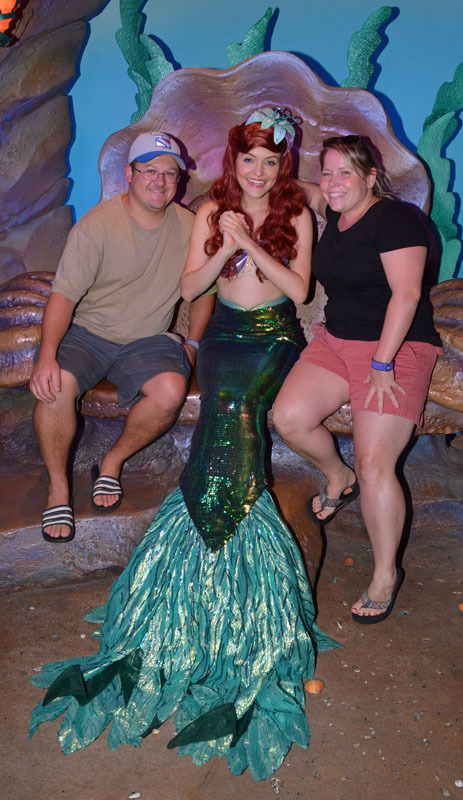 I got a text that the others were riding Under the Sea - Journey of the Little Mermaid since it was a walk on. We headed there too and rode. 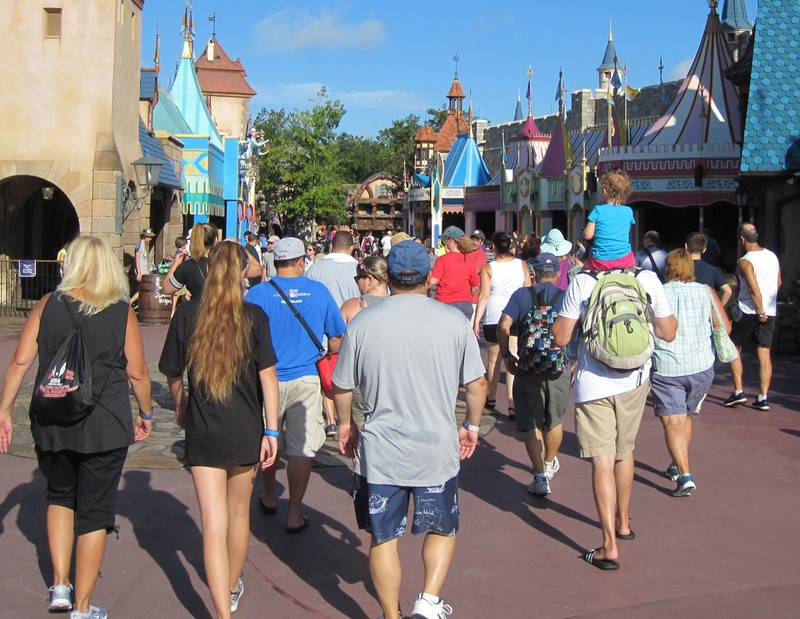 We then headed back to the hub and had this crowd scene as we passed through the castle. 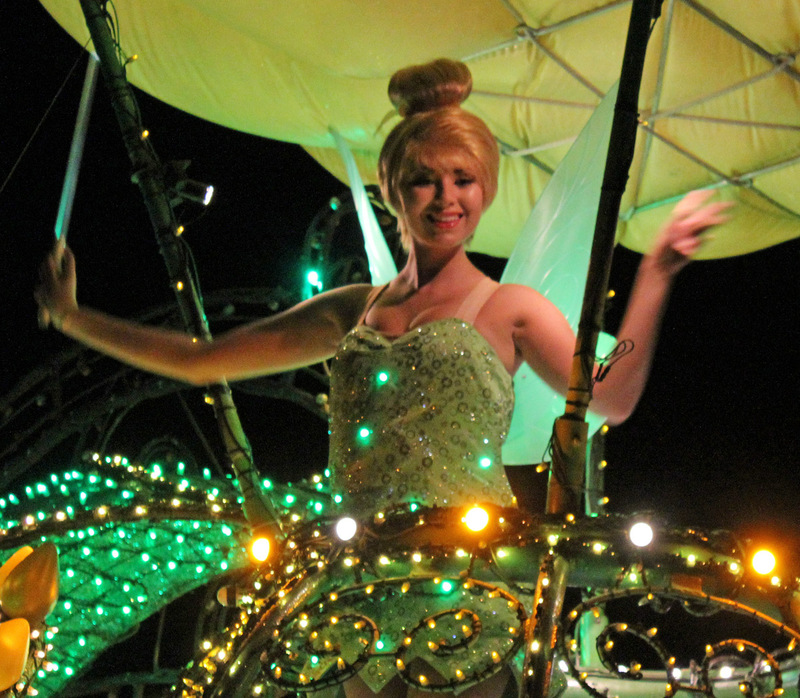 We met our group which thankfully had room to sit and wait the half hour for the Main Street Electrical Parade. It was followed by Wishes. On our way out we saw the Electric Water Pageant on the Seven Seas Lagoon as we walked to the buses. It was another long tiring day and we have another early day tomorrow. 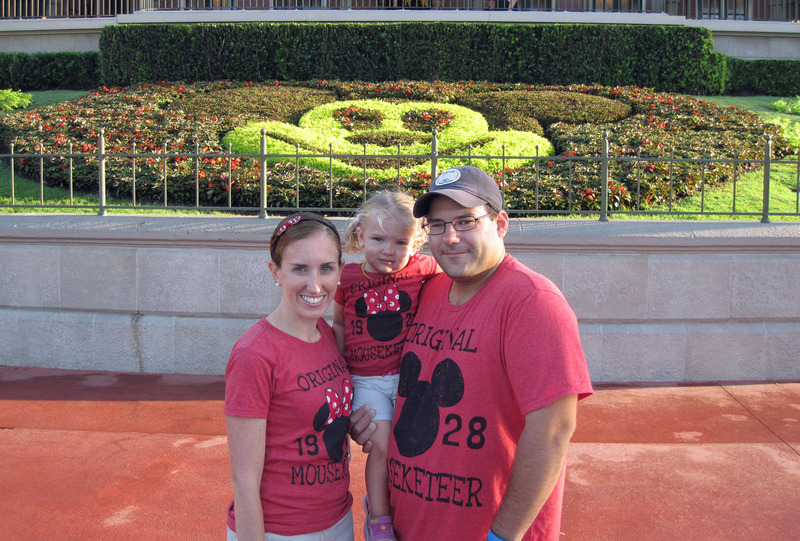 Kevin and Caitlin went to the Magic Kingdom after Epcot closed. 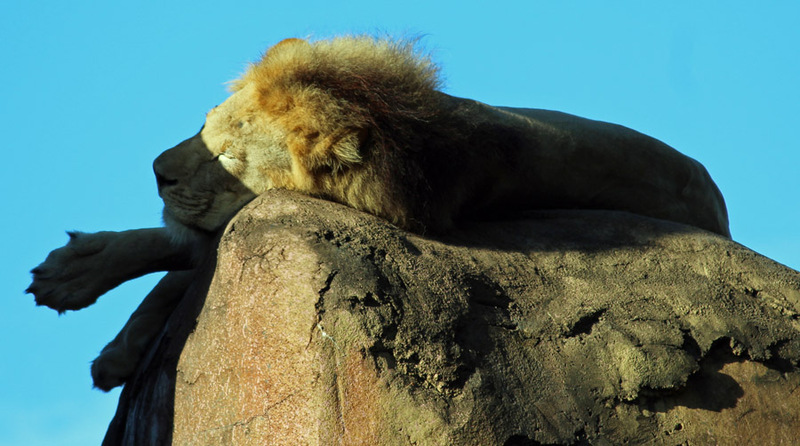 We were up early again since Animal Kingdom opens at 8 AM. 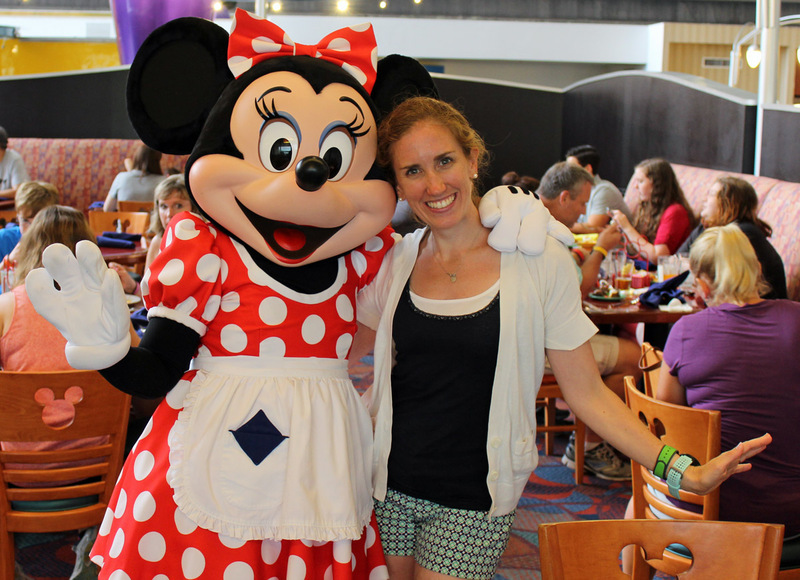 It was only the third day here but with the long travel day and two early starts, I really needed a rest midday so that I would have the energy for Epcot tonight. 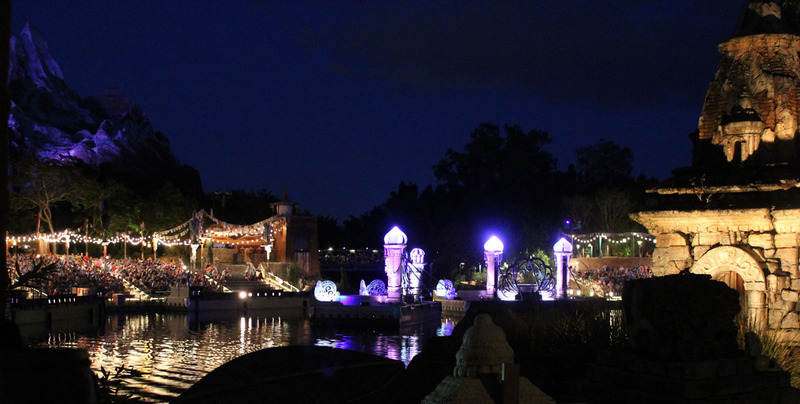 The must do’s for my wife at Animal Kingdom are the safari, Kali River Rapids and the Festival of the Lion King. After that we would head back for a much needed rest. We had light breakfasts of cereal and another gorgeous sunrise. The group made it to the park before opening. 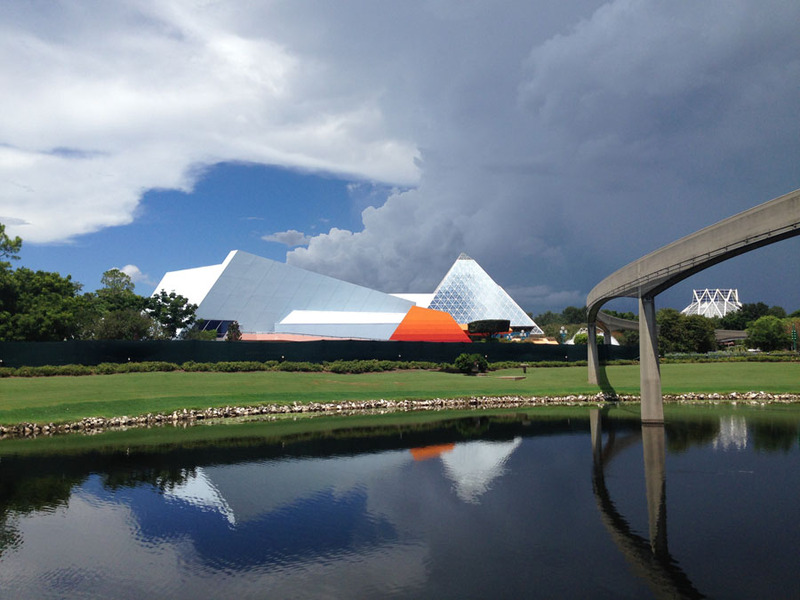 The Pandora floating mountains off to the left at the entrance were almost complete. With the early magic hour there was no opening ceremony. 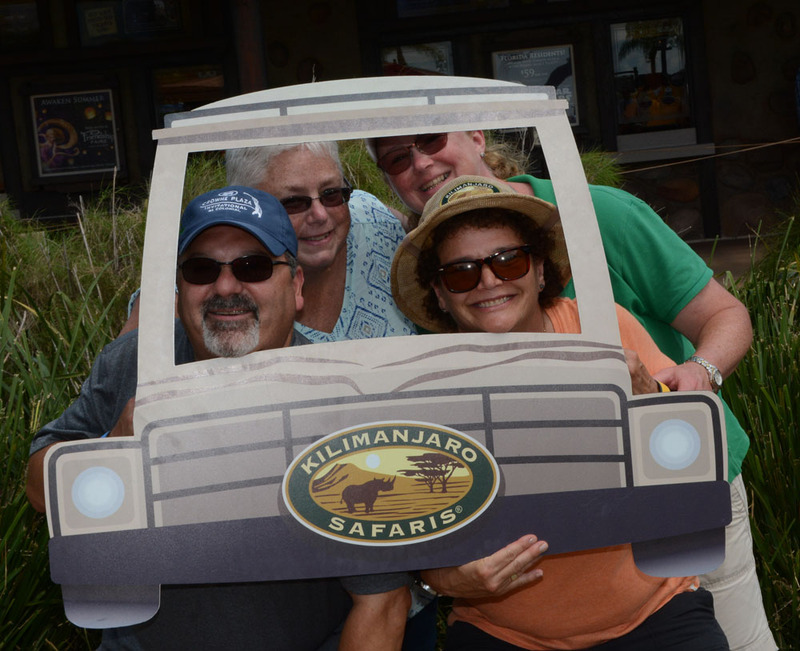 We headed for Kilimanjaro Safari and had great looks at all the animals. 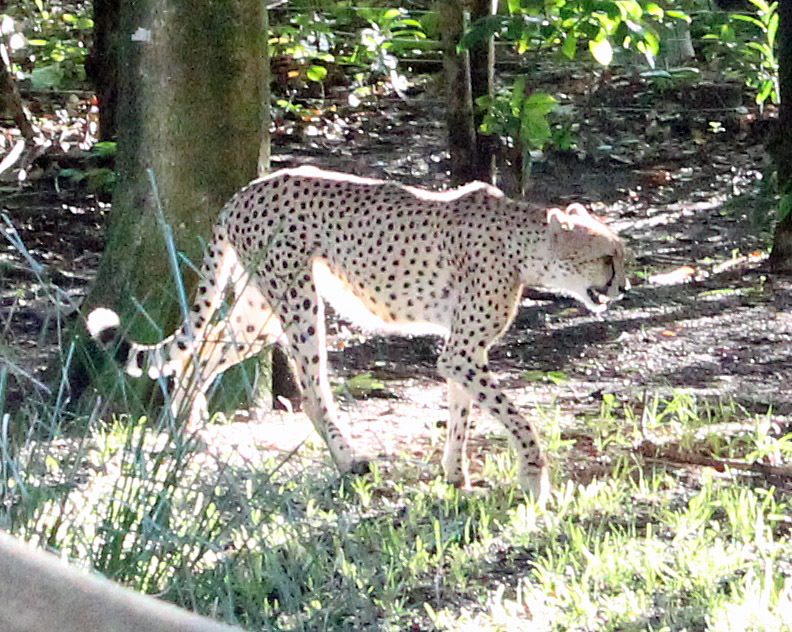 Even the Cheetah was seen strolling through its habitat. 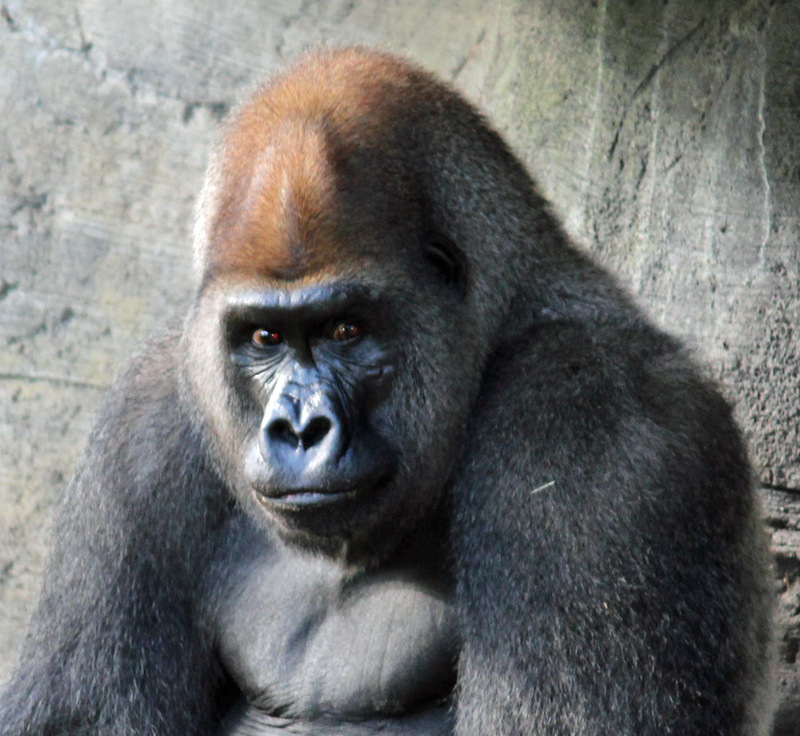 We had time so we walked the Gorilla Falls Exploration Trail. 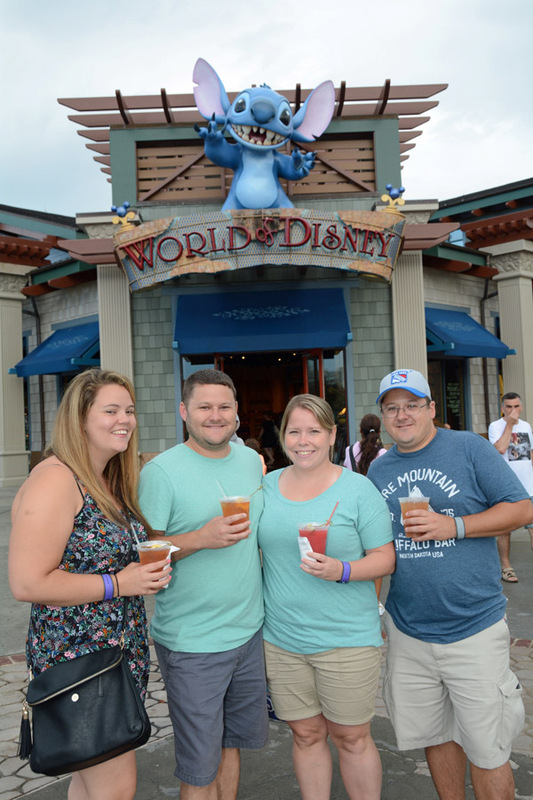 As we made our way out we stopped at the restrooms across from the Dawa Bar. 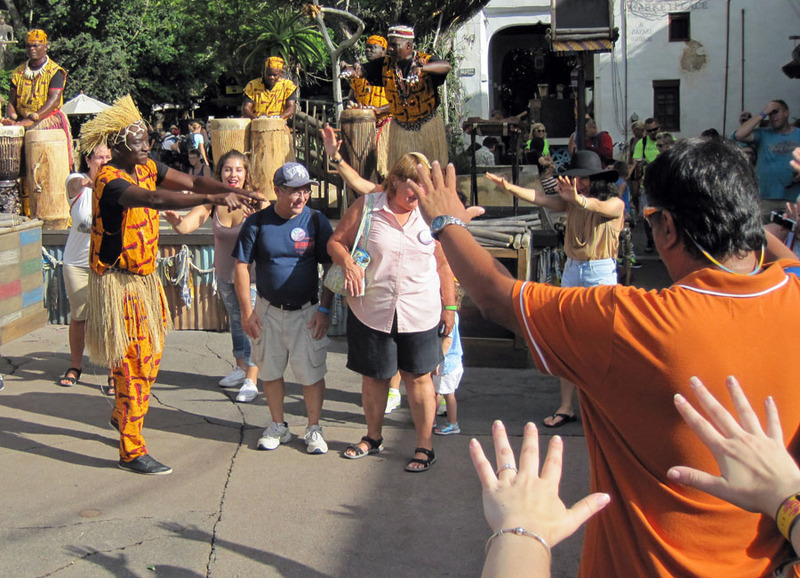 As we waited the Tam Tam Drummers of Harambe started their show. They were getting people up to dance. Eventually, Marissa, Maddie, Marianne, Hunter and Caitlin were up there. The drummers spotted Joan and Rich’s anniversary badges and called them over. The leader had the crowd to bow with their hands up and say swaaah! in some kind of blessing. I think it was some kind of fertility ritual. 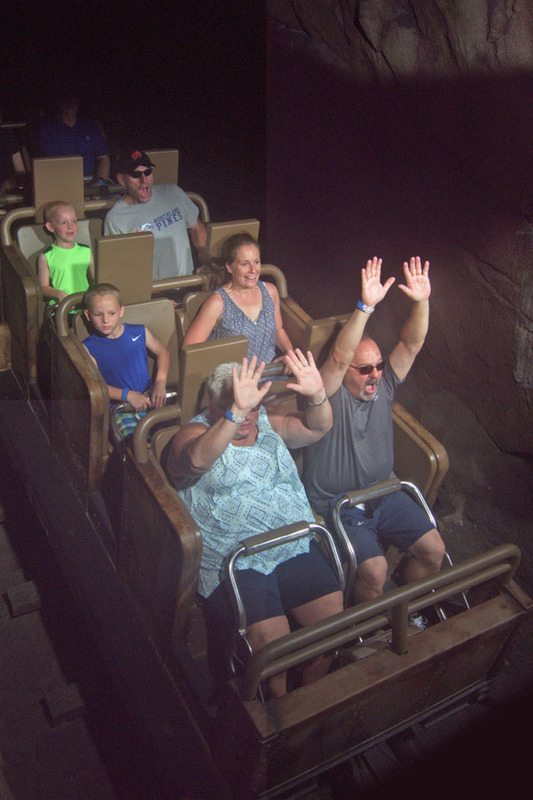 We made our way to Expedition Everest to use our fastpasses. Samantha and I snagged the front row. 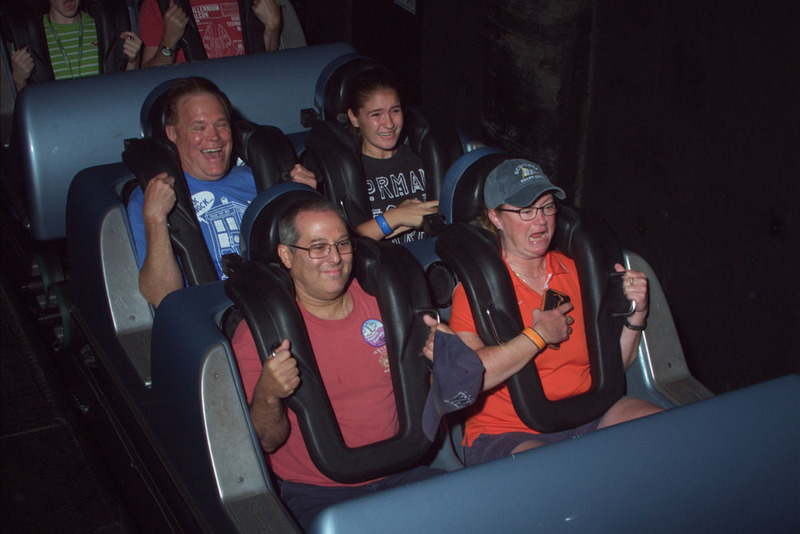 This was Sam’s first ride and she loved it. 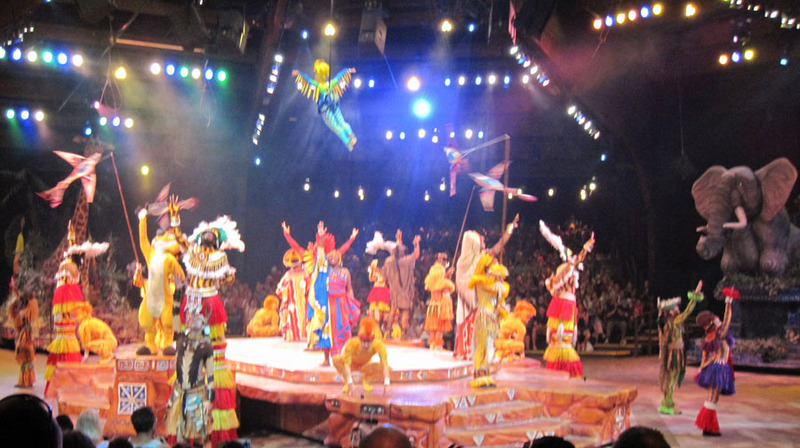 It was now 9:40 with time to make the first showing of the Festival of the Lion King. It was the perfect set-up, Festival at 10AM; then Kali River Rapids with Fast Pass and then we could head out early for a much needed rest back at Pop Century before heading for an evening at Epcot. 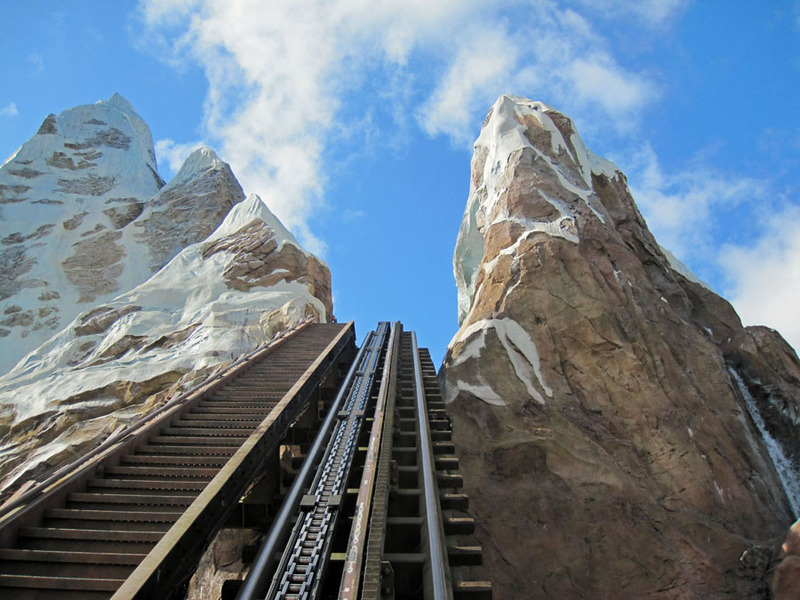 Unfortunately those plans went amiss as some people wanted to ride Everest again. 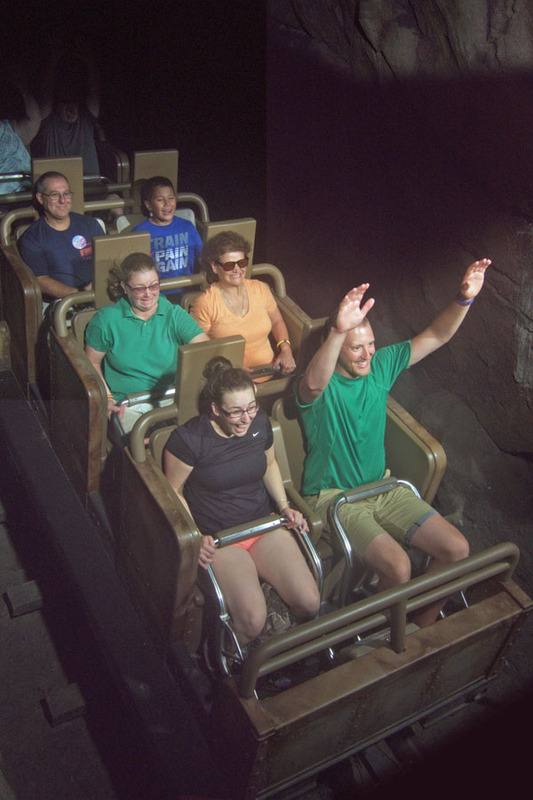 Samantha and I went back to the group not riding Everest. Kelli was looking forward to do the festival with her nephews and wanted to wait. By the time we realized that was not a good idea it was now too late to make the 10 AM show. Now we had over an hour to the next show. 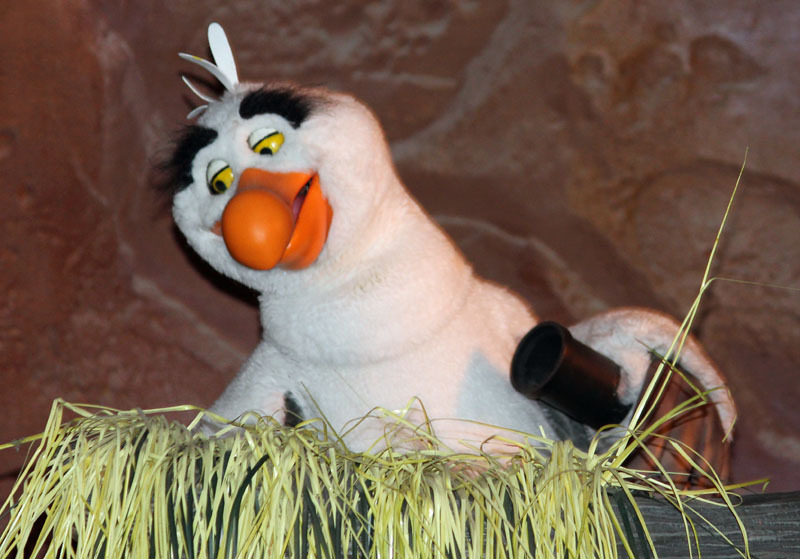 It looked like we had time to do Kali Rapids standby with a posted 25 minute wait and make the 11 AM show. Kelli, Sam and I got on line but the attraction had technical difficulties. Now the wait became an excruciatingly long 60 minute wait. 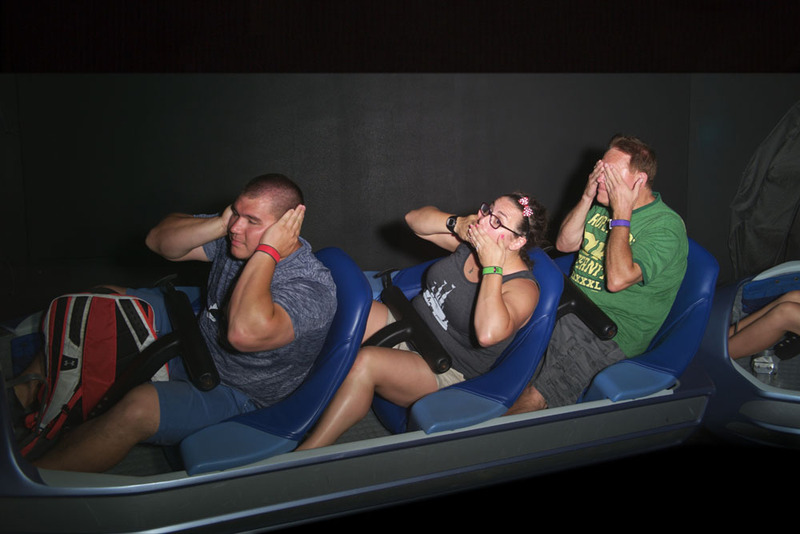 By the time we got off the ride it was too late to make the 11 AM show! Luckily Ann went ahead and saw the 11 AM show. We met up with her after the show let out. 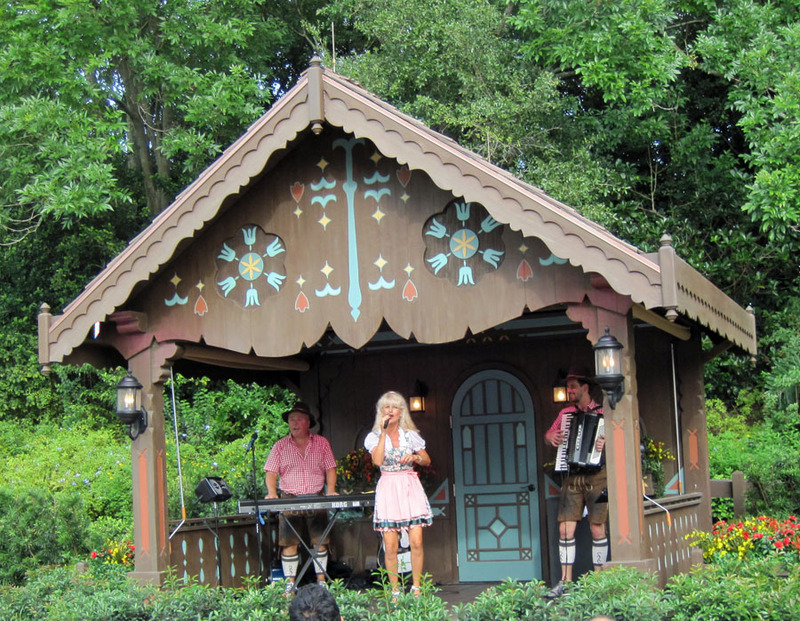 We decided that Kelli, Sam and I would see the 12 PM show with Ann waiting around some more. 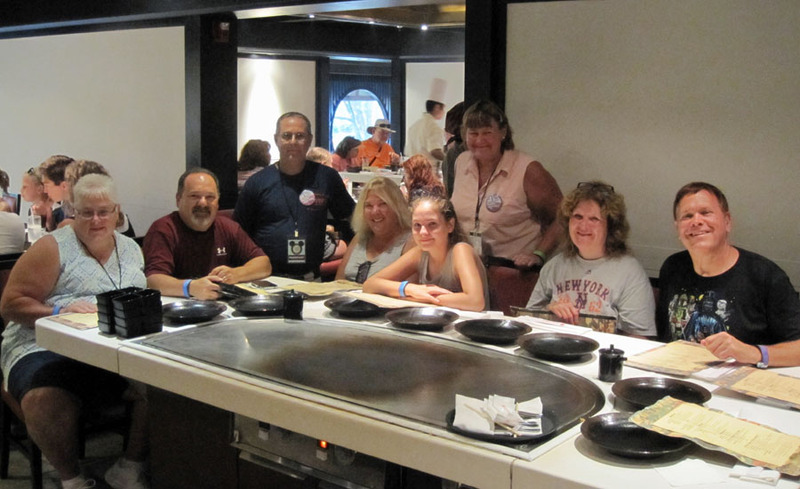 After the show we had a light meal at the Kitamu Grill in the Harambe Market of chicken skewers and apples. We left the park a little after one, over two hours later than planned. We needed to head to Epcot early at 3 PM so I knew there would be no rest and I resigned to the fact that I would probably be too tired after dinner to have a few drinks and see IllumiNations. The four of us met Joan, Rich Sr., Patty & Paul at the bus at 3. We are heading to Teppan Edo for dinner tonight. 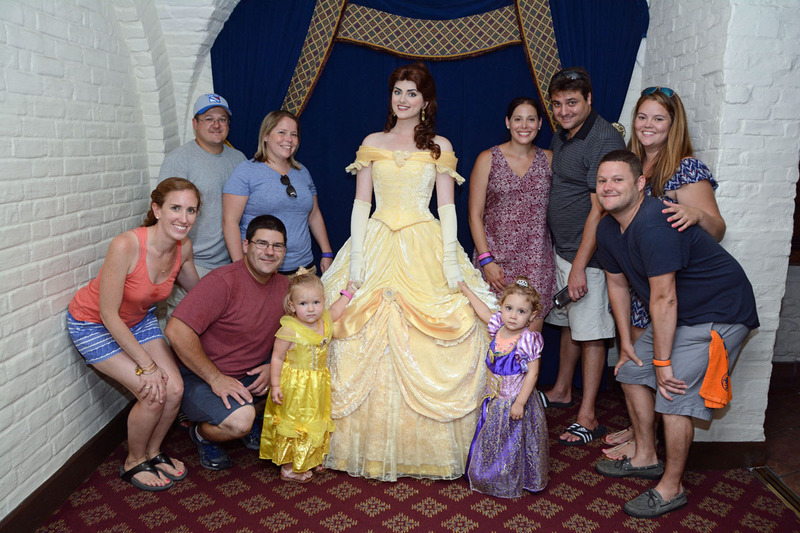 Others were taking the little girls to meet and eat with the princesses at Akershus Royal Banquet Hall. We stopped in Canada where Paul bought a beer for Rich Sr and a Magner’s Pear Cider for me as we made our way around the showcase to Japan. The Matsuriza drummers had just started as we climbed the steps to Edo. We were seated 15 minutes early by our hostess Iori for our 4:30PM ADR. 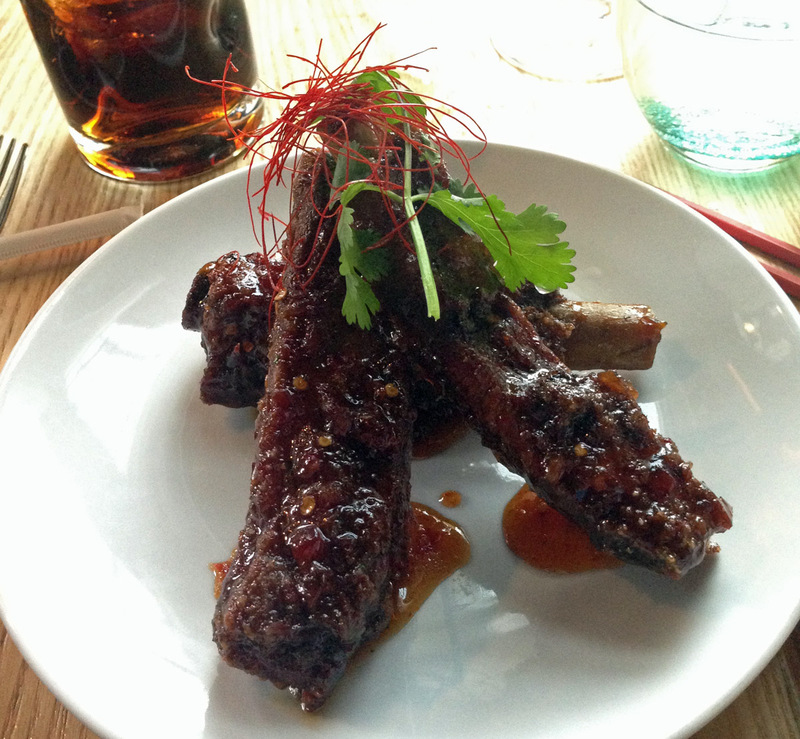 I ordered some Wafu Ribs and a Sake Mojito. I had now had ribs three nights in a row. All were different and very good. 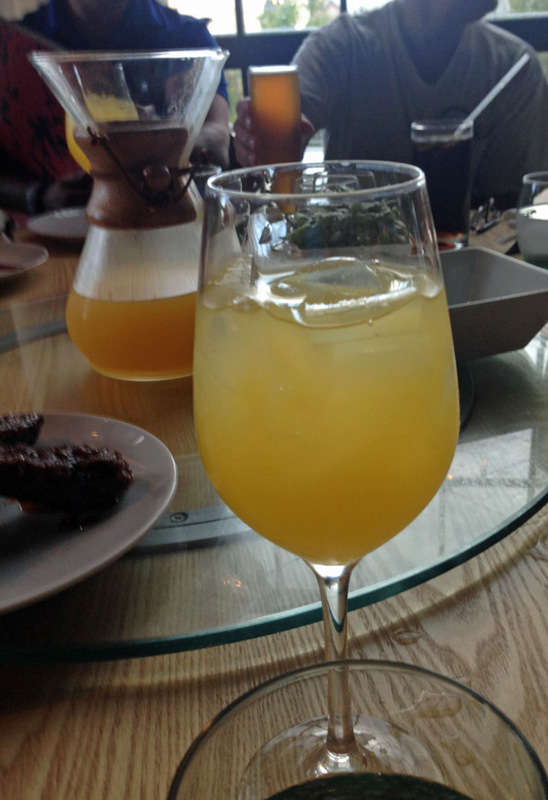 The best was still Morimotos. Joan who doesn’t drink tried Rich’s beer, Patty’s cocktail and my mojito. She made faces tasting each one. Our chef was great. Some of the jokes revolved around Disney, others were a line of sesame seed roasting on the grill which he called Sesame Street. When he added soy sauce he called it Japanese ketchup. The food was flavorful and delicious. There was no discount available here so we split the billing. My bill for the four of us was $203.03 with tip. We were back walking the showcase by 5:30. 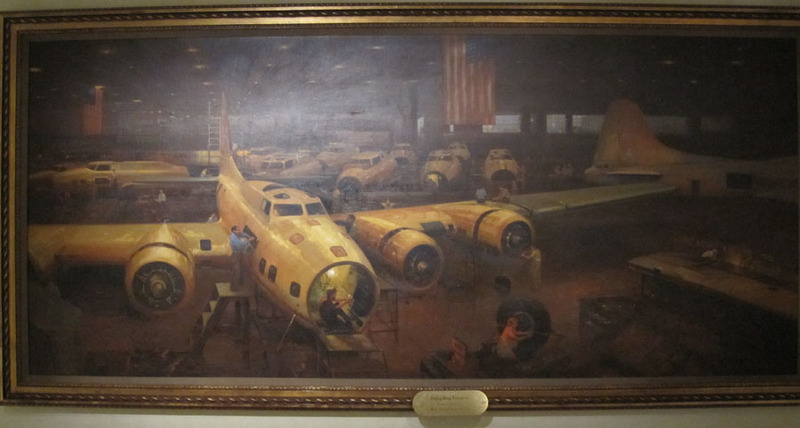 I showed our group the painting in the American Pavilion where the plane seems to point to a different spots depending where you stand. I think this time everyone noticed it. The painter of “Defending Freedom" was Tom Gilleon; a Walt Disney Imagineer. Patty then found a painting nearby where the eyes seem to follow you. Outside the pavilion a Mallard duck was out of place swimming in the fountain. Joan, with a few sips of alcohol in her decides to try out Patty’s ECV/scooter. Kelli tried it out too. Thank god there was almost no one around to run into. In Germany we spent some time at the trains and stopped to listen – well, … tipsy Joan danced; to Margret Almer & The Bavarian Band. 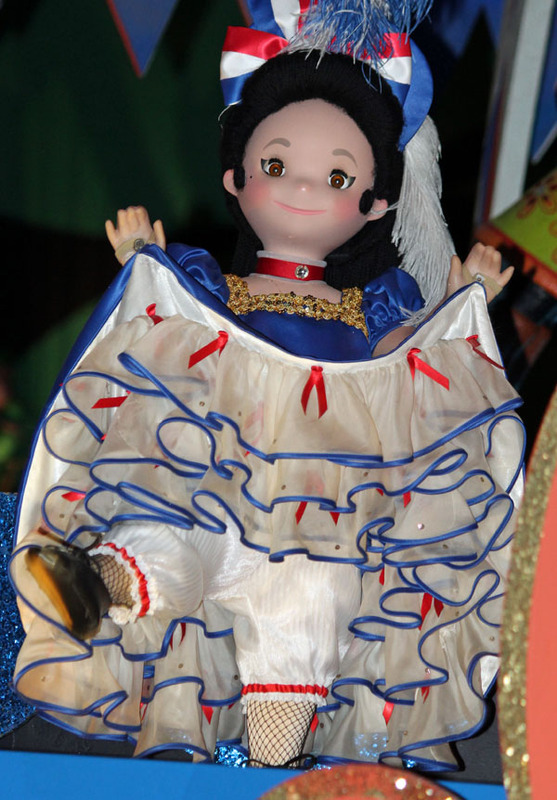 The Chinese Acrobat was very flexible as we passed by China. 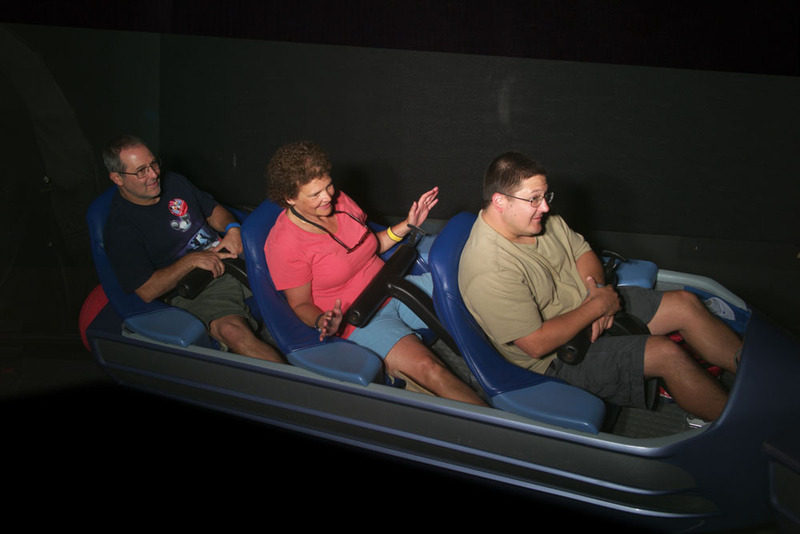 Joan, Rich Sr, Paul and Patty went shopping in Mouse Gears while we went to try to see Disney Pixar Short Film Festival, but it was down, so we rode Journey into Imagination... with Figment. Back at Pop Century we stopped for dessert and I had my tie dye cheesecake. Later, while hanging out on the walkway we heard fireworks and walked around towards the lake. 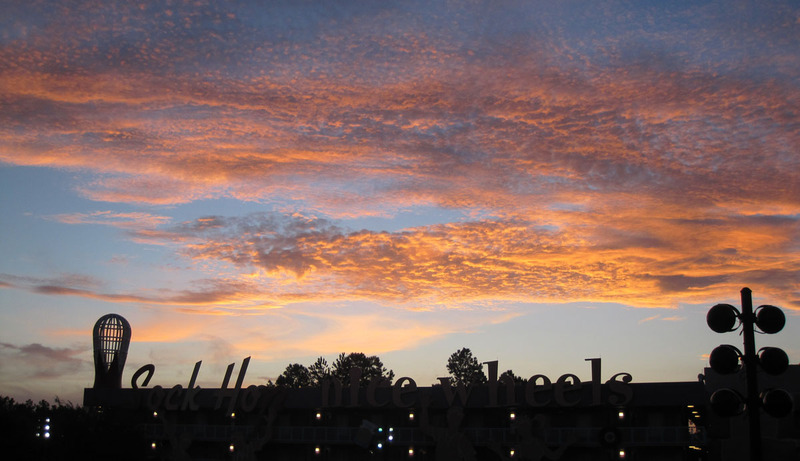 We could see the 9:30 fireworks show from nearby Hollywood Studios. We got to sleep an extra hour since Epcot doesn’t open till 9 AM. We arrived at the food court at 7:15. More stations were open; that meant I could get my favorite Chicken Fried Chicken with scrambled eggs and sausage gravy. 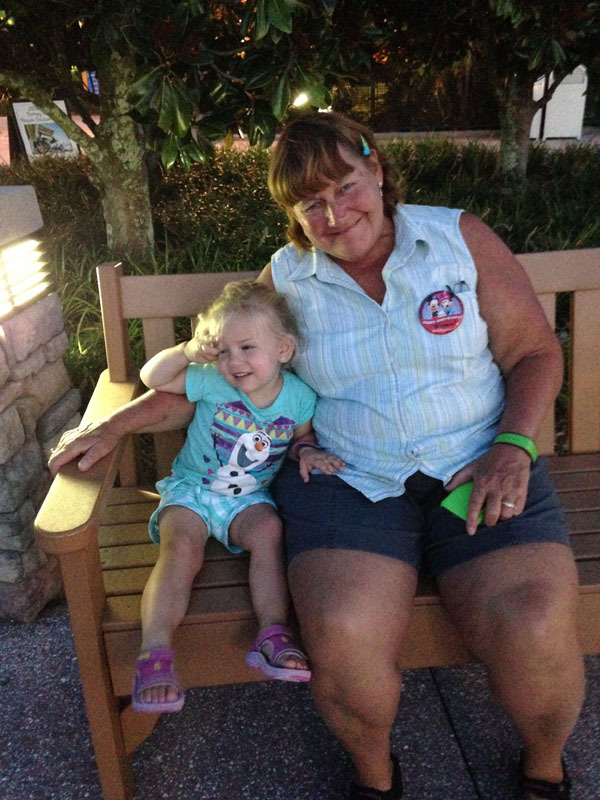 Kelli B. had her usual cereal, crumb cake, and pack of clementines to share with Maddie and Hunter later on. The sun was up so we might have missed another beautiful sunrise. We were at the bus stop by 8. Others followed. 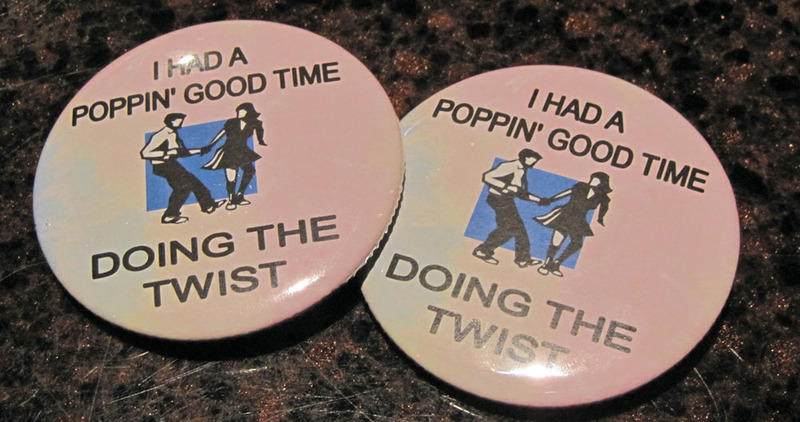 Maddie and Hunter received pins for dancing the Twist in the food court at 8 AM. Epcot had long lines at the entrance, fortunately they started to let people in nearly 20 minutes early. 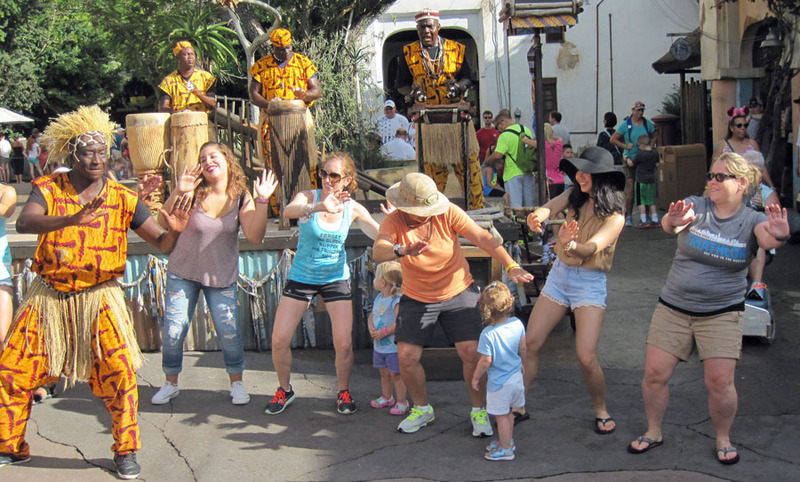 The Jamminators were performing in front of Spaceship Earth as we walked by on our way to Soarin’ Around the World. Tim and Marissa tried the child swap here. Our group took up the 3 front rows in the newest theater. The new movie was great. 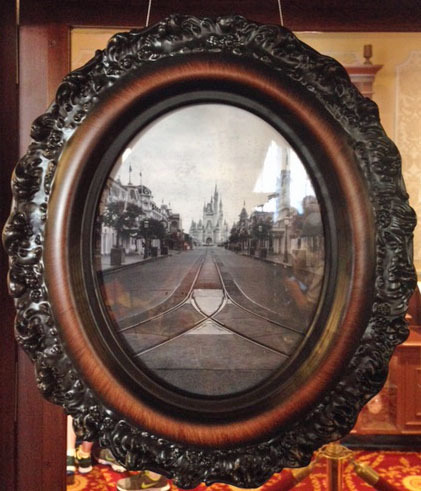 I did hear from people sitting on the far sides seeing the distortions of the buildings due to the curved screen. We rode later in the week and saw that effect as well. After we rode the child swap people went on along with others via the standby line. Not wanting to wait around again doing nothing; Patty, Paul, Ann, Sam, Kelli B and I rode Living with the Land. After everyone regrouped we all watched the Circle of Life movie. When we exited our group used two different exits – not a good idea for this theater. One lets you off on the top floor of the pavilion, the other exits to the bottom floor. Eventually we all found each other and headed over to the Seas Pavilion. 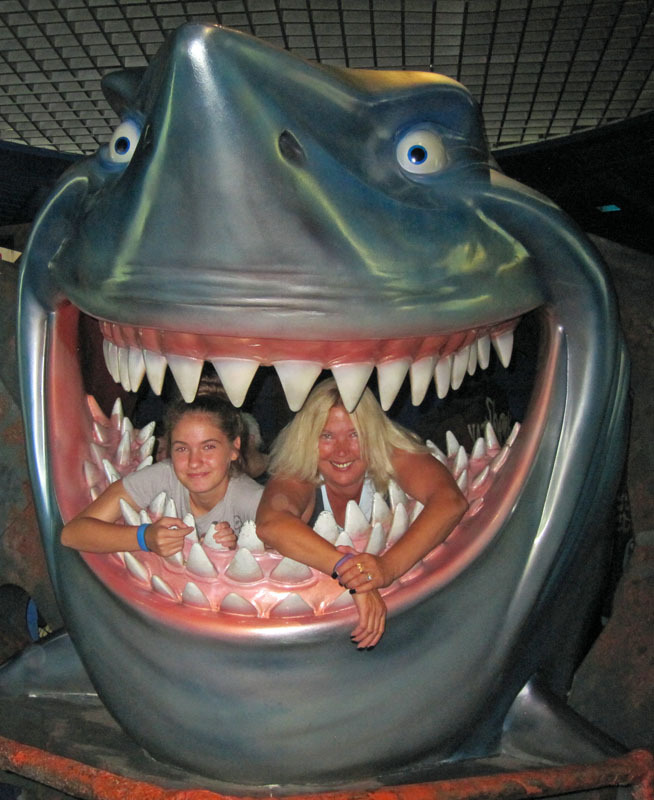 We rode The Seas with Nemo & Friends using fastpass. Afterwards we took photos with Bruce the Shark then waited for the next Turtle Talk with Crush. 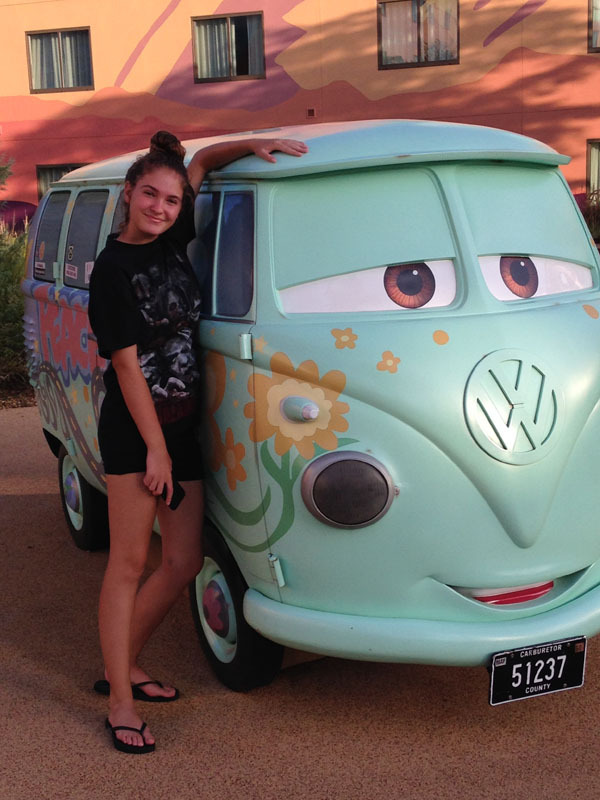 Turtle Talk has been updated to include characters from the Finding Dory movie. Crush was again hilarious. 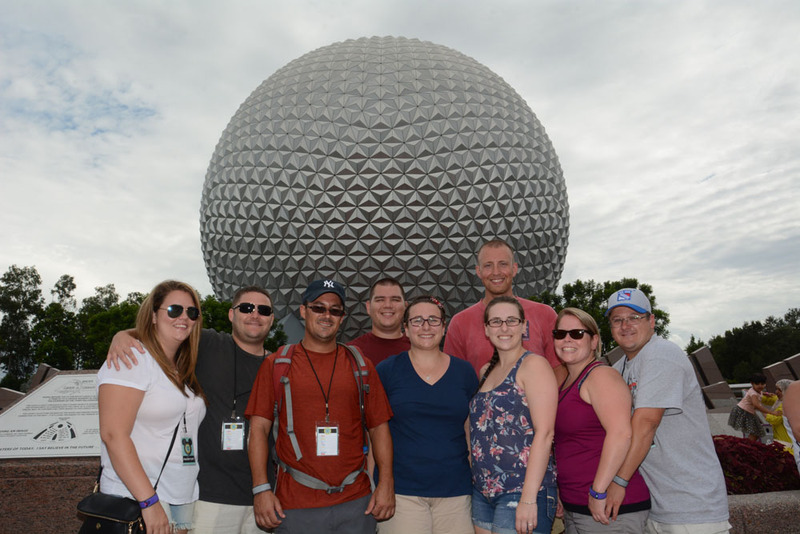 After taking photos under the Nemo statues outside, part of the group headed over to ride Spaceship Earth. Unfortunately some of our fastpasses were missing. Fortunately the missing ones were Tim, Marissa, Kelli B and I. We had ridden it in February. I was glad the others were able to ride. We went over to customer relations, but the line was out the door and not worth the wait. Instead we went on a Starbucks run over to Fountain View Café. 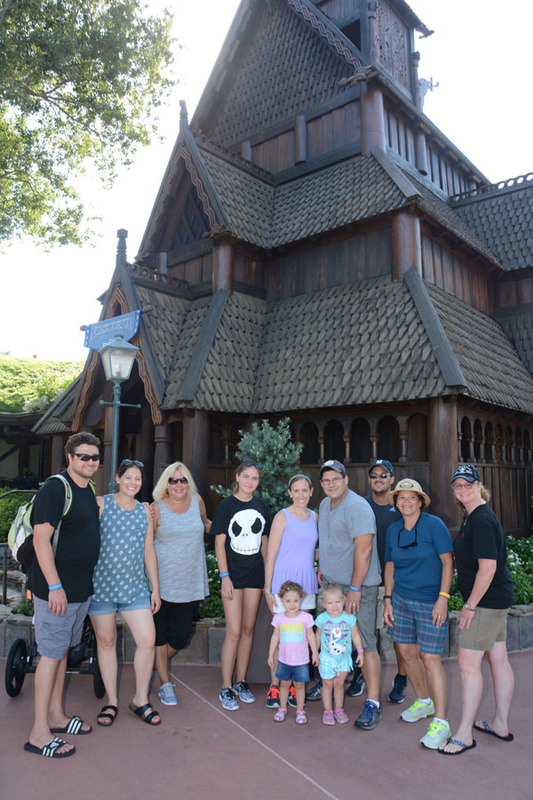 We had plenty of time before our 1:35 Fastpass for Frozen Ever After so everyone broke up and will meet up in Norway at 1:30. Ann, Samantha, Kelli B and I headed over to the Imagination Pavilion to check out the DVC Lounge. 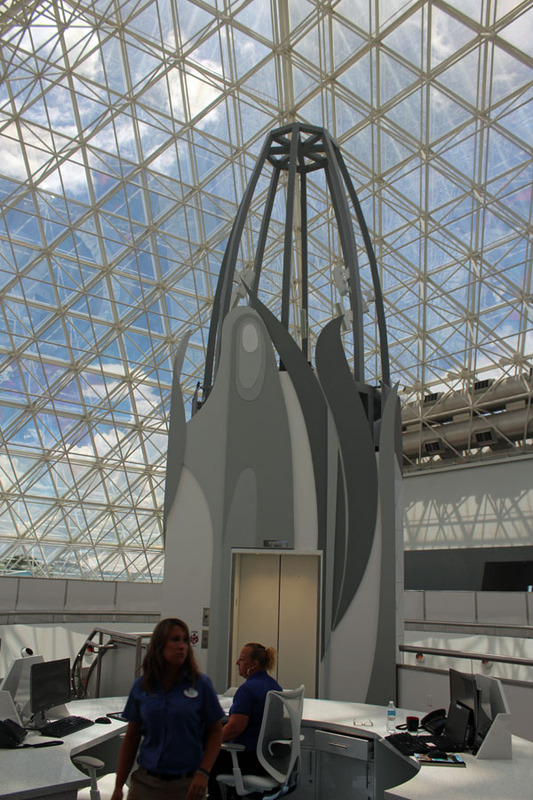 The lounge is located upstairs from the Imagination Pavilion gift shop. 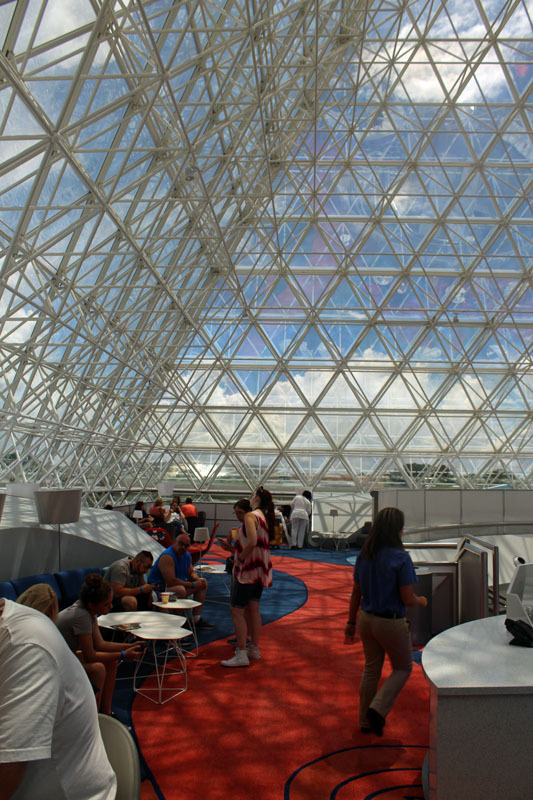 We took the stairs up and arrived to a beautiful sunlit room with the steel lattice pyramid overhead. There were some couches, lounge chairs and tables scattered about. Free coffee (Keurig machine) was available along with three Coke Freestyle machines, which offer more than 100 different soft drink flavor combinations. 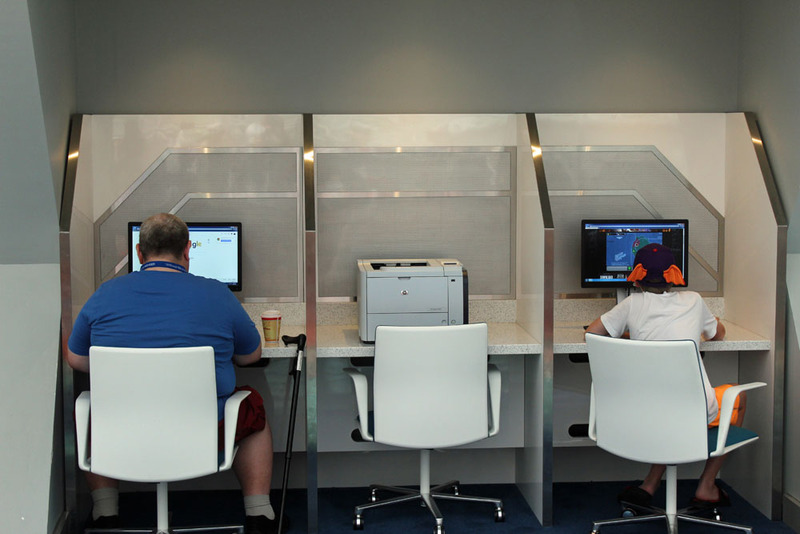 There were computers, video games, charging stations and printers to use. A cart came around with complimentary bags of chips, Doritos, and cookies. Best of all it was nice to relax in some air-conditioning. We did not spend a lot of time here. We were hungry. 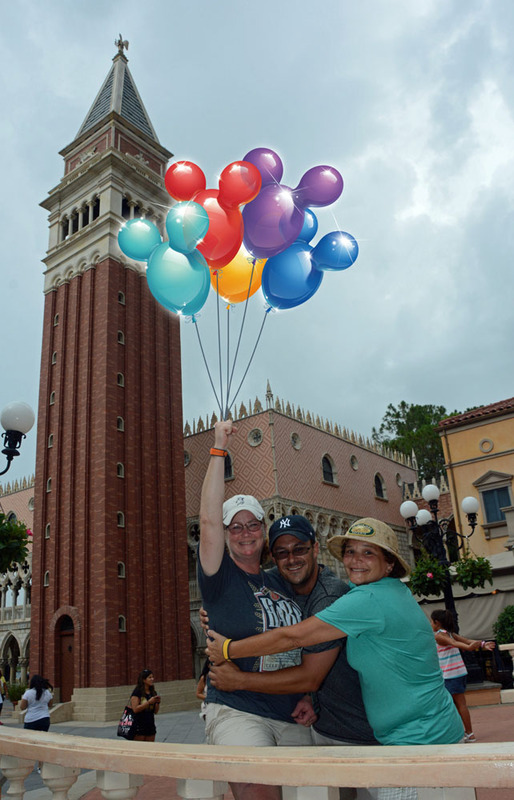 We headed to the World Showcase. Off to our right the sky was half sunny and the other half dark and threatening. 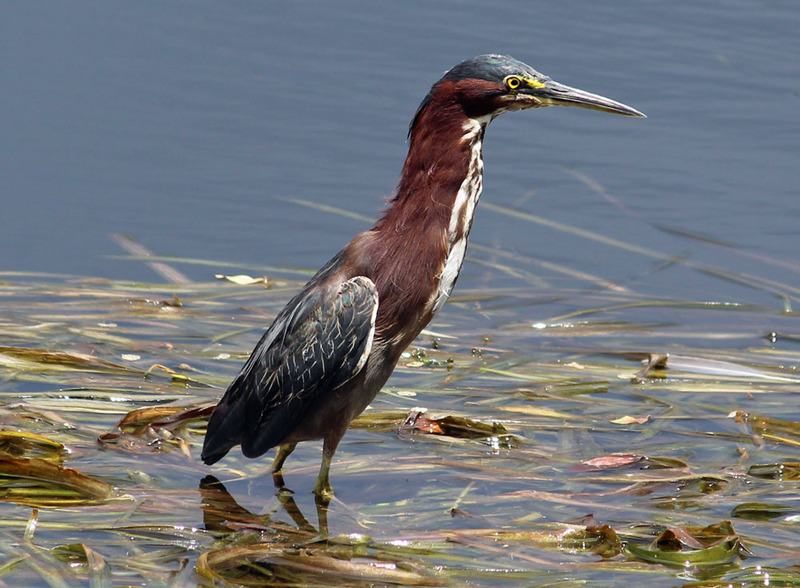 A Green Heron was sitting in the pond. We first headed counterclockwise to the Refreshment Port for some croissant doughnuts - tossed in cinnamon sugar. But it was closed! We reversed direction. Ann and Samantha ate in Mexico. Kelli and I decided on Kringla Bakeri Og Kafe. I had the Norwegian Club Sandwich and Kelli ordered the Norwegian Charcuterie. The charcuterie consisted of olives, cheeses and cured meats. This quickly filled us up and we could not finish. 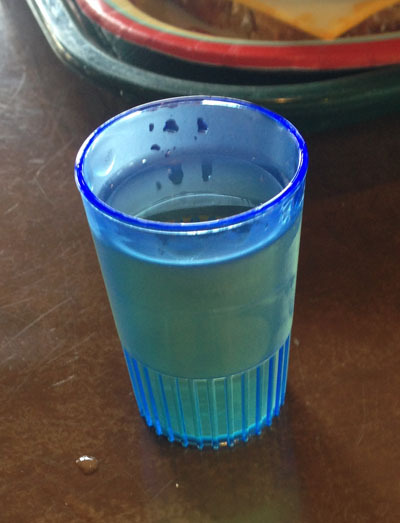 I also had the Linie Aquavit Glacier Shot. It reminded me of a flavored vodka. It is actually a Norwegian spirit made of potato distillation, and is flavored with herbs and spices. It is aged in sherry casks and travels the seas from Norway to Australia and back again. This is how it got its name. It crosses the equator or “Linie” twice. We met everyone in the Norway courtyard. A few drops of rain started falling. Our fastpass window for Frozen Ever After just opened up in time for us to make the dash in before the rain. The ride was great, but too short. 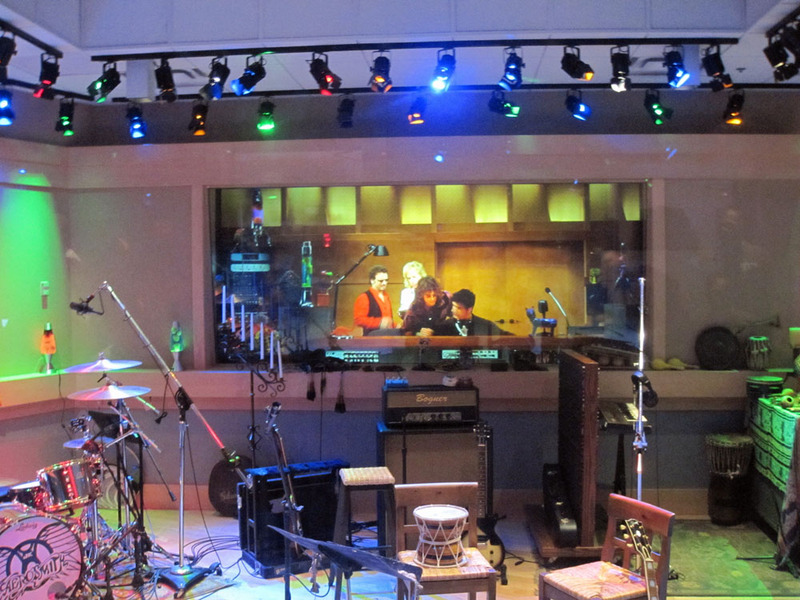 The animatronics were fantastic but it was a little hard hearing the music clearly. After that most people headed back to the resort for a swim or nap. We left for Animal Kingdom early. 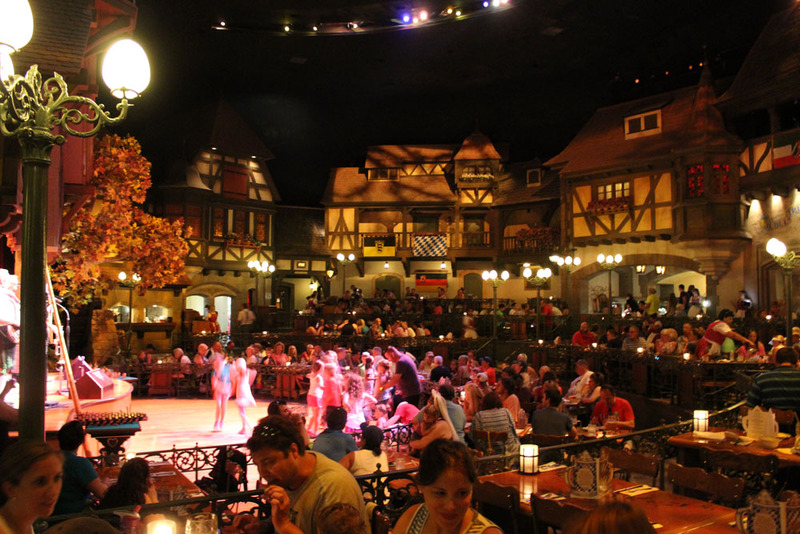 Tim and Marissa decided not to take Maddie to the character buffet at Tusker House tonight for obvious reasons. It was the two engaged couples; Katie & Sean, Kelli F & Evan, then little Hunter, Mike T., Lauren, Ann & Samantha, and Kelli and I. Once we arrived we had time for one attraction. Ann & Samantha, and Kelli and I did It’s Tough to be a Bug with a 5 minute wait. Samantha jumped for the bugs in the seat. We all met at Tusker for our 4:20 PM ADR. 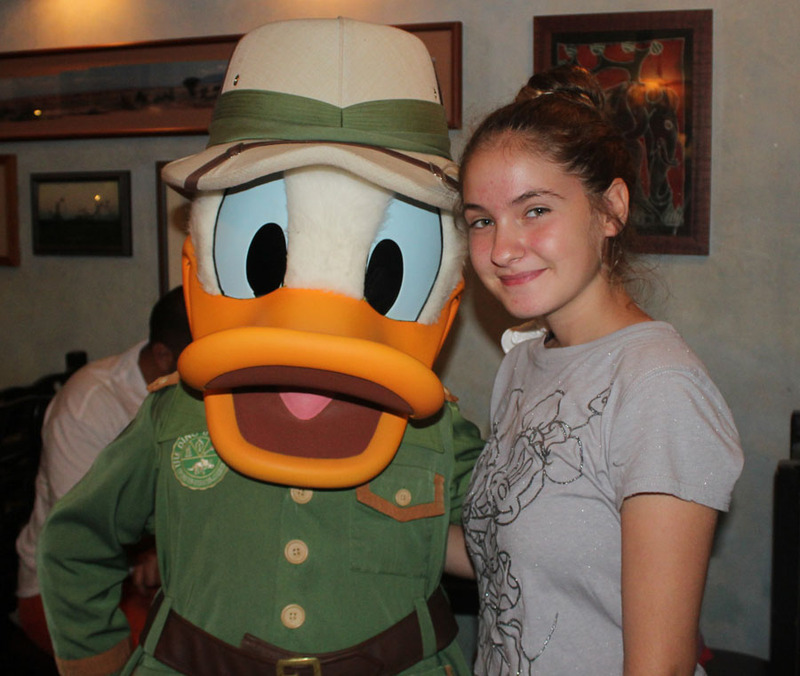 During dinner we met Donald Duck, Daisy Duck, Safari Mickey and Goofy. 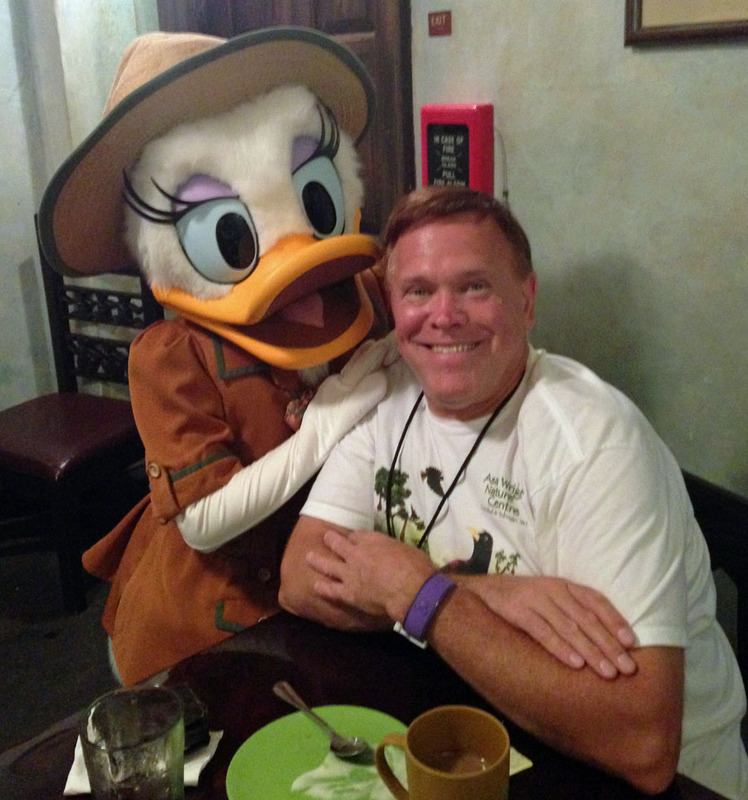 I had a nice interaction with Daisy, she must have knew I was with the Audubon Society. 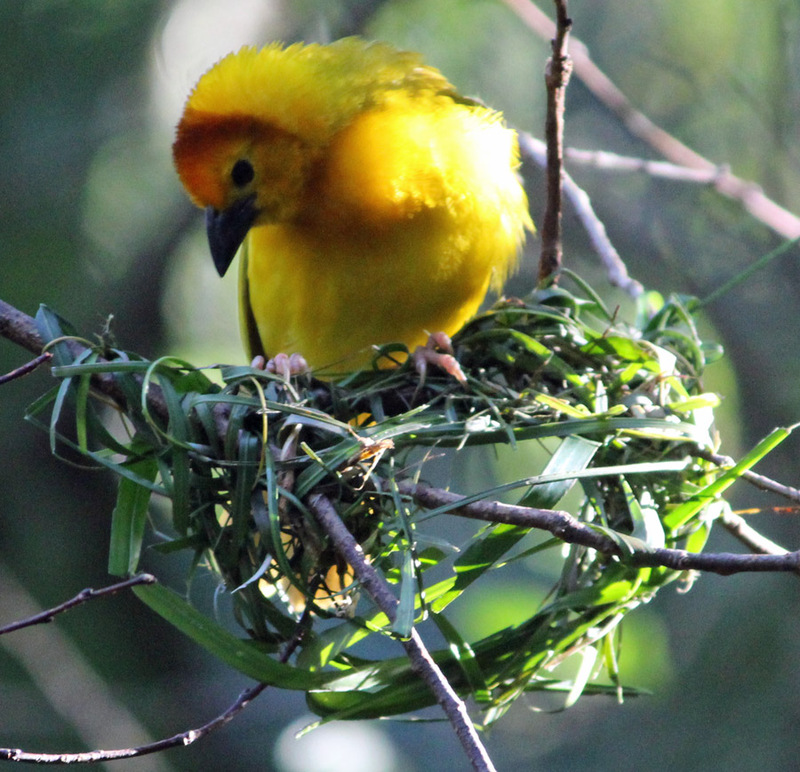 I also sensed that our parakeet at home, Penny, was getting jealous. Everyone enjoyed the food. There was plenty of traditional food as well as some more adventurous stuff such as Mealie Pap, Berbere rubbed sirloin, Peri-peri marinated Salmon, Vegetable Samosas with Mango Chutney, Blatjangs, Curry Chicken and Spicy Green Coconut Curry. I used my Tables in Wonderland card and saved $89.75 off the bill. It was $463.71 for 10 buffets, plus a Long Island Tea and 2 Safari Ambers. Some stayed to ride more rides. Kelli B and Ann went shopping. Samantha and I headed to Everest to ride. 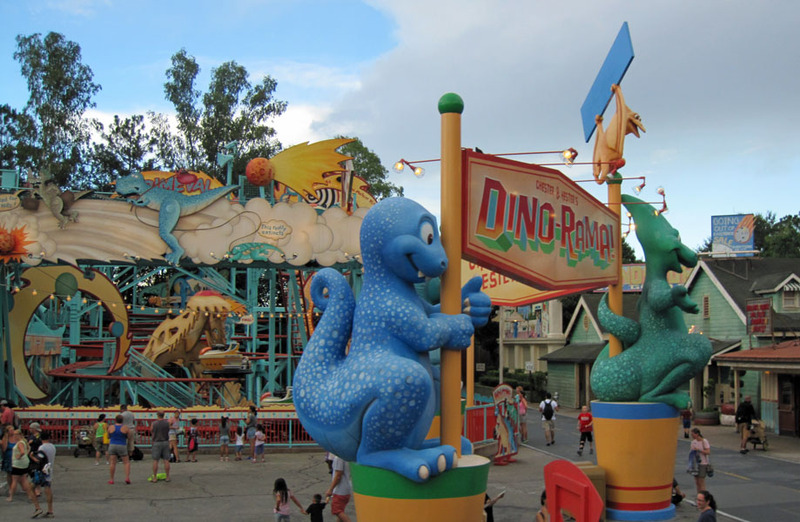 It was down so we continued over to Dinoland USA and rode Primeval Whirl twice. 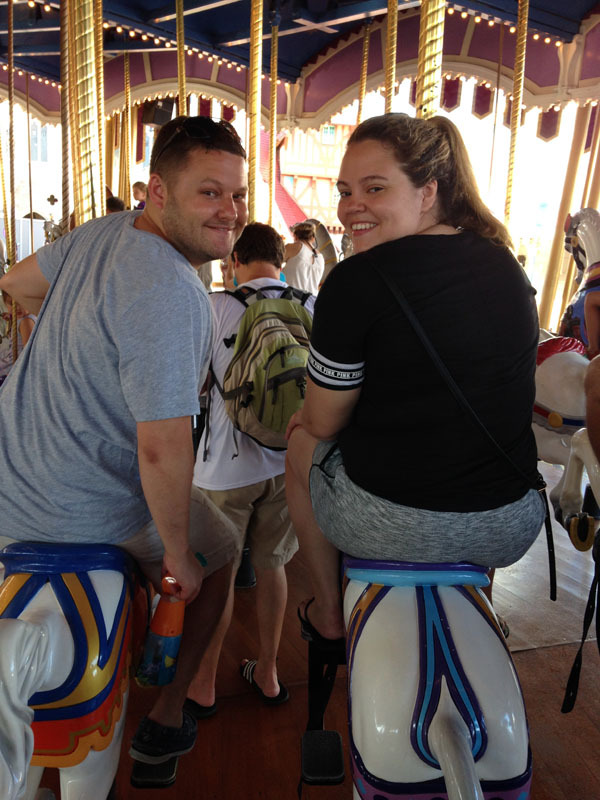 We met Tim and Marissa, I watched Maddie as Tim, Marissa and Samantha rode. 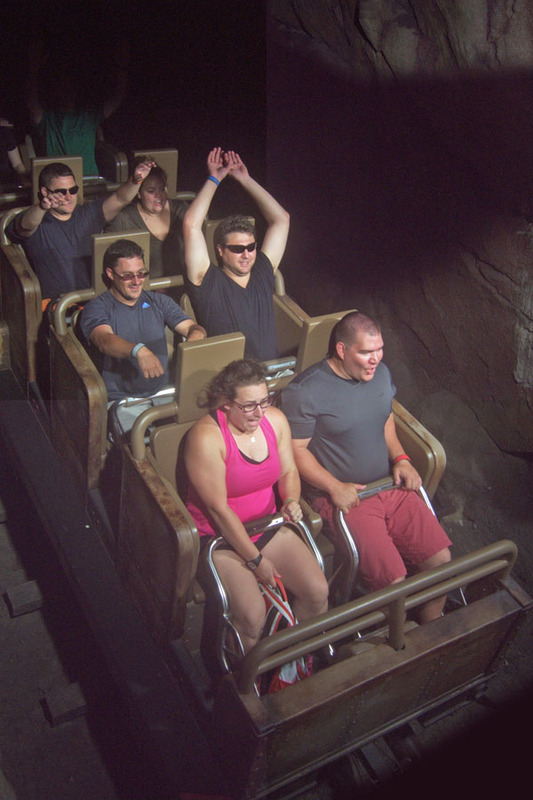 After that all five of us did TriceraTop Spin. 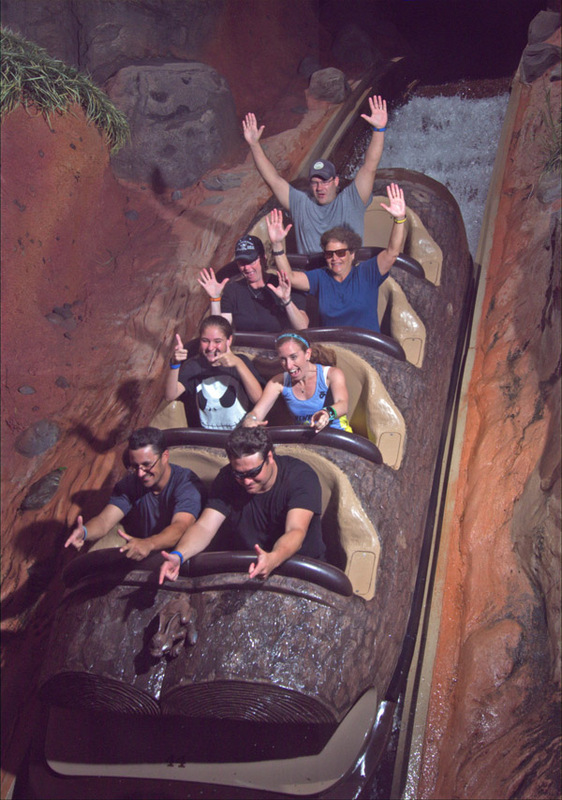 It looked like Everest was back up and running so we rode that then met up with Kelli B and Ann before heading out. 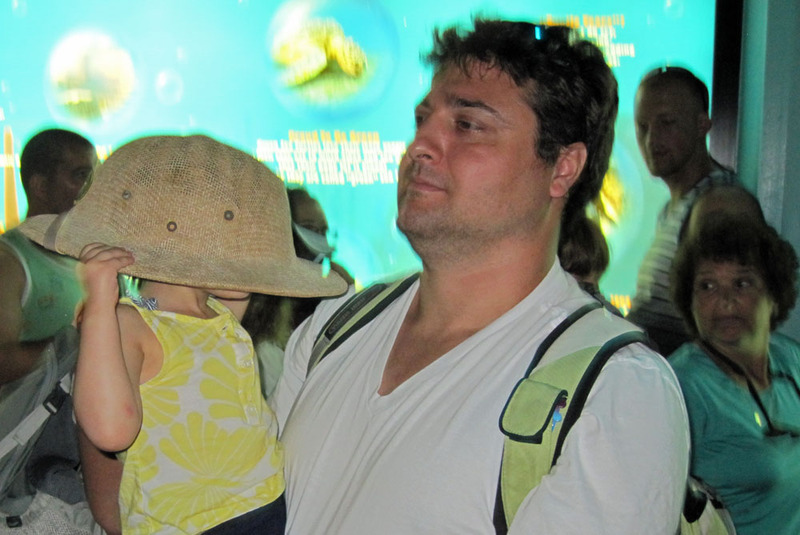 Tim, Marissa and Maddie stayed for the "The Jungle Book: Alive with Magic" show. They loved it. Back at Pop Century we enjoyed more fireworks in the back. We woke up early at 5:30 and had a quick breakfast of cereal, but with a side of bacon thrown in. We were at the bus stop by 7AM to head to the Magic Kingdom. As expected; on a morning with no Magic Hours they opened the park early. Opening ceremony started at 7:42 for the published 8 AM opening. Smokey Miller of the Volunteer Fire Department led the festivities. The stragglers in the group caught up with us towards the end of the ceremony. 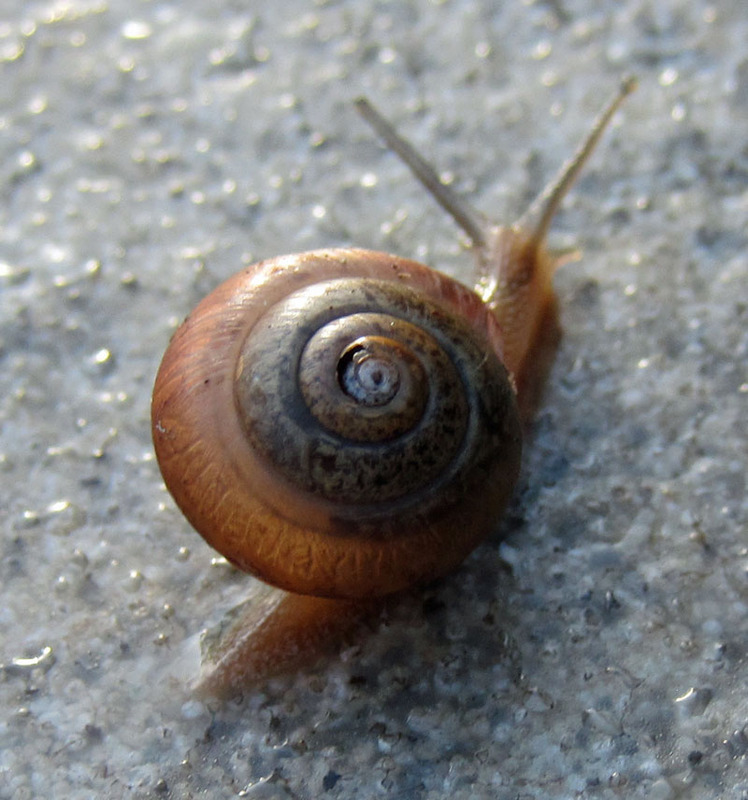 We also found a cool small snail on the wall. 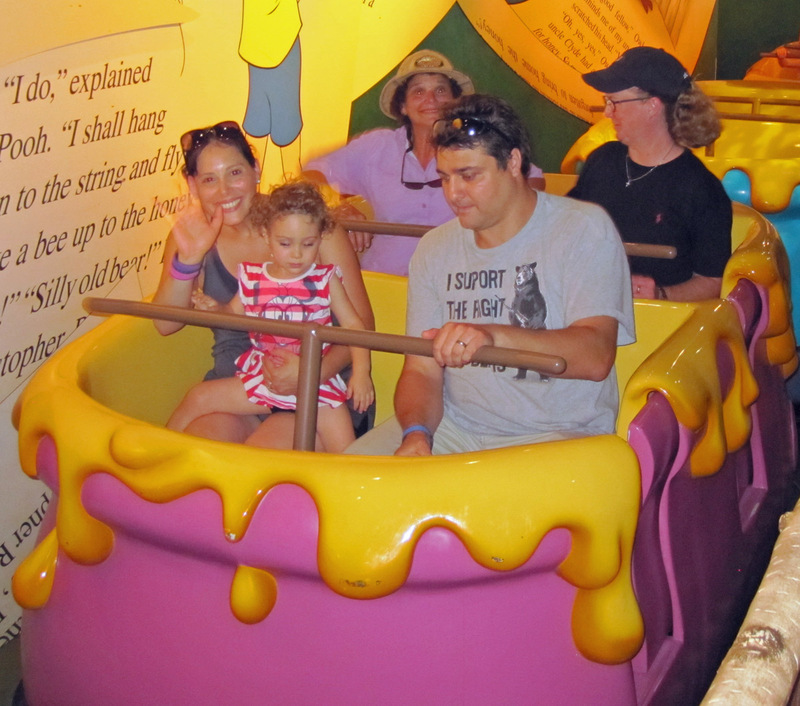 We then took advantage of the early opening by riding Peter Pan’s Flight followed by The Many Adventures of Winnie the Pooh and Under the Sea- Journey of the Little Mermaid with little wait. 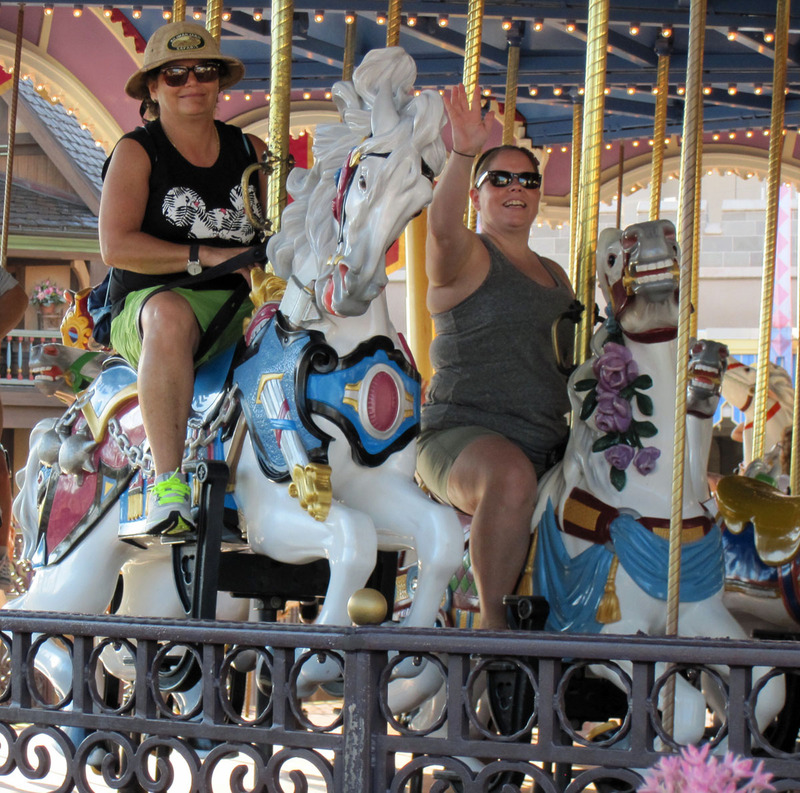 Then it was on to Prince Charming Regal Carrousel. 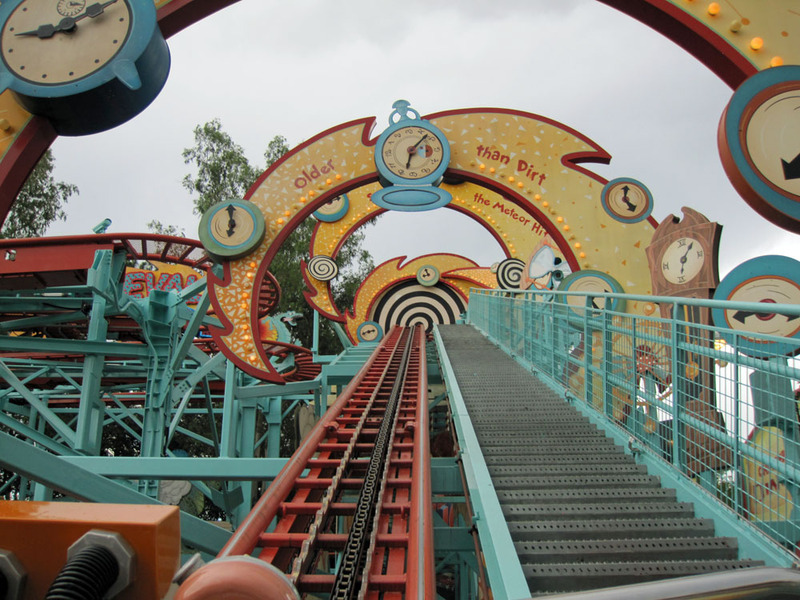 It’s been years since I rode this. Next was ear worm time. 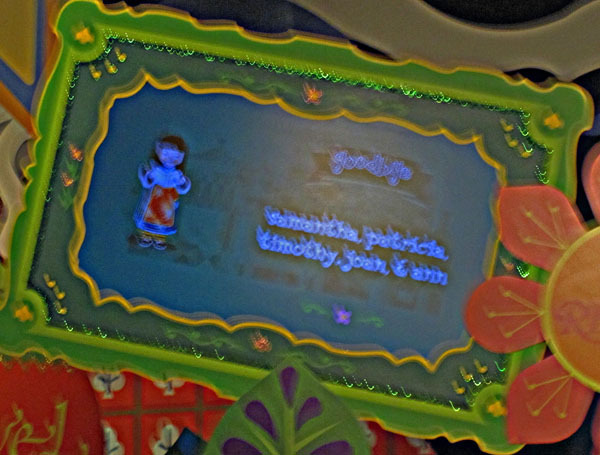 Let’s sing it together… it’s a small world after all… At the end where there are signs of Good-bye in many languages; electronic signs rotated our names in small caps; same as the ride title. The names were grouped together; michael and lauren; marianne, caitlin, michael, amanda, kevin; madeline; samantha, patricia, timothy, joan, ann. As our group was getting off the boat as the rest of the group was heading on. 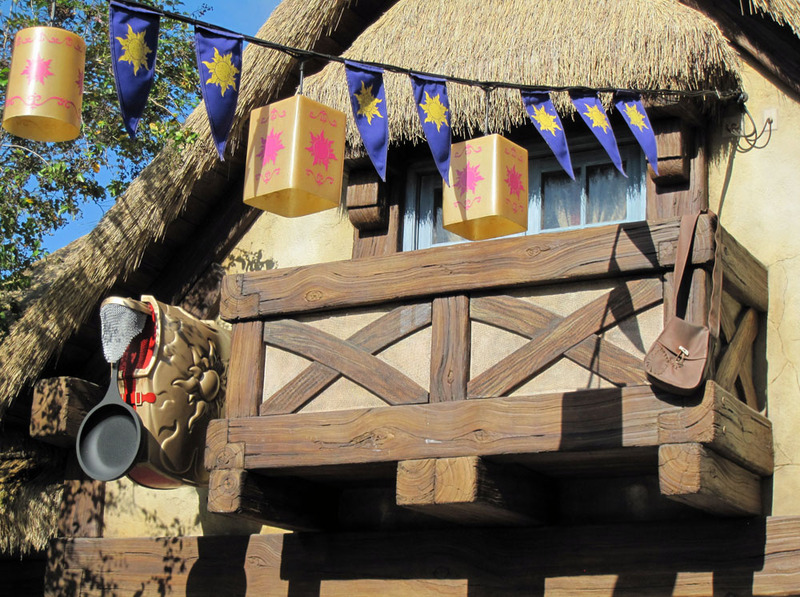 We stopped at the Tangled rest rooms and I noticed the satchel and the frying pan on one of the balconies. We still had time before our first fastpass for Splash Mountain at 9:55 AM so we popped into the Haunted Mansion. The ghosts at the end on your doombuggy were not there, I guess they were on a ghost union break. 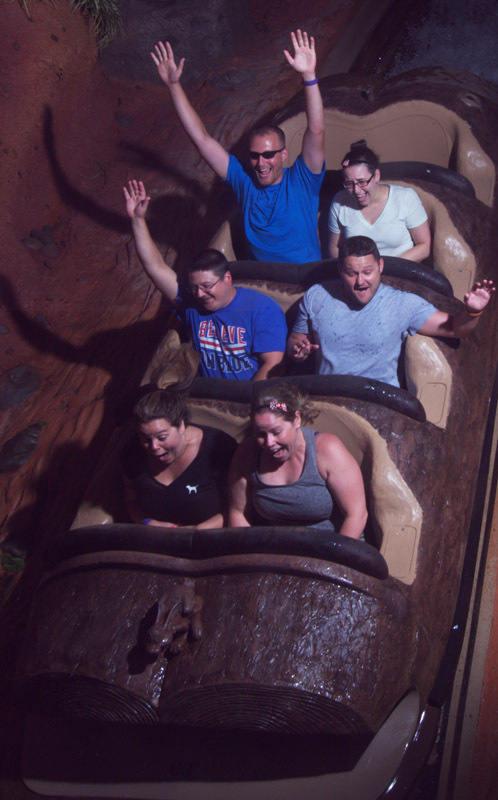 A few sat out Splash Mountain and entertained the kids. 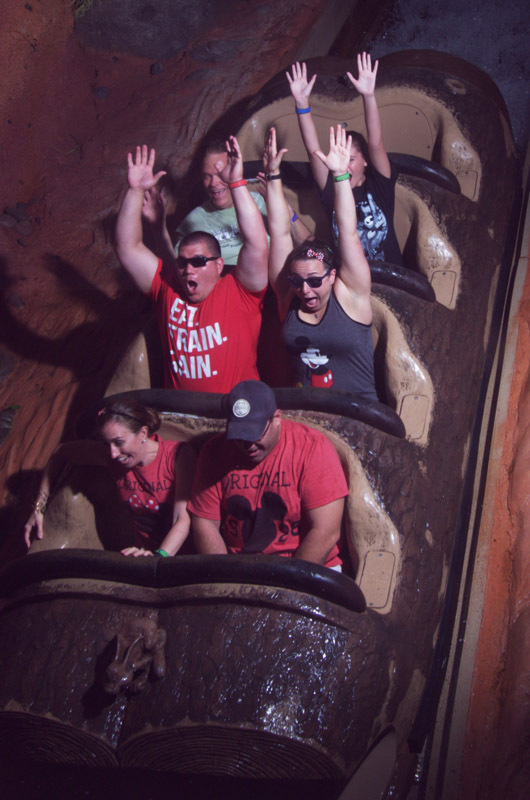 No one got too wet on the ride. 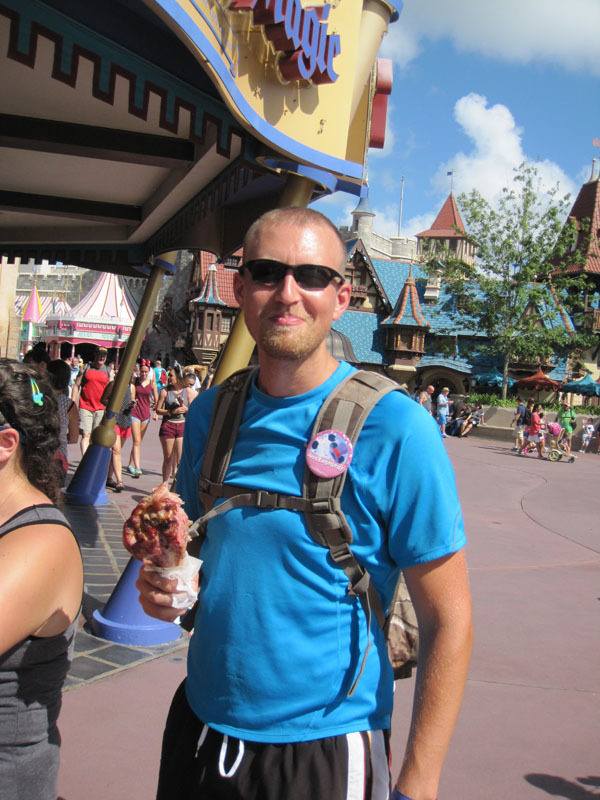 Afterwards, Sean grabbed one of Disney’s famous turkey legs. 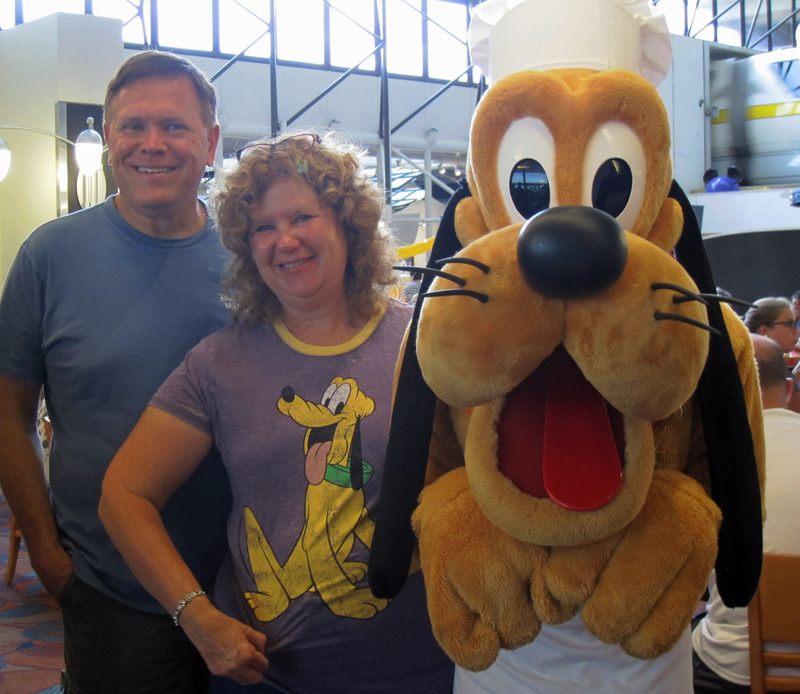 We had time before for our next Fastpass so the cool air-conditioned Mickey’s PhilharMagic called us. Will Donald ever learn? 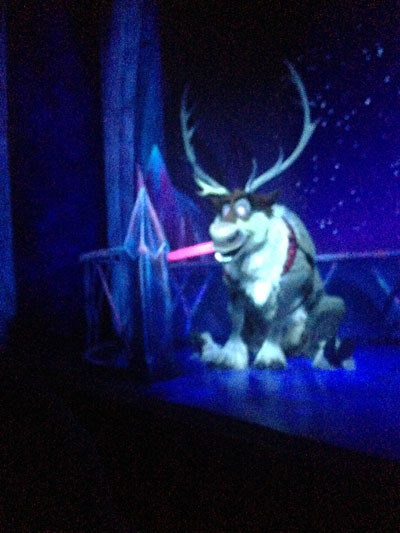 This is still the best 4-D movies in all of Walt Disney World. Finally is was time for Seven Dwarfs Mine Train. I had trouble getting into the seat, but squished myself in. Kelli, Ann, Samantha and I ate a light lunch of some very good artisan mac n cheese at the Friar’s Nook before heading over to Tomorrowland. 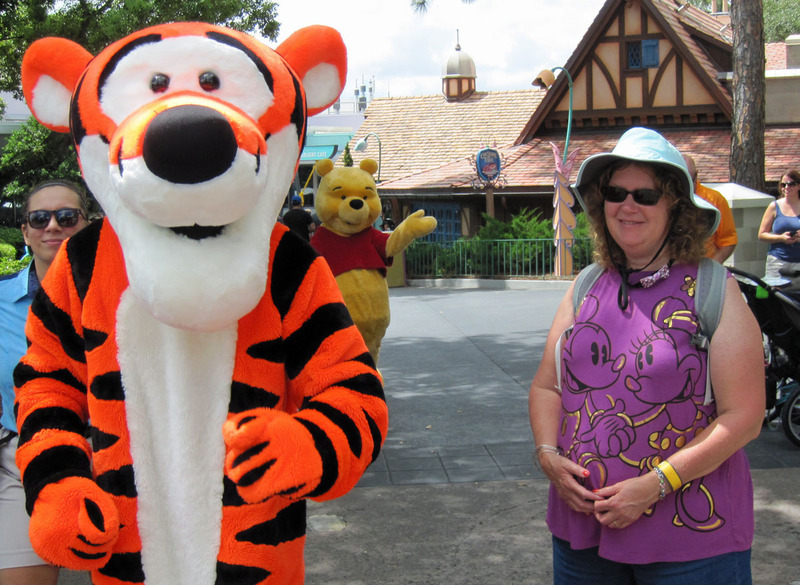 We passed Tigger on the way. 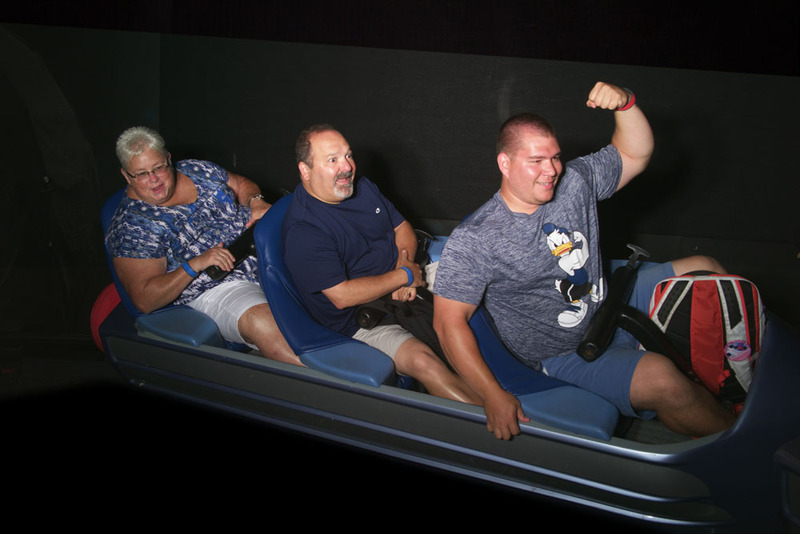 Space Mountain was down for our next Fastpass so some of us headed back for the pool. 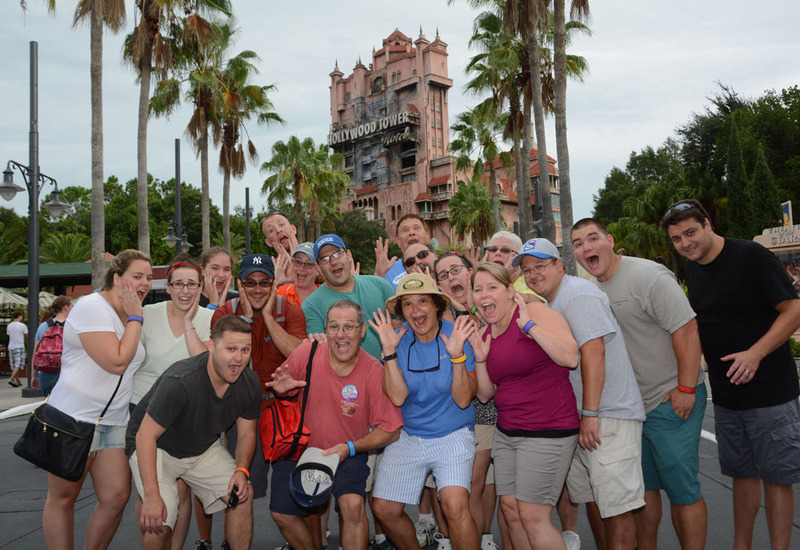 Tim asked if anybody wanted to keep their Haunted Mansion Fastpass for tomorrow. It was funny as Kelli F was shaking her head NO while her fiancé Evan was shaking his head YES behind her. 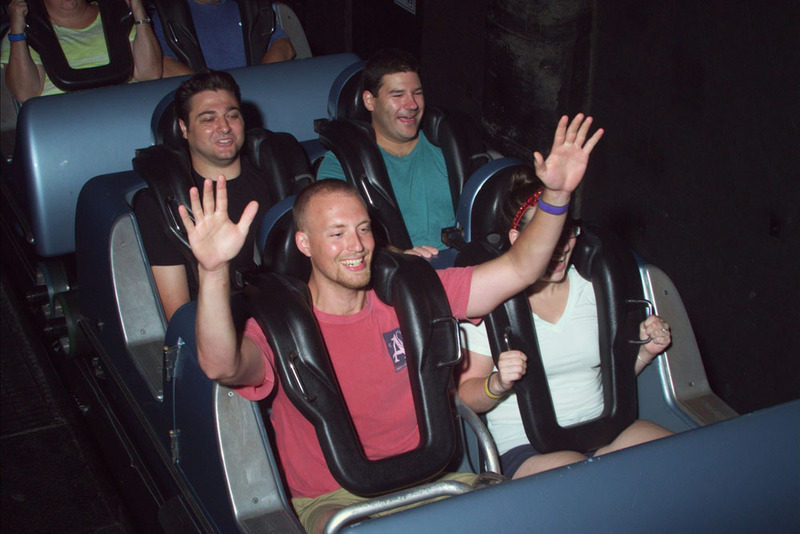 He was also able to change the Space Mountain Fastpass to Rock n Roller Coaster to later tonight due to the ride being down. 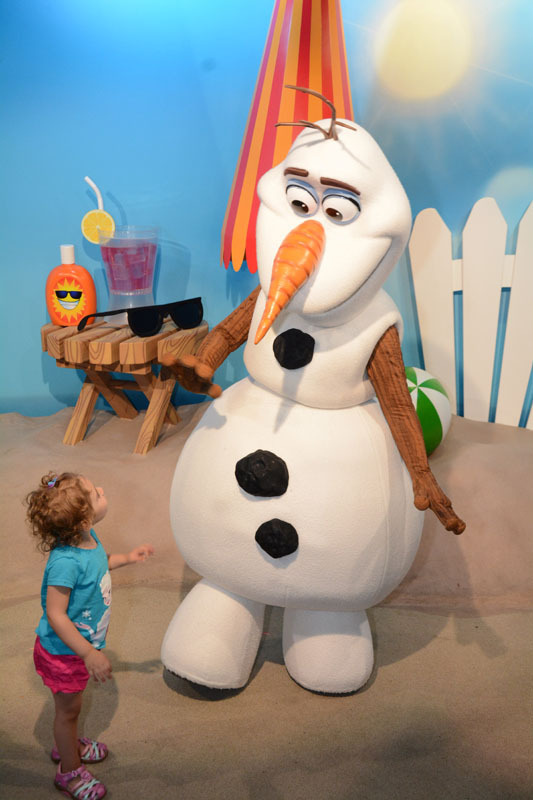 Our bus driver took us to the wrong resort and headed into the Art of Animation. Once he realized his mistake he headed back onto the road. YMCA came on the bus sound system; Rich Jr yelled out "...young man" and the whole bus started singing and doing the moves before we reached Pop Century. Back in the room we had a one hour nap. Kelli B. and I brought down a single cup coffee maker and coffee. We made some after we woke; and we realized we should have been using the coffee maker days ago. Refreshed, we headed to Hollywood Studios at 3. We again got the bus right away so we took a picture on Hollywood Boulevard and shopped in a few stores; Keystone Clothiers and Mickey's of Hollywood. In the Celebrity 5 and 10 I found some much needed luggage tags featuring Goofy and Donald. We checked into 50’s Prime Time Café. All 25 of us are eating here. While waiting in the Tune-in Lounge a couple of Citizens of Hollywood, or Streetmosphere characters stepped inside. It was Bo Wrangler, an actor and Hollywood Gossip Reporter. They started doing their skit with the reporter asking about all the jobs Bo had prior to becoming an actor. The jokes were corny but funny. One of them was that Bo was once a Make-up artist. He added that it is not hard to become one – because it’s easy to apply. Ba-dum-tss. We sat as two different groups. We had Cousin Ryan. I started off with Dad's Electric Lemonade - an electrifying blue drink with Bacardi Superior Rum, Skyy Vodka, Blue Curaçao, Sweet-and-Sour, and Sprite. It came with a glow cube. Entrees included Caesar Salad with Salmon, Grandma’s Chicken Pot Pie, and Aunt Liz's Golden Fried Chicken. Marissa ordered the gluten free Chicken Pot Pie. I had Dad's Brownie Sundae for dessert while Kelli had the S’mores. 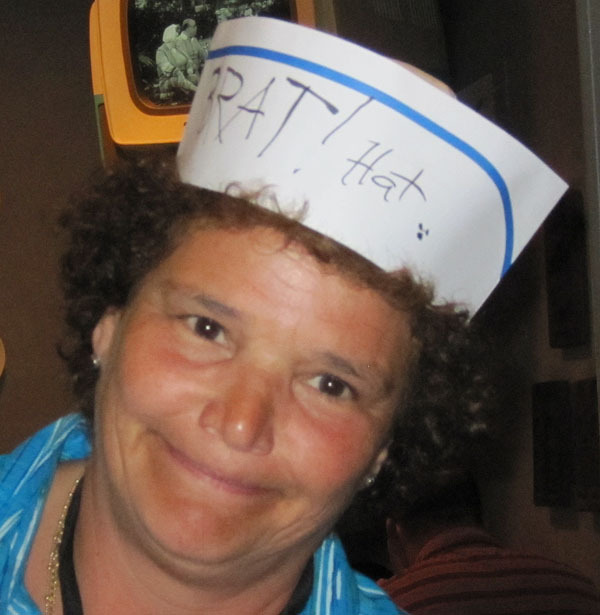 During dinner we all scolded Patty as a tattletale. Marianne visited from the other table wearing a Potty Pass hat. She said their server called Amanda, "Princess Highlights". Cousin Ryan said her hat won’t do. He reversed it and wrote Brat Hat on it. I put the glow cube in my mouth to entertain little Maddie. It was a fun and satisfying dinner. 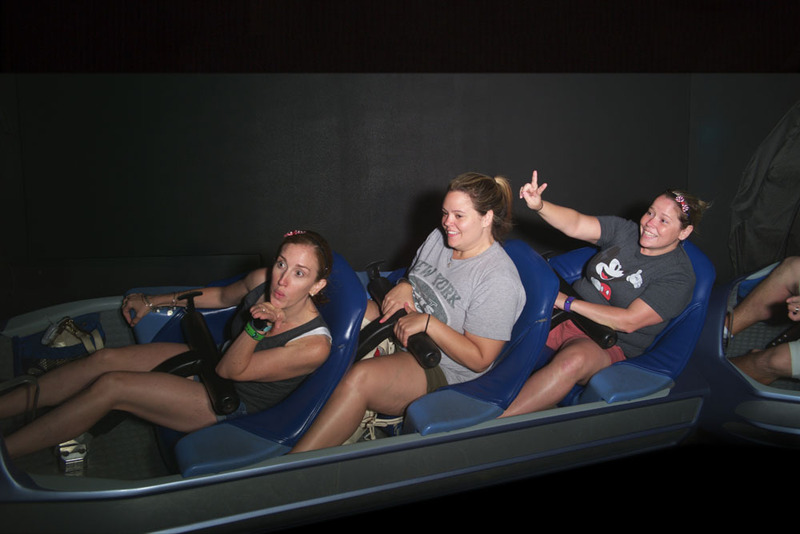 Kelli, Ann, Samantha and I headed over to the Star Wars Launch Bay. 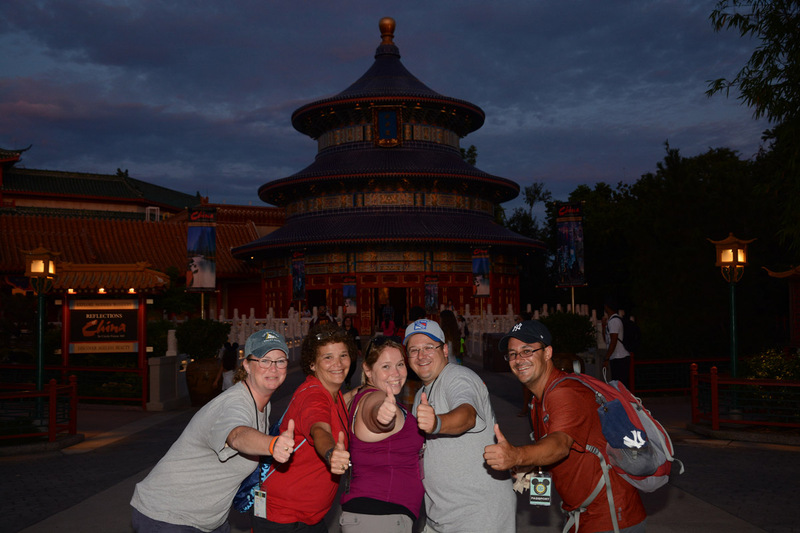 A photopass photographer called us over to take a picture with others in front of the Chinese Theater. We were a bit confused at first. 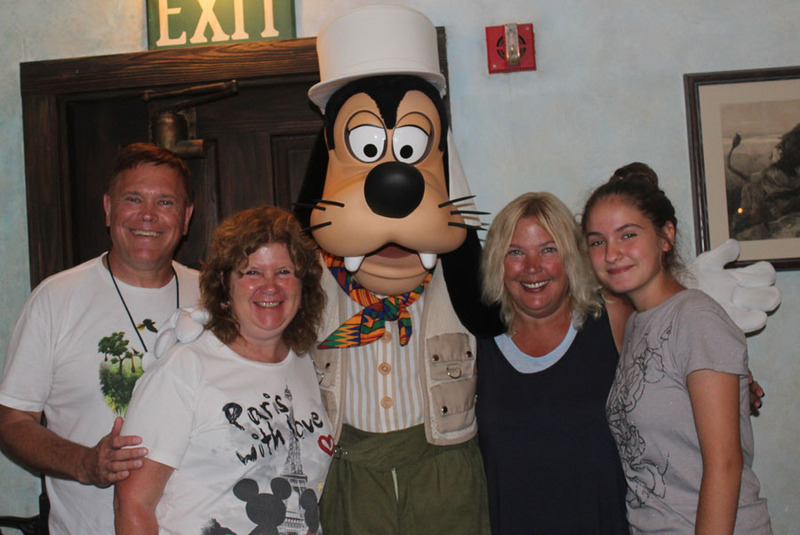 It so happened that a guest visiting alone wanted a picture. When the photographer asked where his family was he said he was visiting alone. The photographer would have none of that and he recruited over a hundred passerby’s to be his "family" for the group shot. 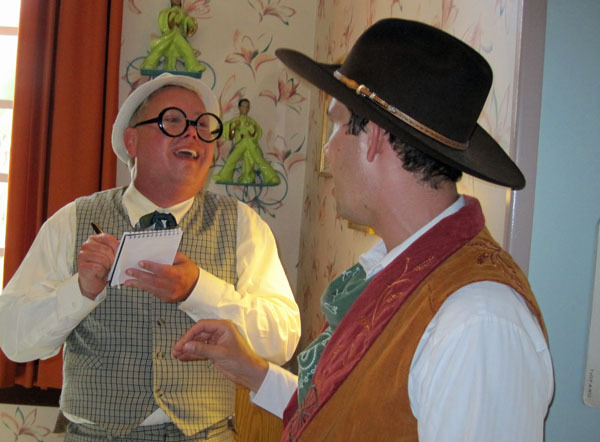 It was nice helping to add some pixie dust to another guest. 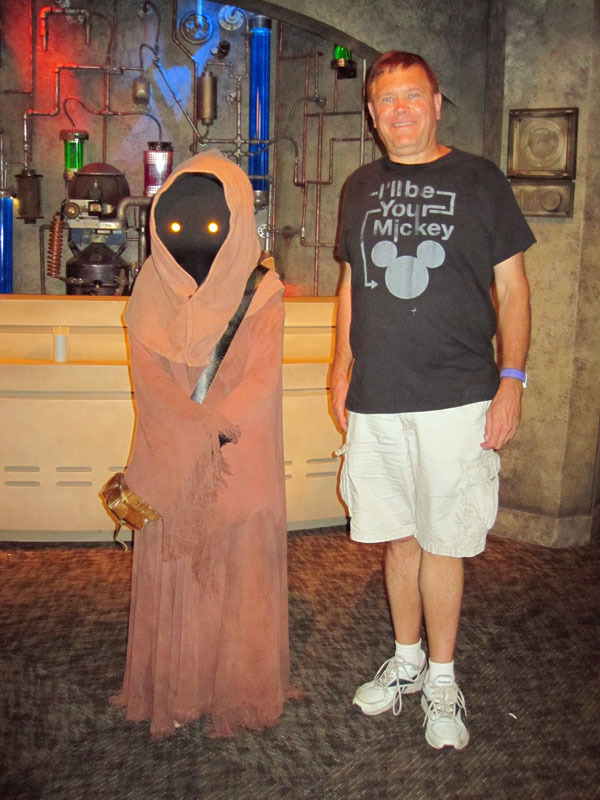 We saw the film “Dreaming on a Galactic Scale” and I took a photo with a Jawa but did not barter with him. Samantha wanted to see the Indiana Jones Epic Stunt Spectacular as we eagerly agreed. We needed some AC so headed into Walt Disney: One Man’s Dream and saw the extended preview of Pete’s Dragon. Now we want to see the movie. It looks great. 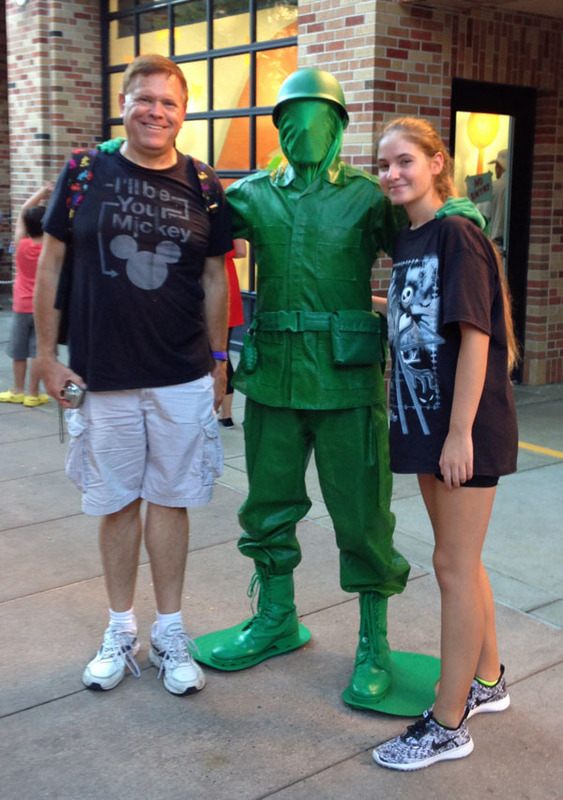 We took some pictures with the Green Army Men. Kelli and Ann headed over to Toy Story and Samantha and I headed to the Rock 'n' Roller Coaster and met up with others to use the reallocated Fastpasses. After riding we headed back to Kelli and Ann. The four of us relaxed at the closed end of Pixar Place watching people stroll down then make a U-turn when they could not go any further since the area is now closed off for the future Star Wars area. We stopped at Starbucks before finding a spot for Star Wars: A Galactic Spectacular. The show was spectacular. Besides fireworks there were projections onto numerous buildings, lasers, and giant hot columns of flames. It took a while to exit and get back to the resort. Most people had retired to their rooms when we got back around 11 PM. 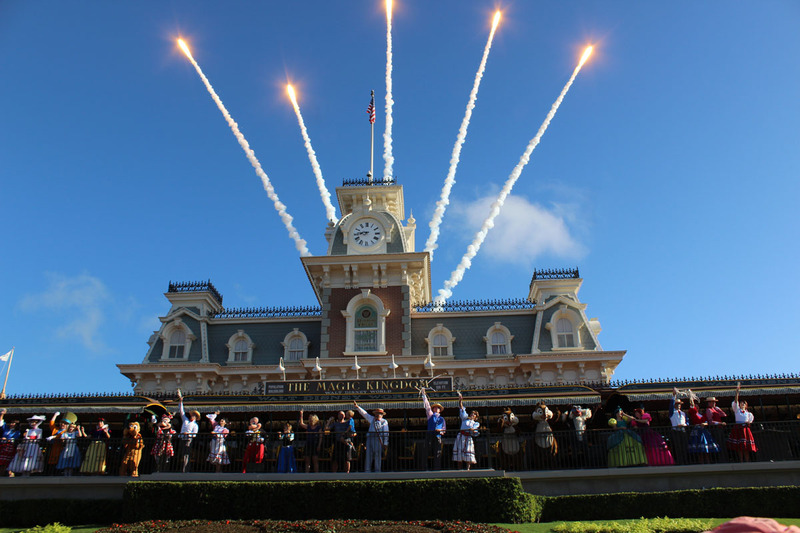 Today is group picture day when we all head to the Magic Kingdom for rope drop and a picture on Main Street. We had an extra hour of sleep since the park doesn’t open till 9 AM. On our way back to the room after breakfast we saw Mike F. and Amanda heading to the airline check-in with their luggage. They are leaving today. 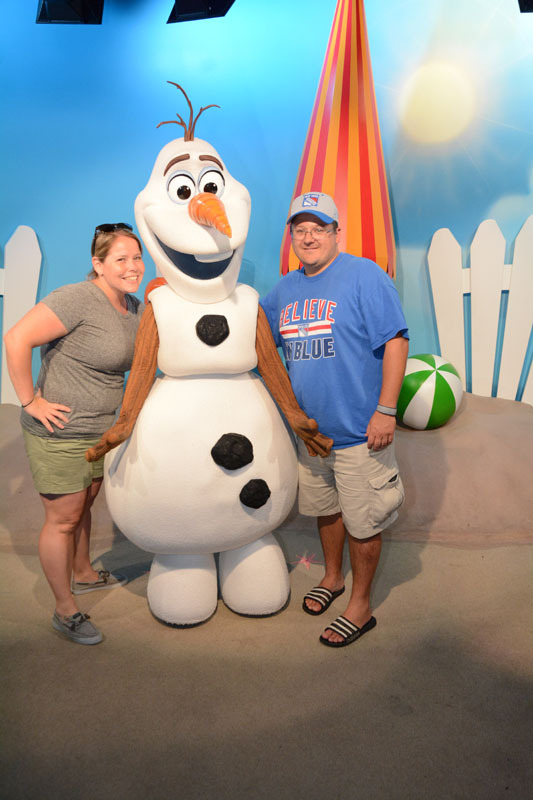 We were both a bit sad that our vacation would be ending soon, but a bit envious of Mike and Amanda in getting to relax back in NY after some very tiring and hot days here in Florida. 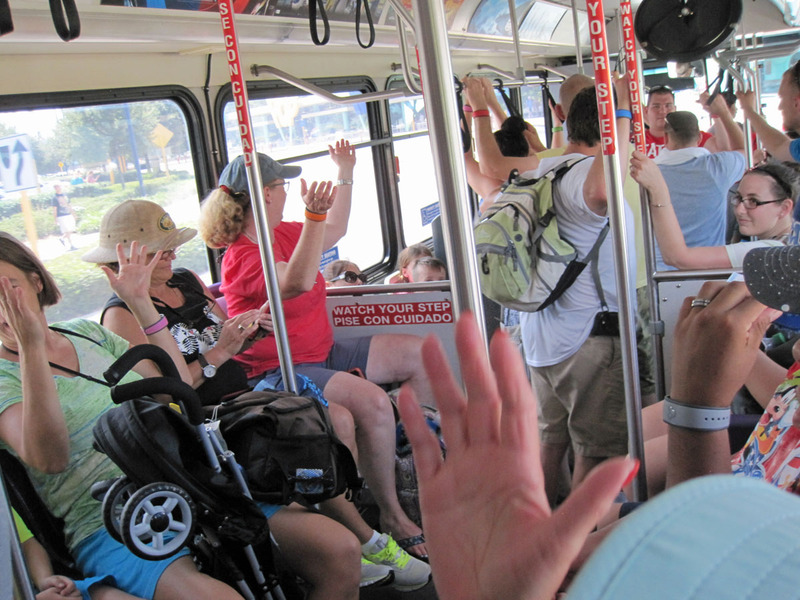 Everyone was on time for the bus to the Magic Kingdom. Security had the usual exit area set up as an extra security entrance. 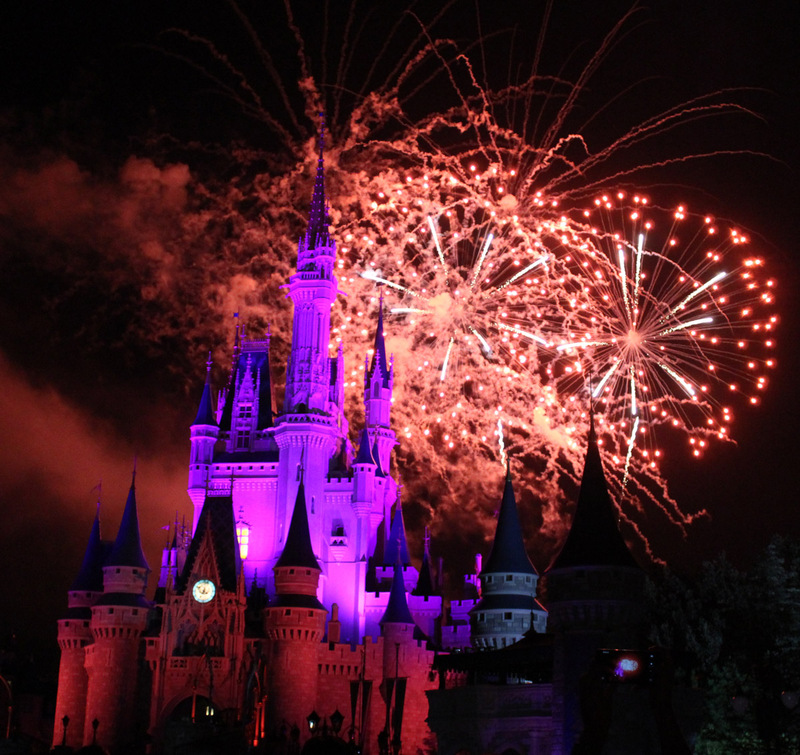 It did not make sense since the park had extra magic hours last night. The crowds will be light today. All 25 of us watched the opening ceremony. This time the Mayor of Main Street led the festivities. 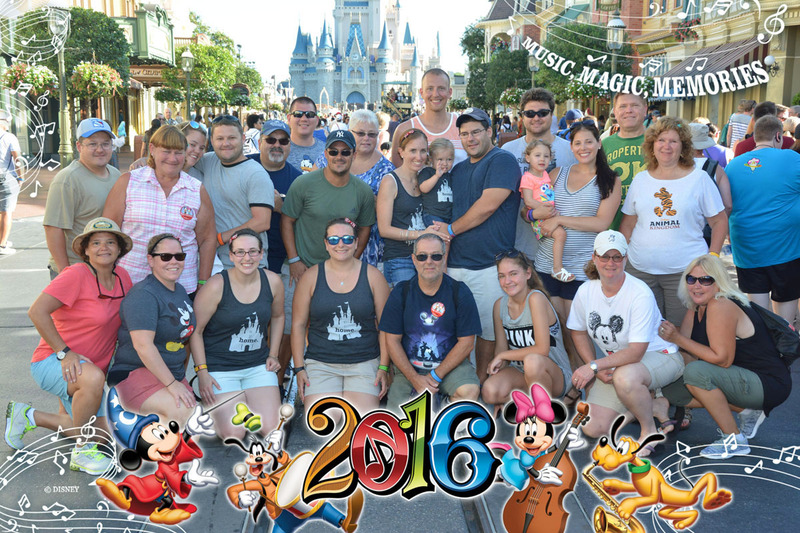 We selected a photopass photographer on Main Street to take the pictures of all of us. He did a good job positioning us and making sure everyone’s face was visible. 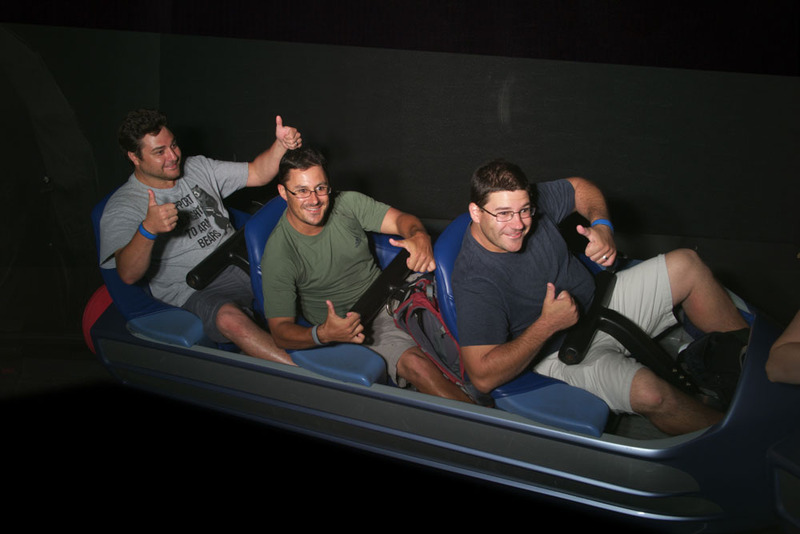 Since we missed Space Mountain yesterday the plan now was to hit it after rope drop. Lines were nonexistent so we rode twice. Next was Buzz Lightyear. The standby line was only 10 minutes, so we rode using that line. Then went right back on using our fastpasses. 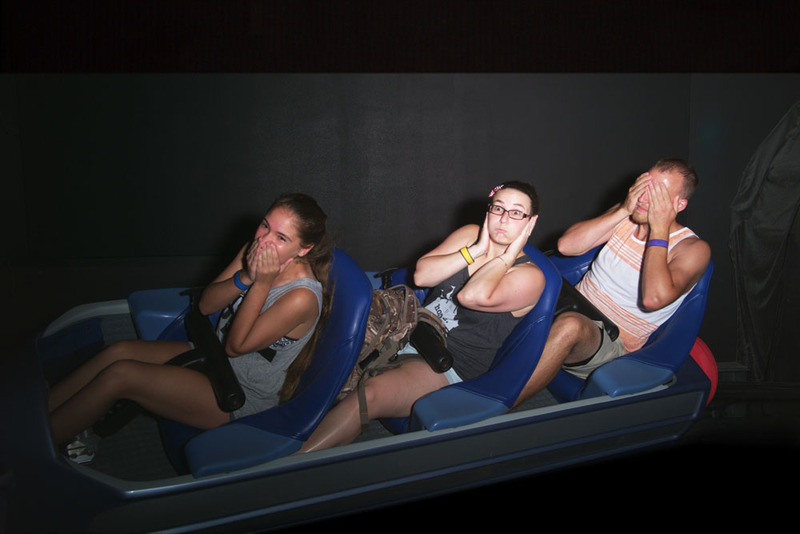 The ride pictures were only 10 minutes apart! 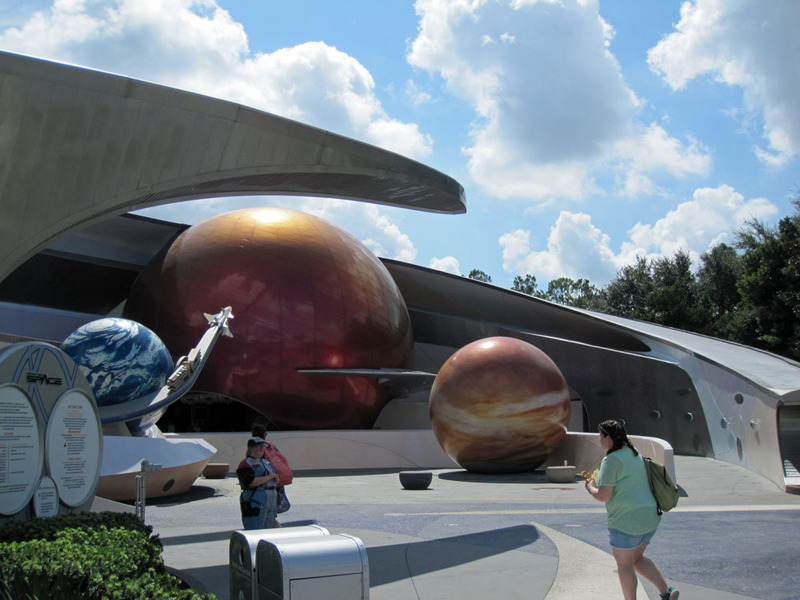 Since the Carousel of Progress was right there we all looked for a “… great big beautiful tomorrow. Shining at the end of everyday”. 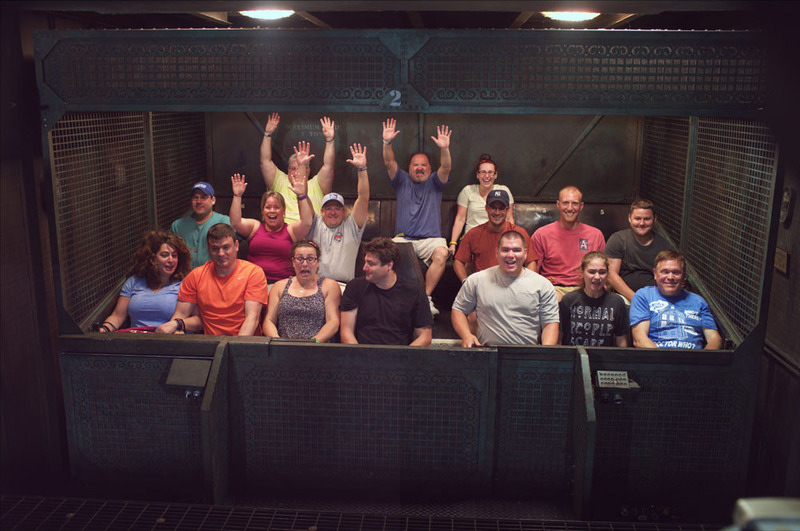 We did miss one rotation since the cast member forgot to let us into the theater. He was so lazy he only let the handicap entrance in and forgot about us. The big group broke up. 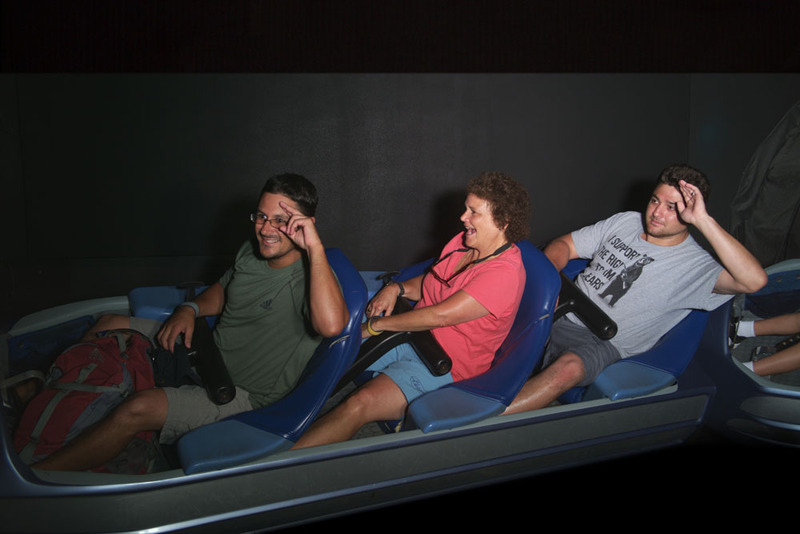 A few of us first tried for the People Mover but it was down, so we got online for the Laugh Floor. Five minutes later they had everyone exit the line. The Laugh Floor would be down for a while too. It looked like they were testing the People Mover with empty cars, as we approached the entrance they open up! We crossed the hub and briefly watched some of the Move It! Shake It! Dance & Play It! Street Party, but it was way too hot to dance. Kelli then headed to Main Street to shop while Ann, Samantha and I continued on to Adventureland to meet up with everyone to ride Pirates. We met them at the misty and water shooting Tiki statues. 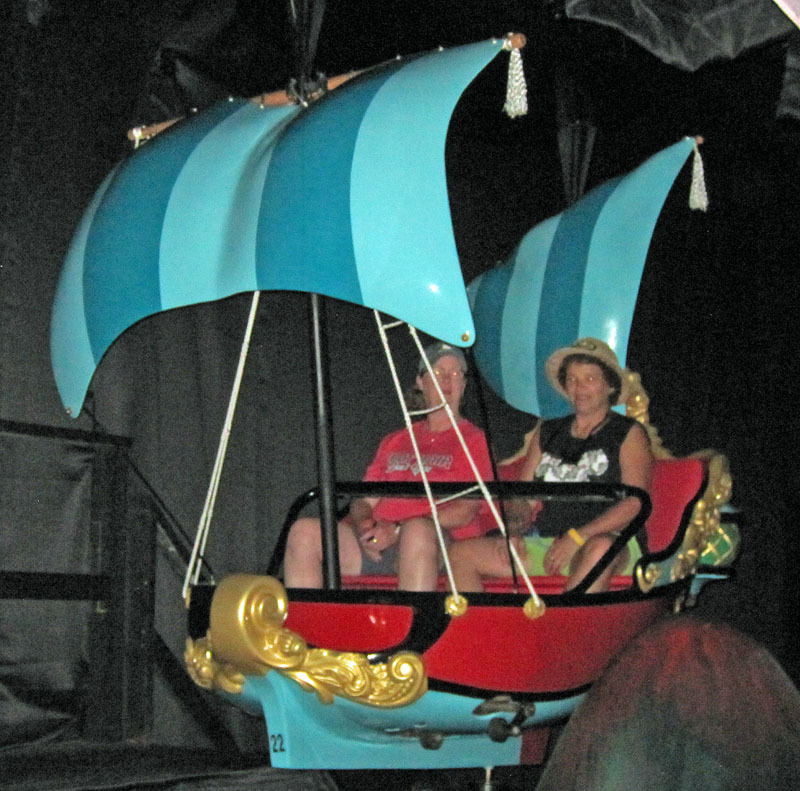 We rode Pirates of the Caribbean using Fastpass, then headed out. 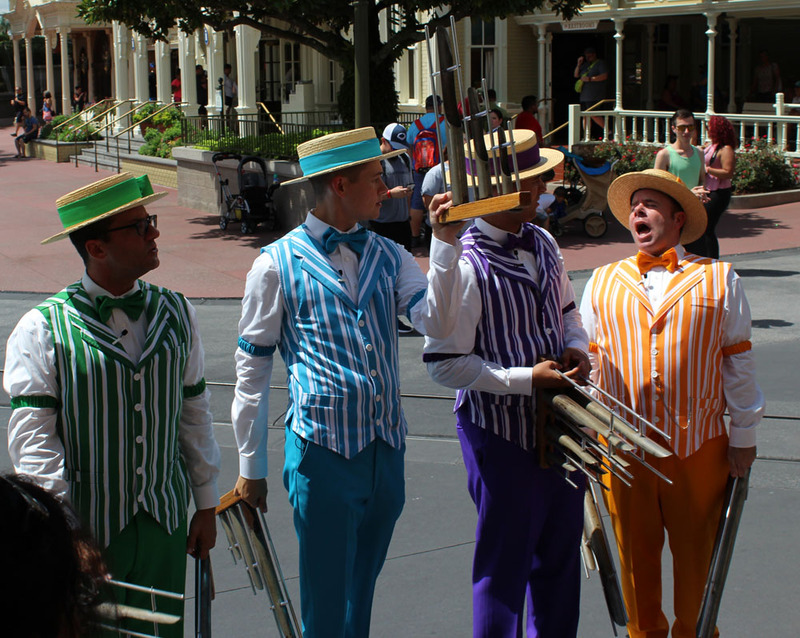 We met Kelli B at the end of Main Street where the Dapper Dans were finishing a set. 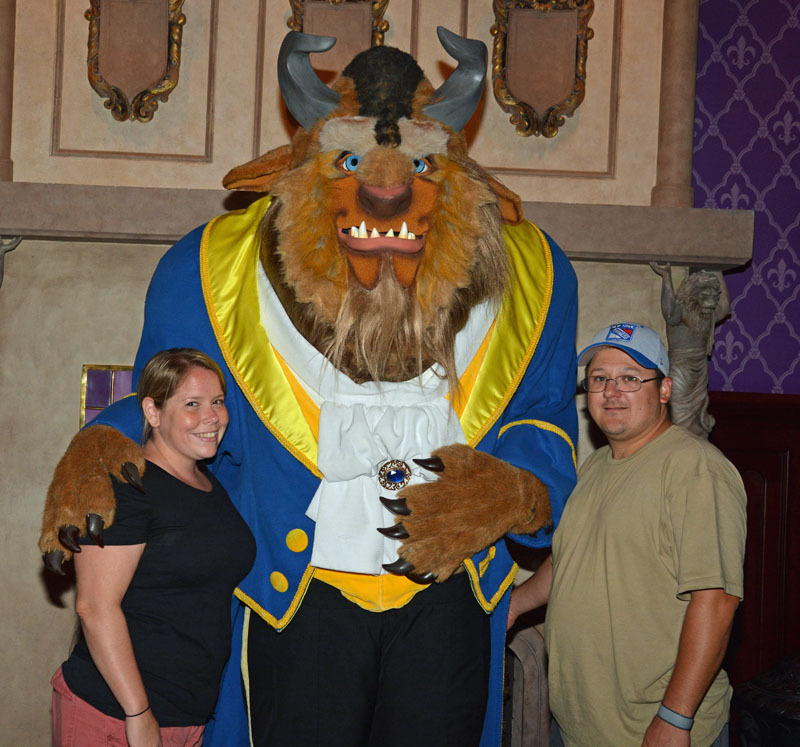 Kevin and Caitlin stayed in the park and later ate at the Be Our Guest and met the Beast. 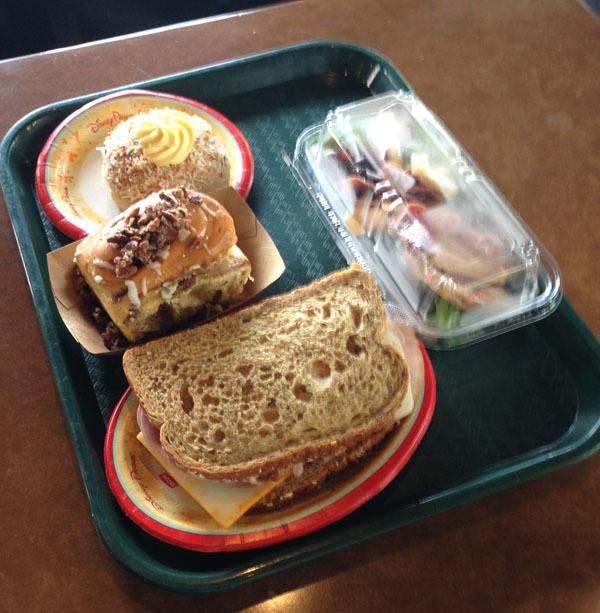 Lunch was back at Pop Century. I tried the Southwest burger, but it took 20 minutes to get it! At the station only were two people waiting in front of me. 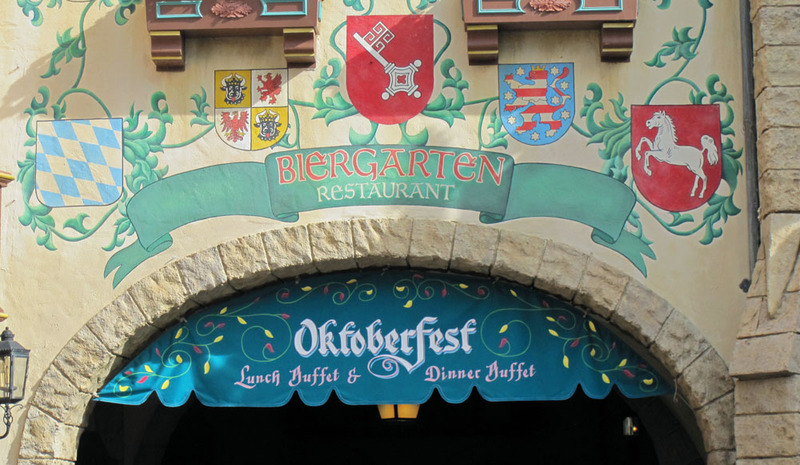 The cast member would only take one order at a time and then get the plate ready and the other guy would throw one pre-cooked hamburger onto the grill to heat it up; they both would stand around for a while before asking for the next order. Very frustrating. Kelli had pizza. We topped it off with a blueberry tart and a chocolate cake. 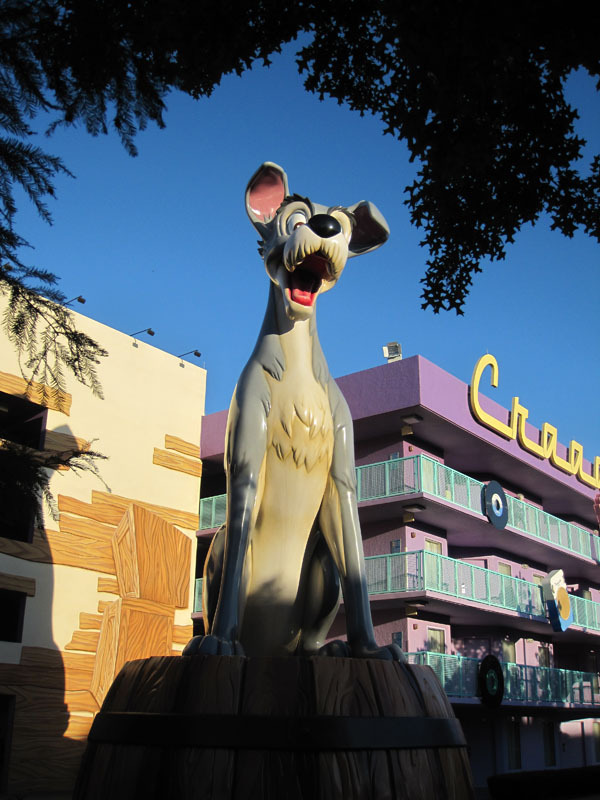 I took a walk around Pop Century and too a picture of each year around the lake, from 1950 to 1999. Each sign points out an interesting fact or two about the year. We had a brief dip in the pool before some heavy rains came. Kelli, Ann and Samantha decided to rest at the resort for the evening as some of us headed to Epcot and dinner at the Biergarten and elsewhere. 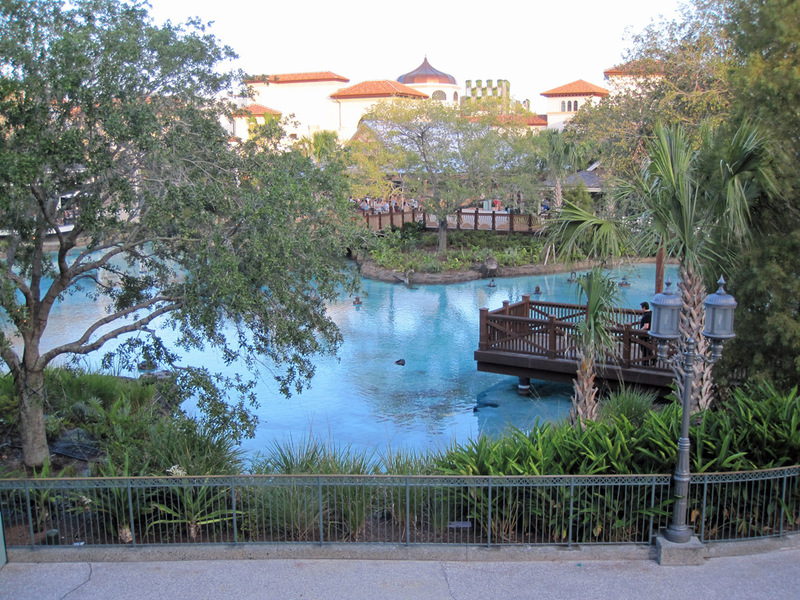 On the World Showcase Lagoon I spotted an Anhinga that had speared a fish and was making his way to shore near Norway. In Germany I stopped at Kunstarbeit in Kristall for a little something for Kelli. We did not wait long before being seated by Joelle our hostess. We were served by Yemmi. The buffet was good and Maddie and Hunter enjoyed dancing to the music with their moms. I tried the Schöfferhofer Pink Grapefruit Hefeweizen which is a mix of beer and grapefruit. It was good the first few sips but I did grow a little tired of it at the end. Meanwhile back at Pop; Kelli tried the Roast Beef and it was delicious. Kelli, Samantha and Ann fed the turtles on the bridge then walked over to the Art of Animation and toured the Cars section. They continued around the lake back to Pop. Ann later found a Great Blue Heron on the shoreline. This is our last full day. 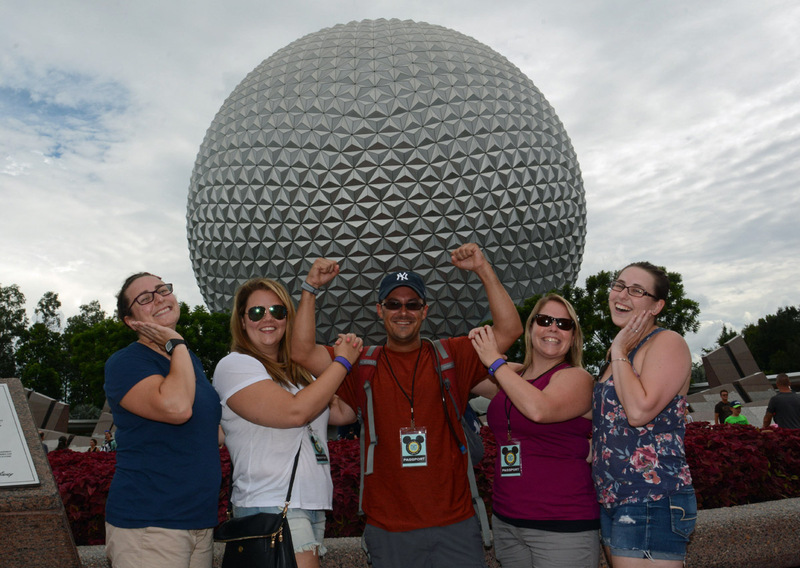 Ten of us will be doing the Keys to the Kingdom Tour (KTTK Tour) and others will head for Epcot to ride Frozen at rope drop. 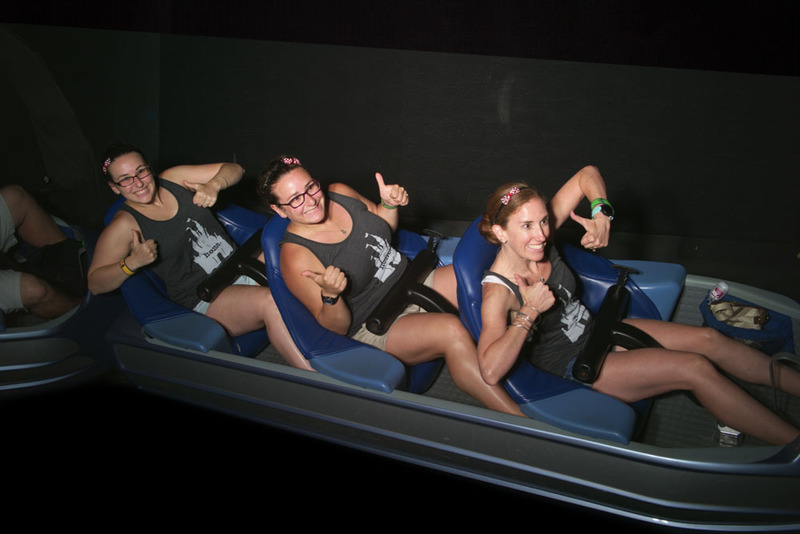 They also rode Test Track using the single rider line. 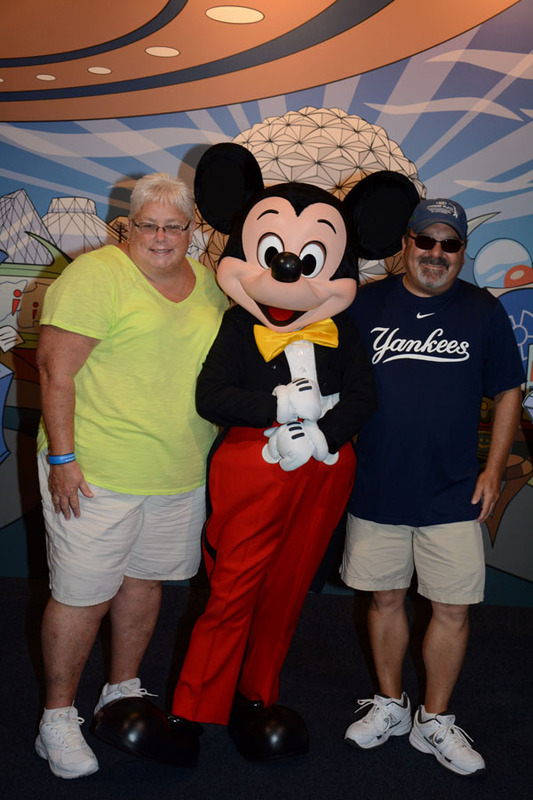 Patty and Paul went to Mickey and Friends. 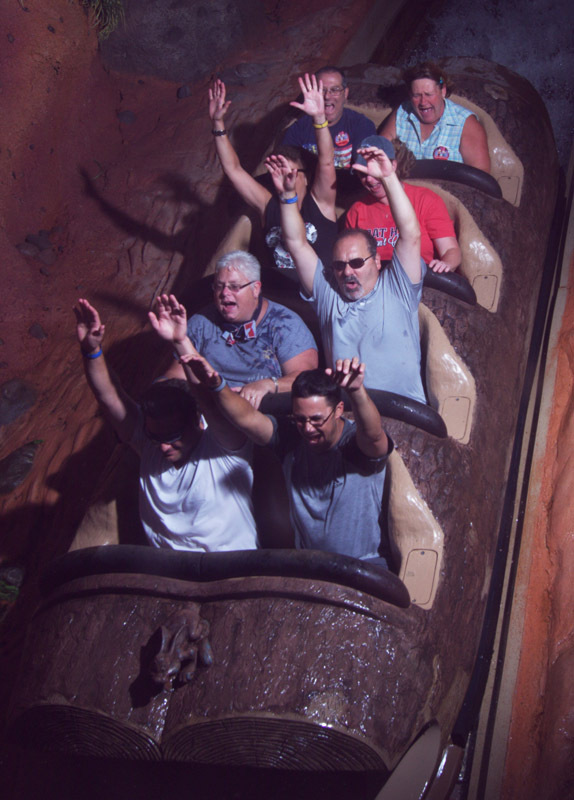 Some of the Epcot group headed back to the Magic Kingdom and rode Splash Mountain. 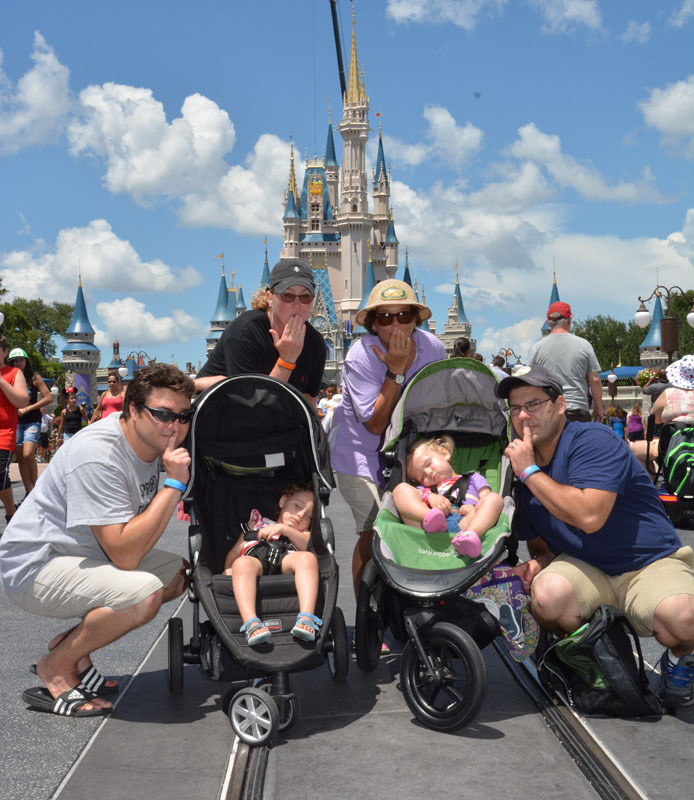 We have the 9:30 AM Keys to the Kingdom Tour so we had a little extra sleep. We fueled up on Pop French Toast and stayed for the 8 AM Twist song. They no longer dance in the food court, only in the store area. Five couples took the tour, Kelli B and I along with Rich Sr & Joan, Kevin & Caitlin, Kelli F & Evan and Katie & Sean. We got the discount by paying with Disney Visa so the cost was $72 each. 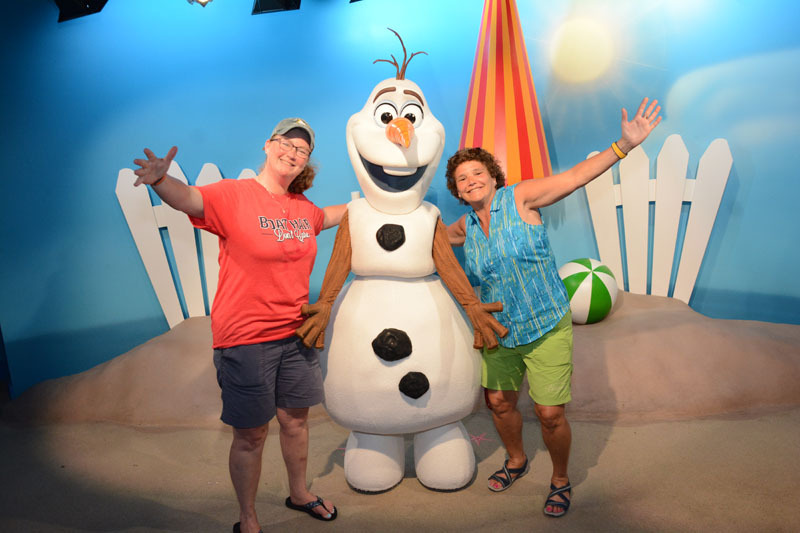 We all met in the Town Square Theater in the Magic Kingdom at 9. We had time so we explored the Nikon display featuring old cameras and some old pictures from when the Magic Kingdom had just opened. 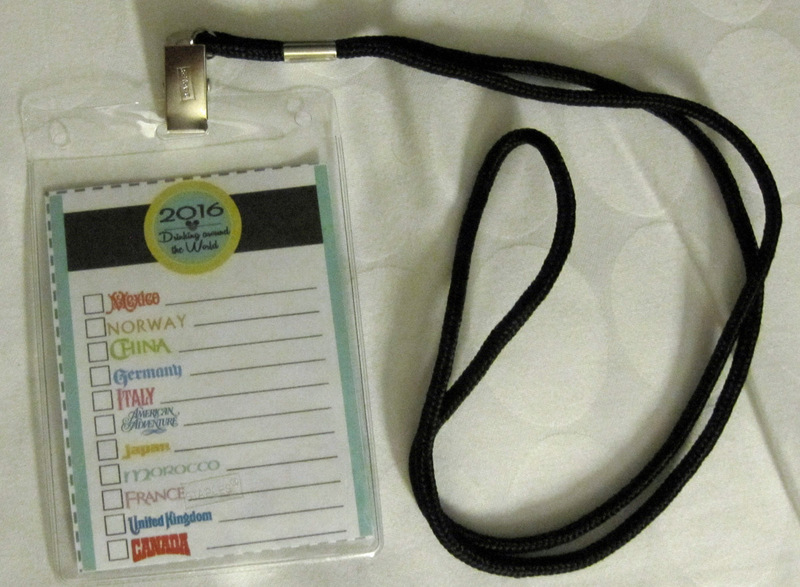 We checked in and put in our lunch order, then received our name tags, and the audio receiver to listen to our guide. 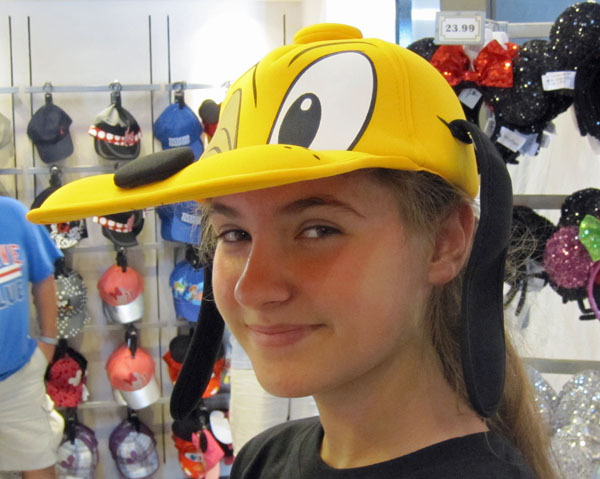 It fit very comfortable around the ear and was very clear. Bottles of water were also available. Lady and the Tramp was playing on the TV so we relaxed on the couches till the tour started. 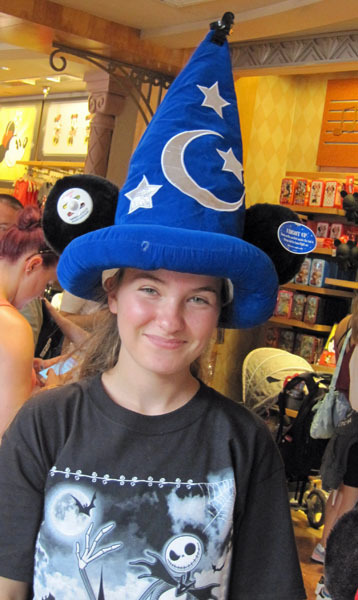 Our guide was Kaitlyn from Blue Bell, Pennsylvania, she was friendly and very knowledgeable. We started outside in the town square. I will tell you some of the things she mentioned, but there was a ton of little tidbits, stories and secrets which will not be revealed. You have to take the tour yourself. First we found out what “Keys to the Kingdom” really are. 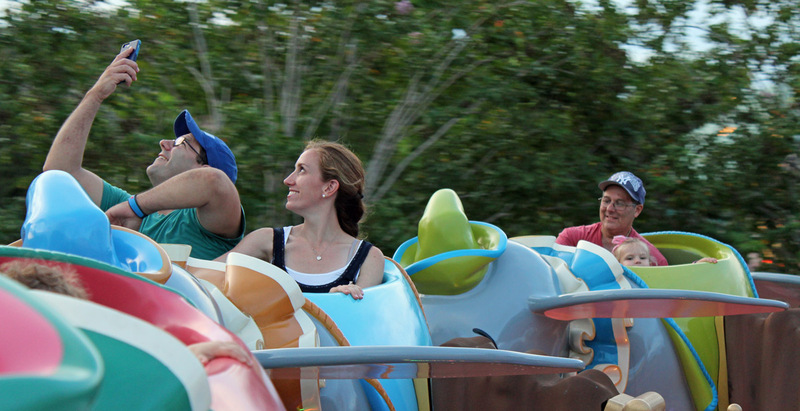 They are the four “keys” to customer service for the Walt Disney Company — Safety, Courtesy, Show, and Efficiency. Most of the discussions revolved around these. I like that the entrance to the park was similar to attending a movie premiere. 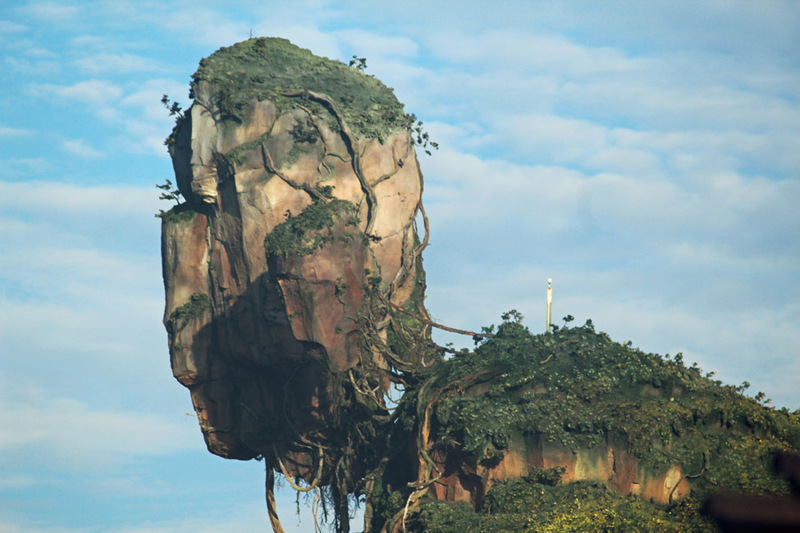 All of this show was intentional when the park was built. The train station acts like a curtain. As you walk under the station the curtain opens to reveal the Magic Kingdom. Underneath the train station, there are posters for the “coming attractions,” much like you’d see in a theater. There are popcorn vendors at the park entrance and the sidewalks are tinted red, as if it was a red carpet. The names on the windows of Main Street act like the credits that used to run before the movie. 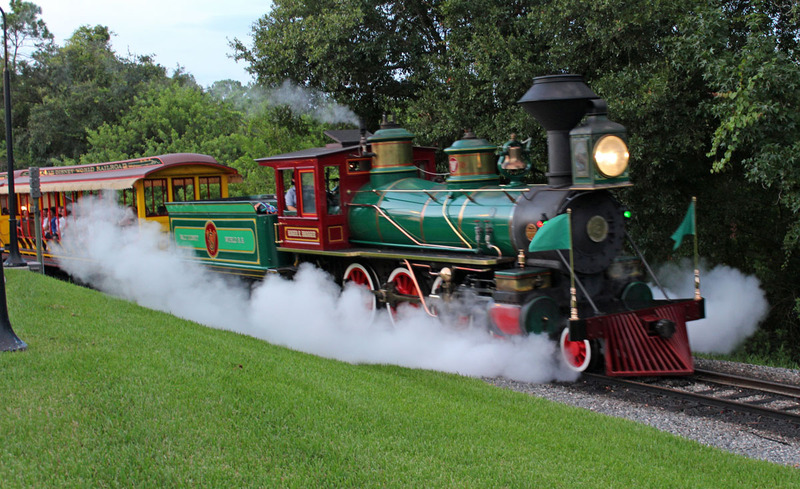 Each name is important to Disney and the creation of the theme park. I just recently watched Snow White and the Seven Dwarfs and yes, the credits run before the movie. One window was printed with M.T. Lott Real Estate Investments, one of the dummy companies used by Disney to buy up the land in secret, so that the price would not skyrocket. Later we saw Walt Disney’s name on a window above the Ice Cream shop, because he loved ice-cream and had it almost every day. His favorite flavor, plain old vanilla. One great example of safety, show and courtesy are the American Flags that line Main Street. They are not flags and are considered pennants as each may be missing a stripe or a star. Therefore, they are not technically “real” American flags, and skip the protocols in handling a real flag. They can be left up in the rain etc. Their real purpose, to disguise the lightning rods. 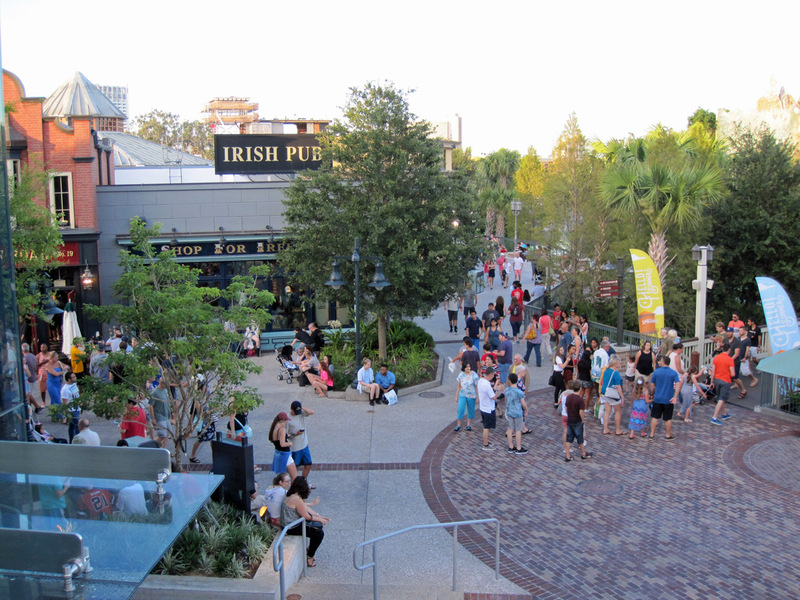 We headed for Adventureland and sat in the shade in the almost never opened Tortuga Tavern and heard more about the park. We had bathroom breaks throughout the tour and rested periodically. We entered the exit for the Jungle Cruise where our guide commandeered a boat. More secrets were revealed but two things I can mention. Trader Sam seen towards the end has red and white striped pants to pay homage to the original canvas that used to cover the boats when the attraction first opened. The other cool thing is they turned on the boat lights in the darkened temple to show all the details that the imageneers put into it for show, even though much if it can’t be seen clearly in the low light during a regular cruise. 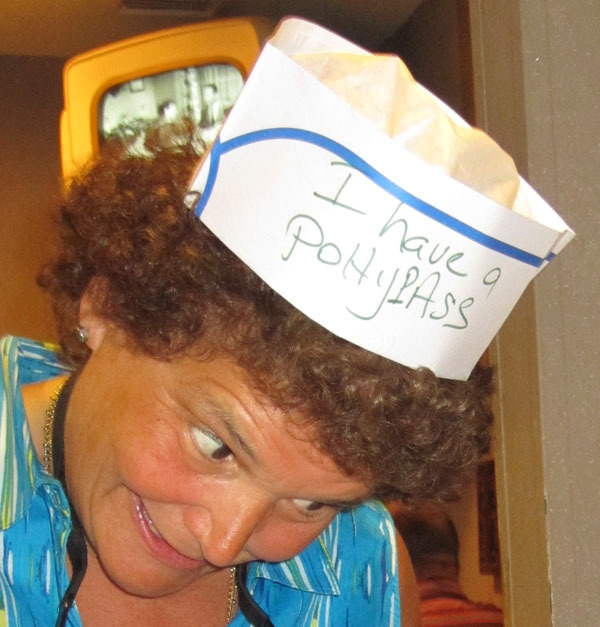 You never know when a guest might take a flash picture on the cruise, just like I did a couple of years ago. 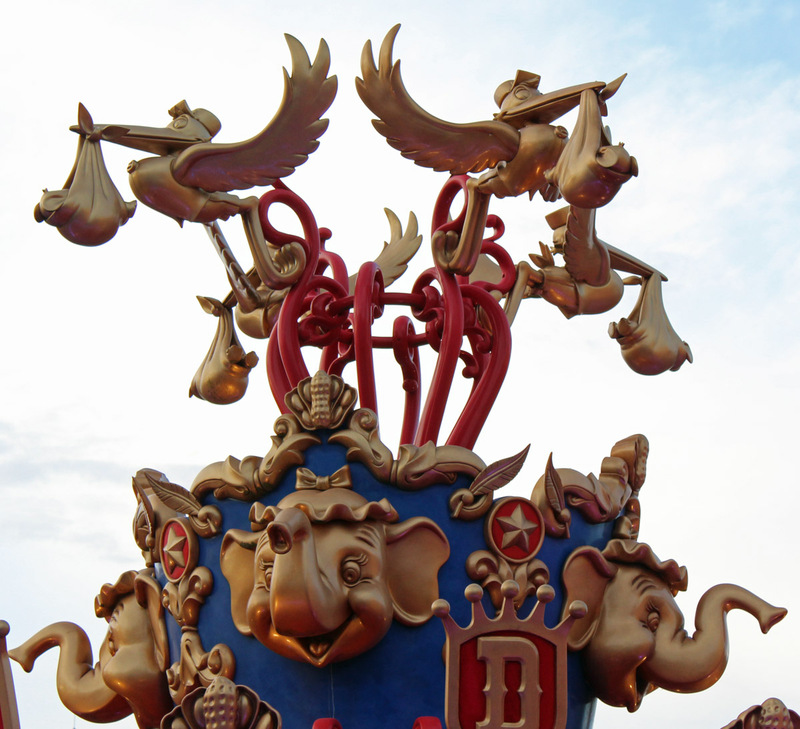 We went behind the scenes to the building that housed all the parade floats. 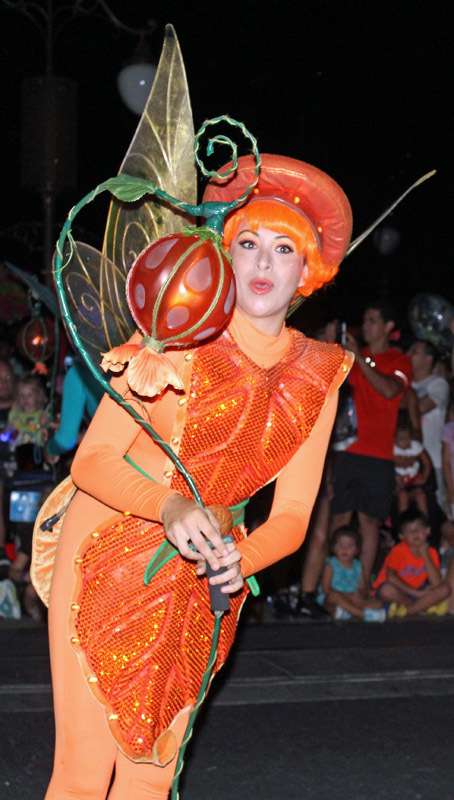 Performers were practicing for the upcoming Mickey’s Not so Scary Halloween Parade. We were seeing double and we will leave it at that. They have to have a ton of stamina as the float takes over twenty minutes to traverse the parade route all the time dancing and moving in choreographed moves. I also asked about the Headless Horseman and “his” horse that trots passed at the beginning of the parade. In Liberty Square the browner center bricks along the street simulate the sewage that used to run in the street before indoor plumbing. 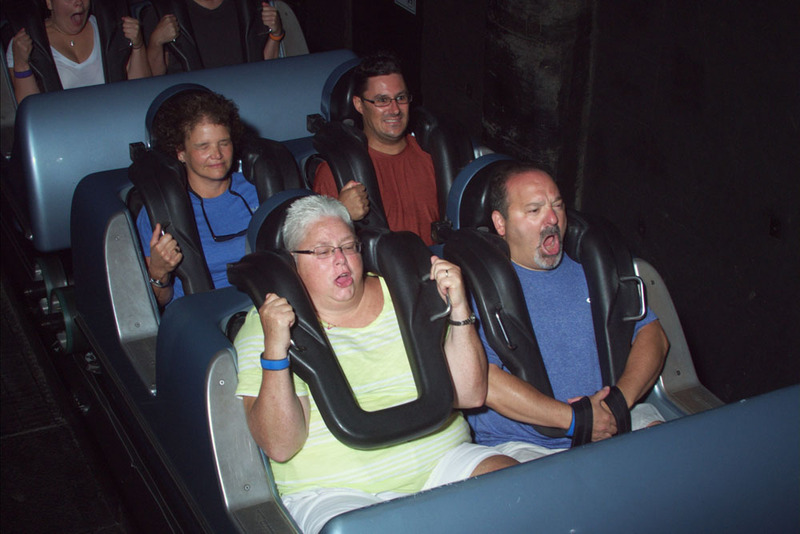 We then got to ride the Haunted Mansion with some of the effects explained. Next was lunch at the Tomorrowland Terrace and we received our exclusive Keys to the Kingdom pin. Afterwards, we crossed back into Fantasyland and through a door and down a couple flights of steps into the utilidoors, the series of tunnels that run beneath the park. We walked underneath the castle and came out behind the scenes near the foot of Main Street. The tour finished at 2:30 and we headed out. It was well worth the time and money. We relaxed and cooled off in the pool back at Pop. We tried the Rotisserie Chicken and Sesame Chicken for dinner and were again pleased with the meal. I finished it off with the famous tie-dyed cheesecake. 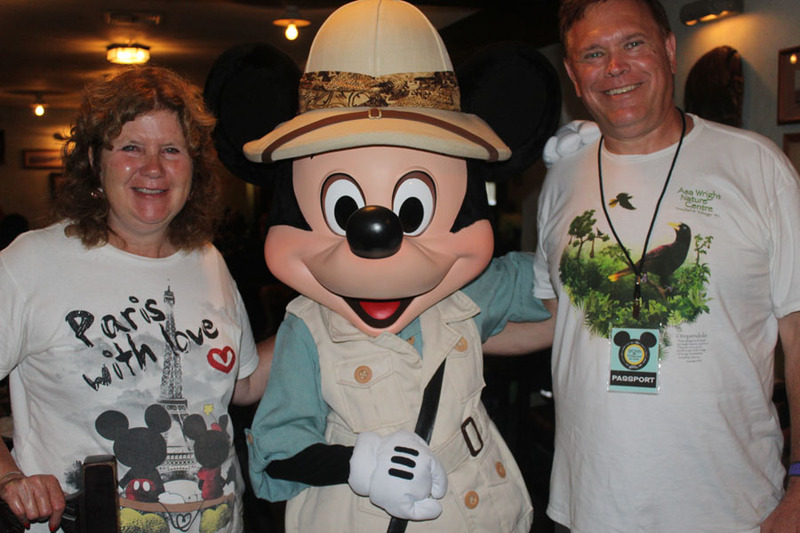 Rich Sr, Rich Jr, Marianne and I went to experience the Animal Kingdom at night. I left first. On the bus people sang to the Brady Bunch theme when it came on, the bus driver then got into it by singing phases and you had to guess the movie. Good fun. 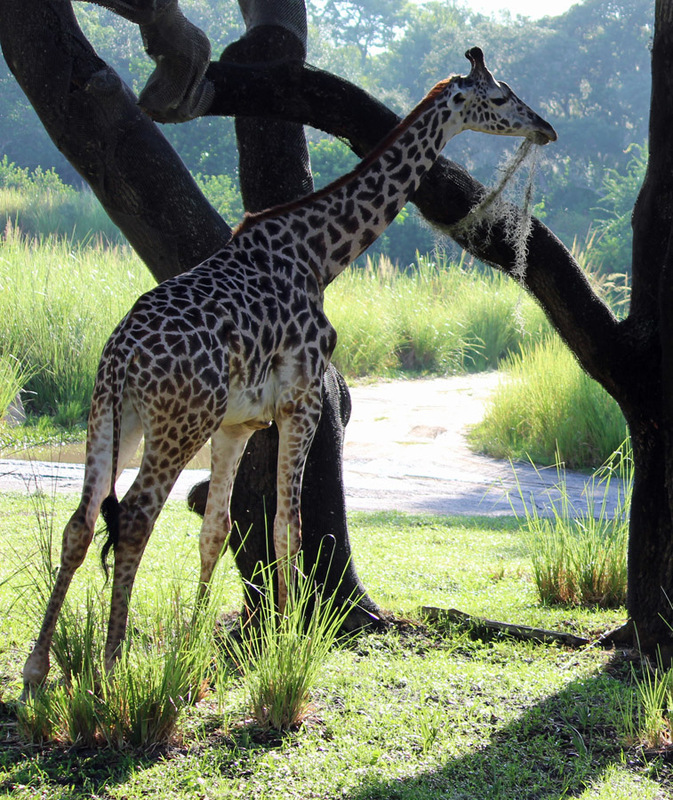 When I got to the Safari it had a 55 minute wait. As I waited for the others to arrive it went up to 70 minutes. I even saw people coming out of the standby line. 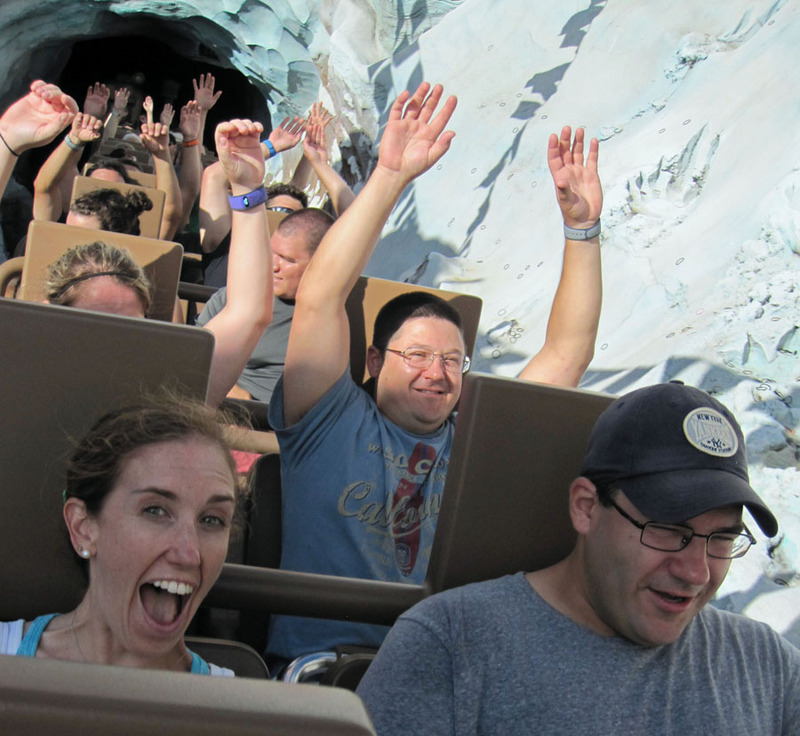 We decided to ride Everest. It had no wait so we rode twice in the dark. 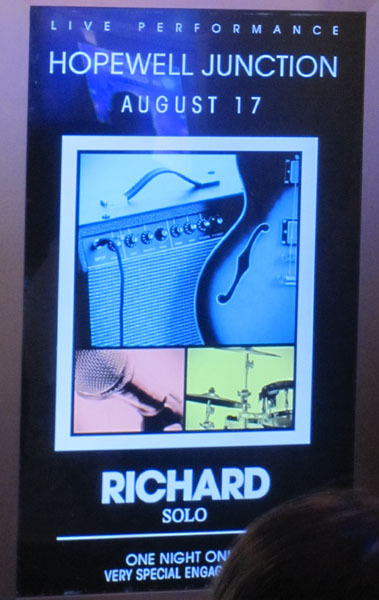 Richard’s name popped up on a billboard complete with moving bugs in the queue. 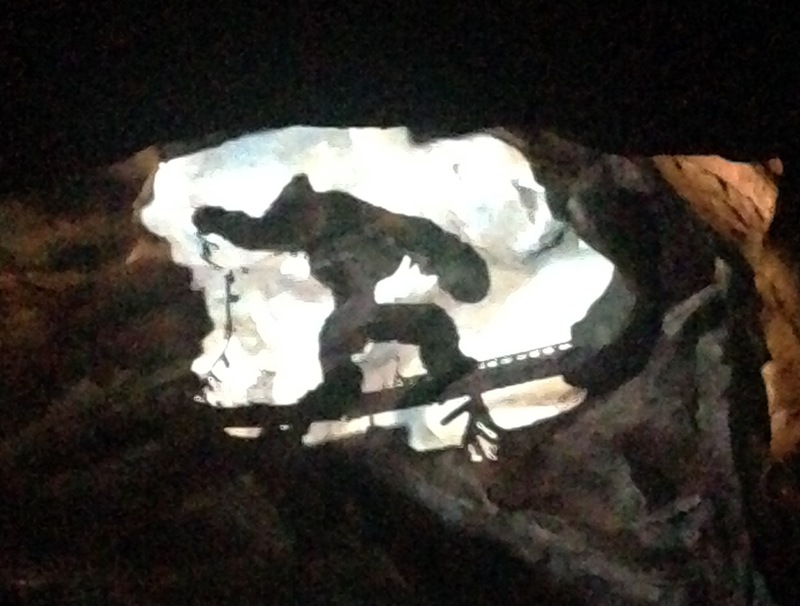 The Jungle Book show looked full so we passed on it. Rich Sr, Rich Jr and Marianne headed into the safari with a 70 minute wait still posted. I heard later they were on in 25. 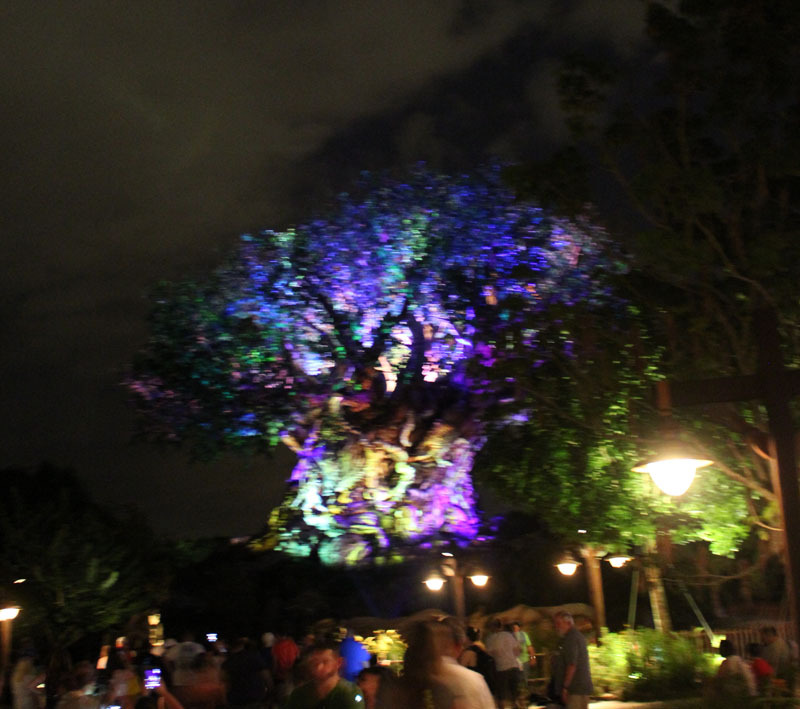 I headed for Discovery Island to see the Tree of Life Awakening show before leaving. It was nice but I wasn’t floored by it. Meanwhile back at Pop; Kelli, Ann, and Sam took Maddie and Joan out to feed turtles at sundown. I stopped into Everything Pop and grabbed a couple of vinylmations. It seems that the fad is fading and they may be the last we see. Today is our last day. 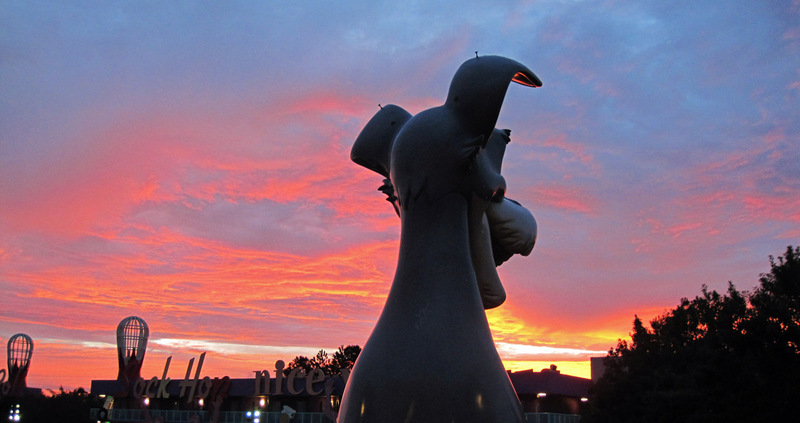 Some people have early flights, others like us will be able to visit a park in the morning before heading to the airport. Kevin and Caitlin have a very late flight and will be able to spend most of the day in a park. We met my sister Ann and our niece Samantha in the smoking area and walked over to the Airline check-in at the back of the main building. The line was small and check-in was a breeze. We then walked around to the front and checked our carry-on bags with bell services. We did some last minute shopping in Everything Pop. I purchased a mystery pin set and got a Donald and a Daisy pin, one for me and one for Kelli. Breakfast was French toast for both of us. We got to Epcot an hour after opening. I went through the no bags entrance and found out they were putting everyone through the metal detector. We did Soarin’ with a 25 minute wait. On our way out of the pavilion we met a very bold Great Egret in the pathways. 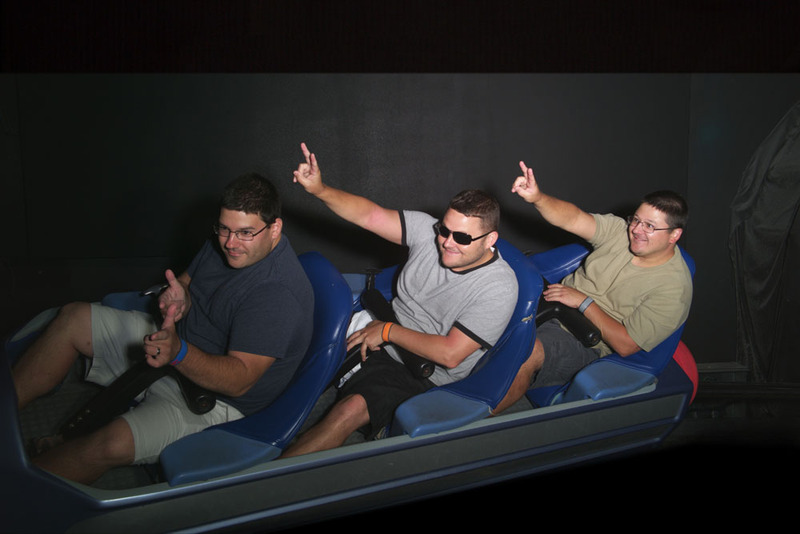 We then rode Spaceship Earth using Fastpass. 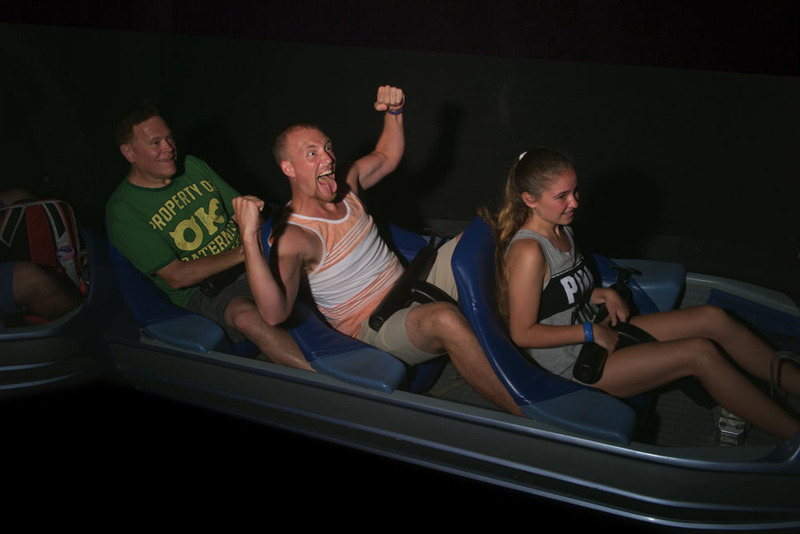 I convinced Samantha to try the Orange intense side for Mission: SPACE. 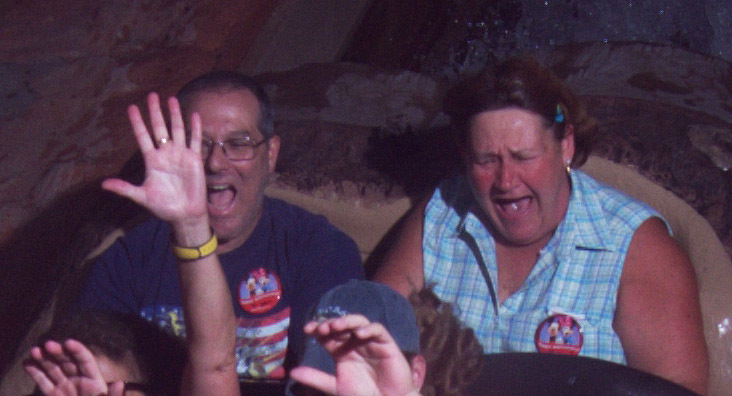 She was fine and loved the ride. 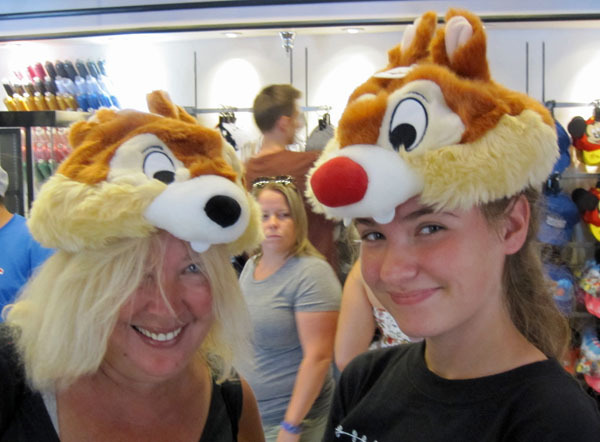 We met Kelli and Ann in Mouse Gears. 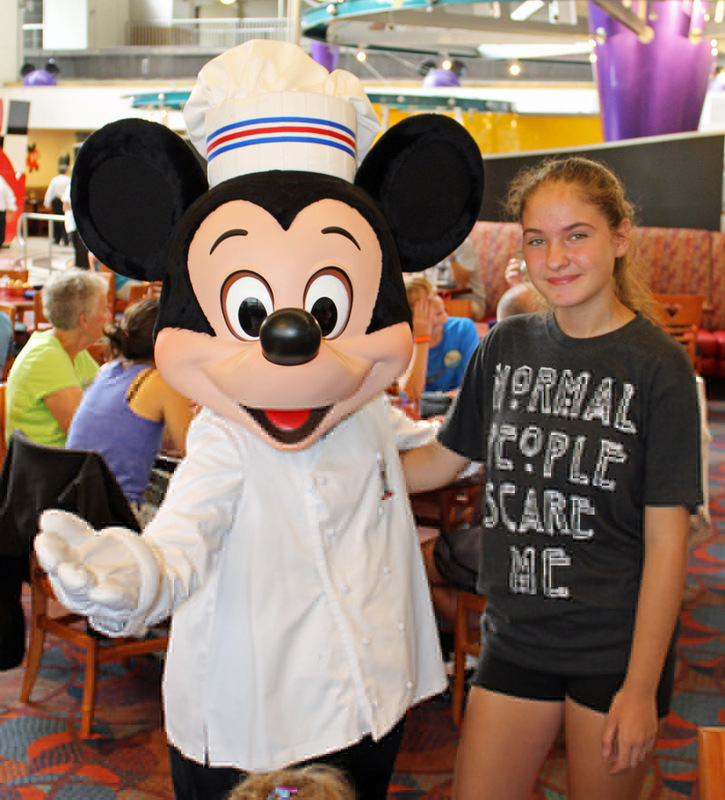 Ann bought a huge Mickey Mouse and will carry it onto the plane. 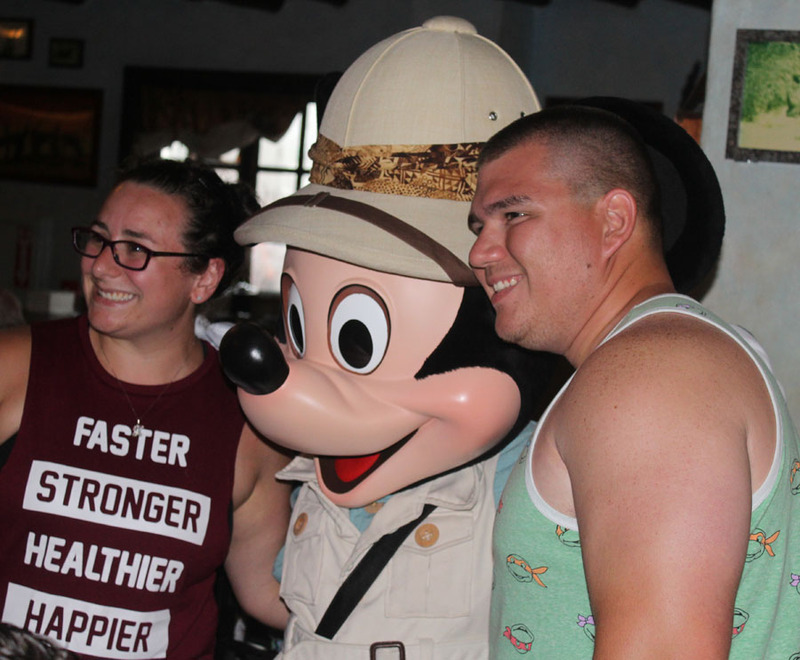 We found black t-shirts featuring Mickey and Minnie and the Main Street Electrical Parade. We went into Club Cool to taste the Coke products. Samantha unfortunately tried Beverly. 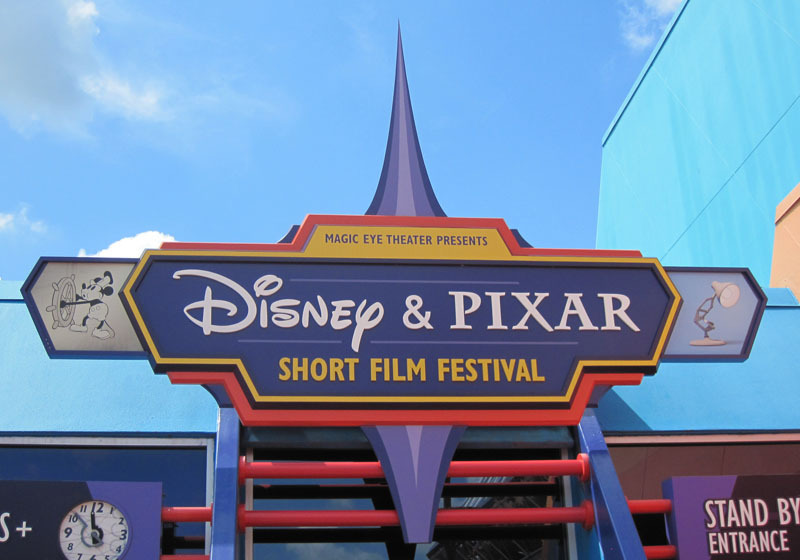 Our last attraction was Disney and Pixar Short Film Festival. This 4-D presentation of the Mickey short, “Get a Horse” along with Pixar’s “Laluna” and “For the Birds” delighted us all. It was then time to sadly leave. Our bus driver back again entered the wrong resort at Art of Animation, but simply took the resort road around the lake shared by Pop Century. Maybe it was intentional. 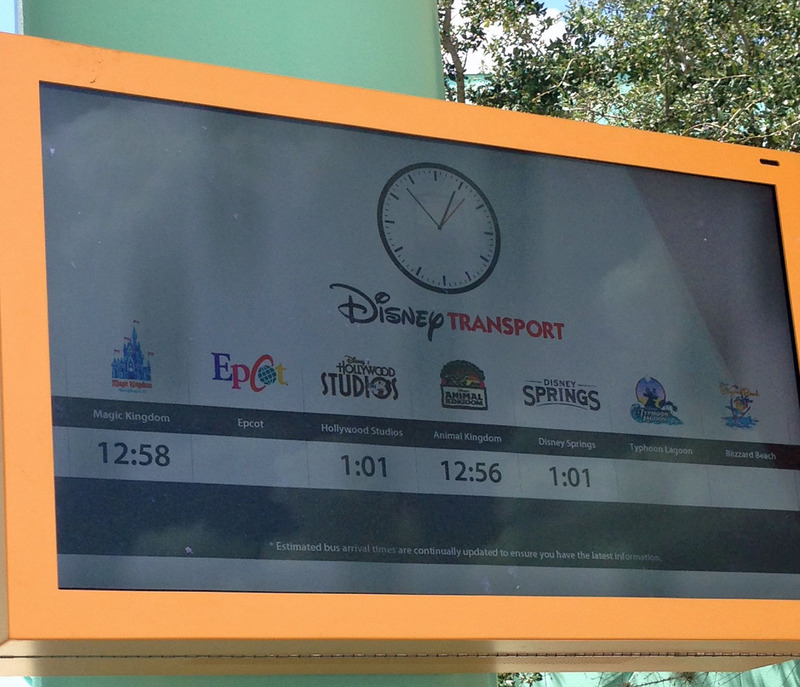 Back at Pop Century we saw that the bus wait signs were now up and running. They tell you how long the next bus will be arriving. We ate lunch. I again had the sesame chicken and Kelli the pizza. Disney Magical Express picked us up at 2:45 PM for our 6:00 PM flight. I had dinner by trying the takeout at On the Border. It took forever and I had to eat most of it on the plane. We arrived on time before 9 and were home shortly after as Scott picked us up at departures to avoid the traffic jam at arrivals. Others who were traveling were not so lucky. Tim, Marissa and Maddie had their flight delayed then cancelled but were able to snag the last three seats arriving at a different airport, Westchester, and were home two hours after us even through their original flight was two hours before ours. Rich Sr, Joan and Rich Jr had it worse. Their flight was cancelled and did not get home till the next morning! Yep, they slept in the airport. It was a great trip. 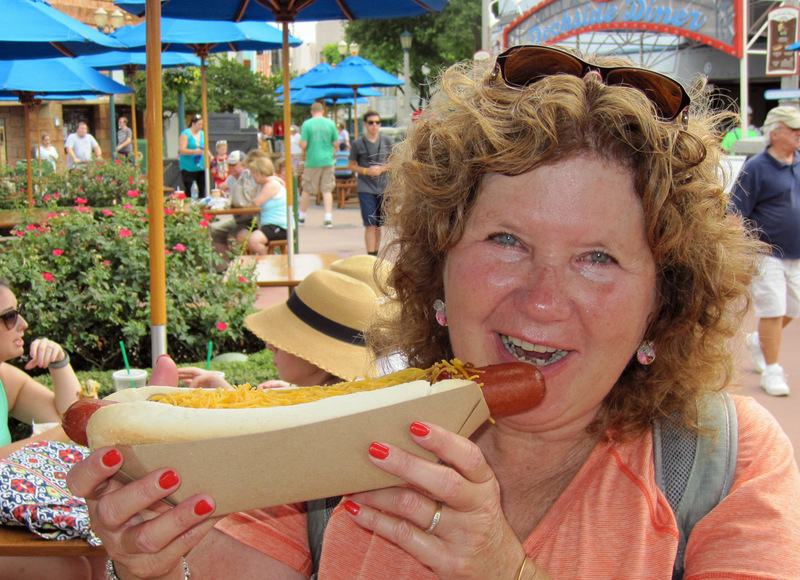 Kelli and I look forward to the next time when we go back next year for the Food and Wine Festival and to a more leisurely touring style. The Tables in Wonderland saved over $300. Sean and Katie got married in September and Kevin and Caitlin got engaged!